Lochaber High School in Fort William has become the first secondary school in Highland and the twelfth school in Scotland to receive a ‘Digital Schools Award’. 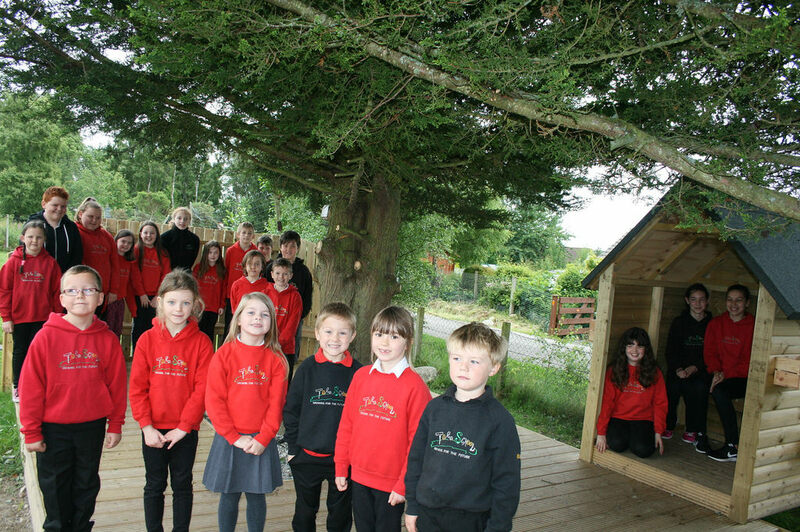 The Highland Council has awarded the contract for a new nursery extension at Ullapool Primary School to Morgan Sindall. 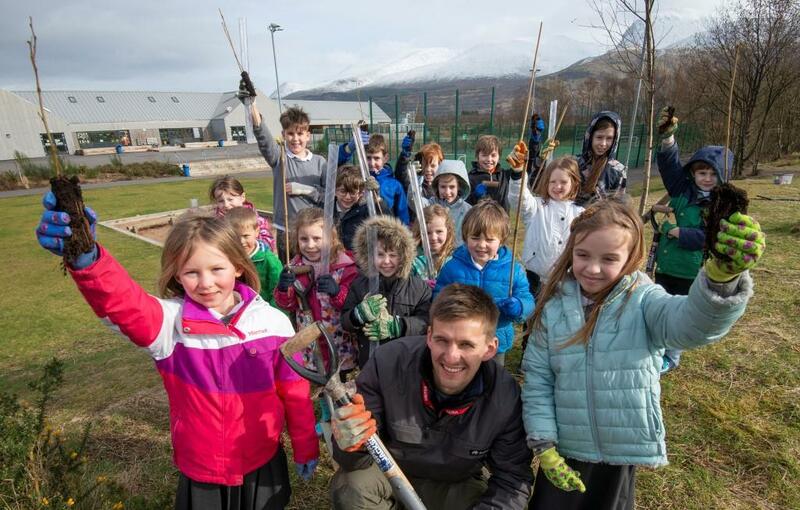 Highland primary school, Bun-sgoil Ghàidhlig Loch Abar, were delighted in their successful application for 30 free trees from Woodland Trust Scotland. 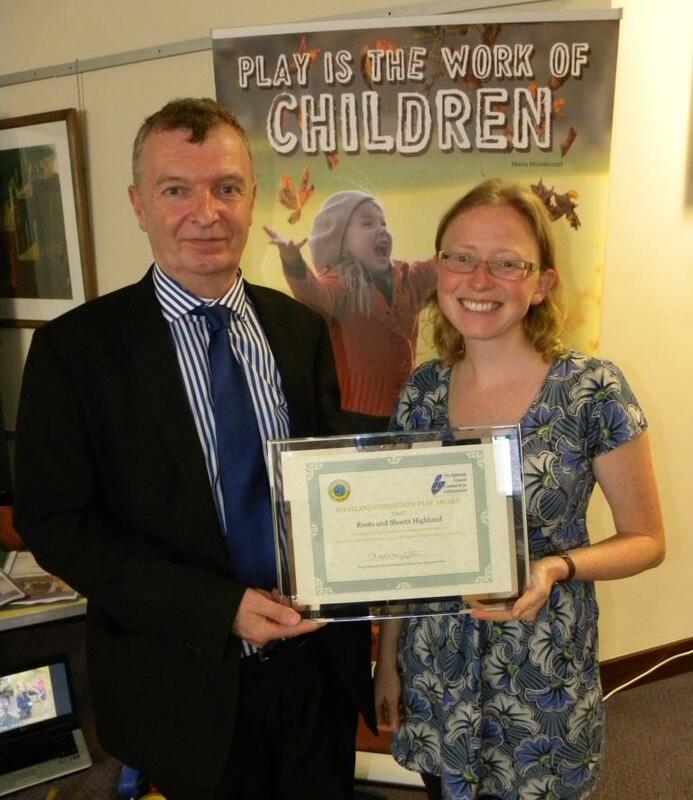 The Highland Council, in association with Play Highland, are offering an award of £1000 to the group, organisation or community that has done the most to promote benefits of play for children this year. 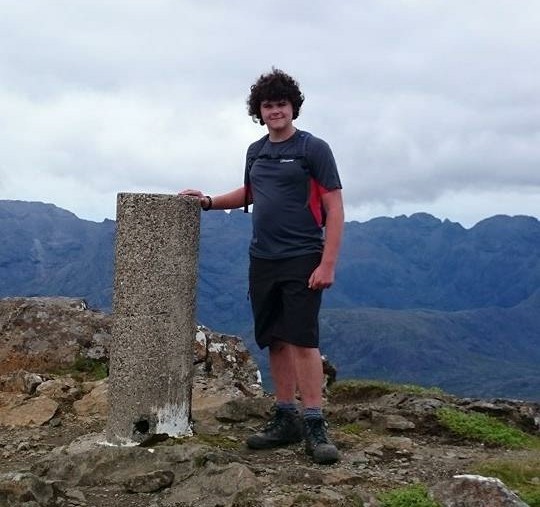 An Inverness pupil has received an award for achieving one of the highest marks in Scotland in the SQA Higher Geography 2018 exam. Three schools in the Highlands have brought a number of prestigious awards home from the 11th FilmG Awards. The Highland Council is ‘capping’ or limiting school rolls in some primary and secondary schools in Inverness for the 2019-20 academic session. Highland Council is to seek the views of local communities on a proposal to establish a Gaelic Medium catchment area for Mallaig Primary School. 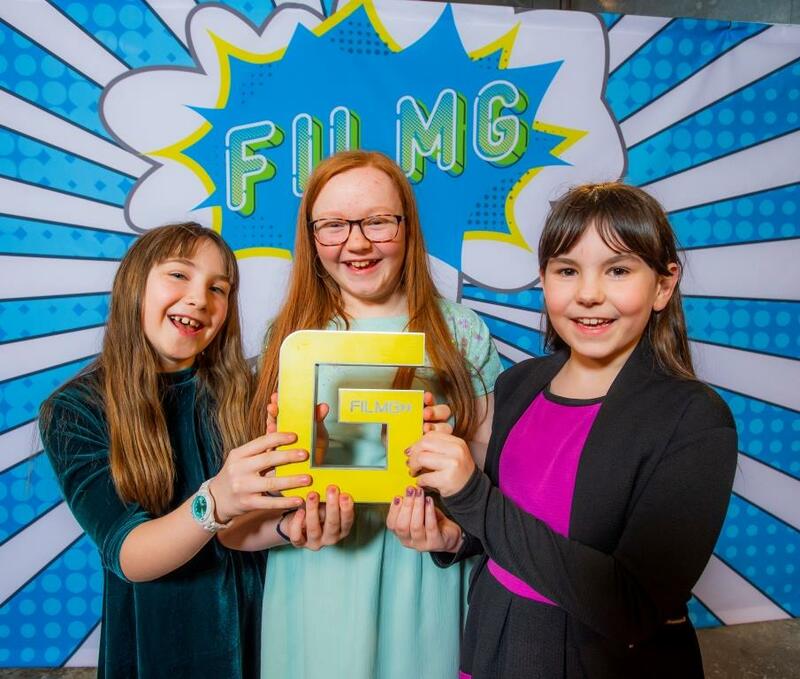 FilmG, MG ALBA’s Gaelic Short Film Competition, has announced the shortlists for this year’s competition with young filmmakers, community groups and school groups from around the country making the shortlist. The Highland Council can confirm that Merkinch Primary will open as normal on Friday 10 January. The Gaelic Medium education team at Craighill Primary School in Tain will be hosting an open morning on Tuesday 15 January for any parents or carers keen to find out more about enrolling their child. The Highland Council’s Gaelic Team recently organised drama and Gaelic music workshops at Lochcarron Primary School. 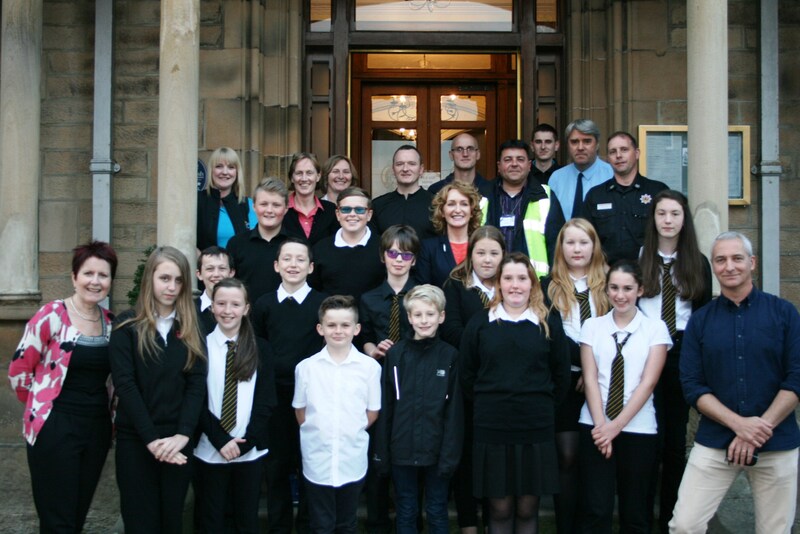 Young people from eleven schools across Highland had the opportunity to engage with local businesses at the Kingsmills Hotel in Inverness on 11 December 2018. 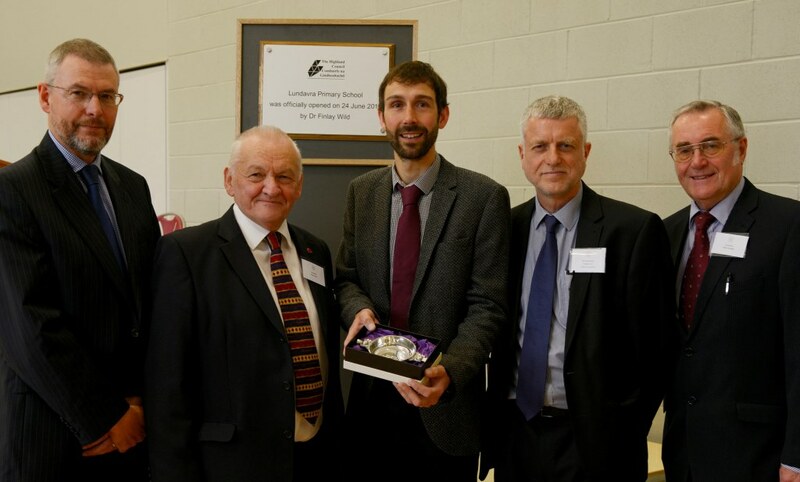 The Highland Council has welcomed the news that the Caol Joint Campus, in Fort William, has received the ‘Best Pupil/Student Experience’ award in the Education Buildings Scotland Awards, 2018. Twenty nine members of The Highland Council’s Care and Learning team have celebrated their success in completing the Council’s 15 month ‘Lead On’ programme. Pupils from Raigmore Primary School in Inverness have taken the lead in a bid to address bullying after taking part in specially designed workshops as part of this year’s anti-bullying campaign. Pupils, staff and parents of Culloden Academy have made a significant donation to the Blythswood Highland Food Bank which will help feed families in Inverness over Christmas and into January 2019. The Highland Council’s Education Authority has considered the Scottish Government’s report on Achievement of Curriculum for Excellence Levels 2017/18 published this week. Eight people from the Highlands will be inducted as student inductees this week (Wed 12 December) and could be teaching STEM subjects in Highland secondary schools by August 2020. The work of Highland Council’s Care and Learning Service to provide sustainable, quality education in Highland communities was further endorsed yesterday. ​​​​​​​Half century of schooling to be celebrated with new nursery opening. Pupils from Dalneigh Primary in Inverness joined Cllr Alex Graham earlier today (Monday 3 December) to help cut the turf for an extension at the school. The contract to build a brand new secondary school for Alness Academy has been awarded and the project is under way. Schools across the Highlands have been awarded a prestigious national award from sportscotland, the national agency for sport, for this academic year. The Highland Council, and the Highland Alcohol and Drugs Partnership launch their “Substance Aware School Award” this Alcohol Awareness Week 19th - 23rd November 2018. Nicky Grant has been appointed by The Highland Council as Head Teacher of the 431-pupil Alness Academy in Ross and Cromarty. The Chair of The Highland Council’s Care, Learning and Housing Committee has congratulated Bishop Eden’s Primary School in Inverness on their latest inspection report by Education Scotland. Head Teacher of Milton of Leys Primary School, Robert Quigley, has been nominated as Cyber Security Teacher of the Year for the Scottish Cyber Awards, 2018. Pupils and staff at Inverness High school are celebrating the completion of the first phase of works of their newly refurbished building this week. Interested in returning to teaching? Highland Council is to seek the views of local communities on a proposal to establish a Gaelic Medium catchment area for Ullapool Primary School. Members of The Highland Council’s Care, Learning and Housing Committee have today (18 October 2018) congratulated Ceitidh Campbell for winning the Comunn Gàidhealach Gold Medal. Success at the Mòd for Clann Thròndairnis from Skye. 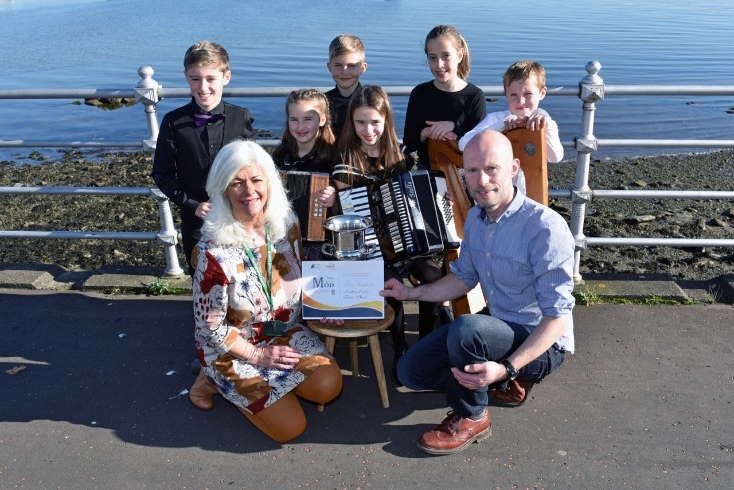 Clann Thròndairnis from Skye won top prize in the Folk Group Competition for Under 13 year olds at the Royal National Mòd in Dunoon which was formally opened last Friday. 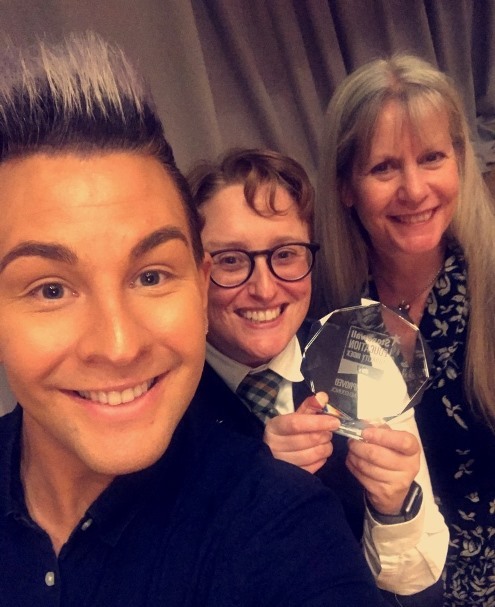 Nairn Academy are delighted to have been awarded the LGBT Bronze Charter Award by LGBT Youth Scotland which recognises the school’s work on equality. 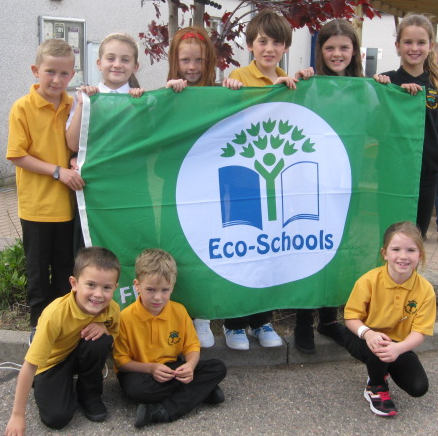 Pupils at Balloch Primary School, Inverness are delighted to hear that they had been awarded Green Flag status for the tenth year. 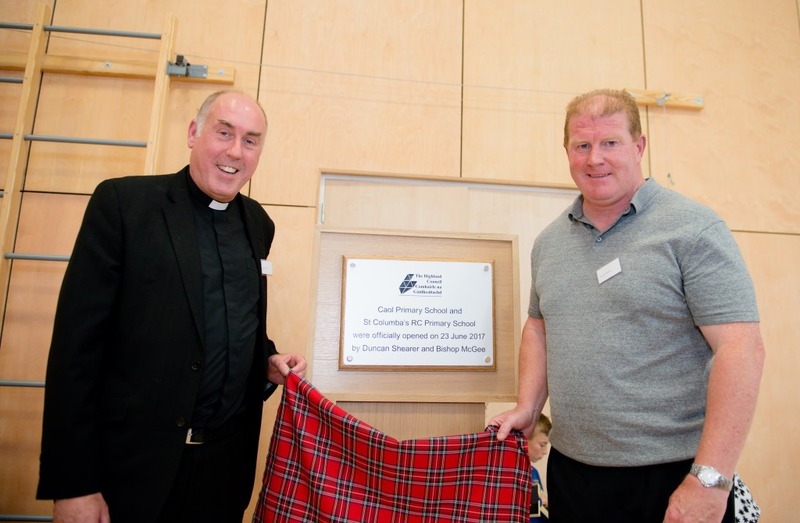 The Highland Council in partnership with the Scottish Government officially opened the new Gaelic Medium School at Portree today (Monday 3 September 2018). The Highland Council has paid tribute to the sudden death of Mrs Alison Martin Hodgson, Primary 5 class Teacher at Lochardil Primary who died earlier this week in hospital. 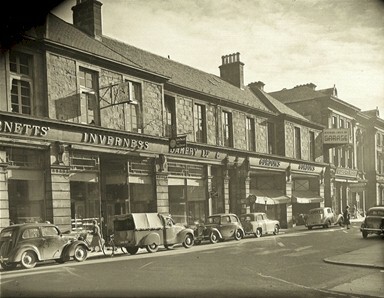 Views are being invited on the development of a new gateway to the city of Inverness at Torvean. Iomain Cholmcille is delighted to announce funding of £8000 from Bòrd na Gàidhlig in order to help develop the use of Gaelic in youth shinty. Caithness Councillors have welcomed information that shows progress being made in respect of destinations of pupils on leaving Wick High School in recent years. Progress on the development of the ground-breaking Science Skills Academy initiative in Highland has been welcomed by Members of The Highland Council’s Care, Learning and Housing Committee. A proposal to set a fixed school holiday for the first 2 weeks in April each year from 2019 onwards will go out to consultation by The Highland Council’s Care and Learning Service. Members of The Highland Council’s Care, Learning and Housing Committee have agreed for the Council to conduct a statutory consultation on a proposal to discontinue the provision of education at Altnaharra Primary School and to formally close the school. One hundred and nineteen probationer teachers were recently welcomed to the Highlands (on Friday 17 August) at an Induction Course held in Smithton Free Church Hall. 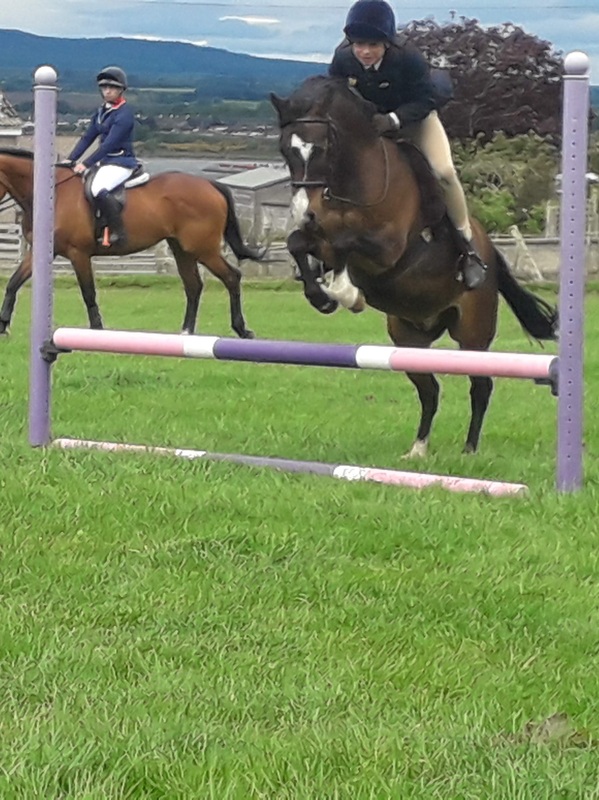 At today’s Ross and Cromarty Committee (15th August 2018), it was highlighted that the Ross and Cromarty Educational Trust reward opportunities have not been made full use of in the previous year. Councillors have commended the work being done to mark the Year of Young People in Ross and Cromarty. 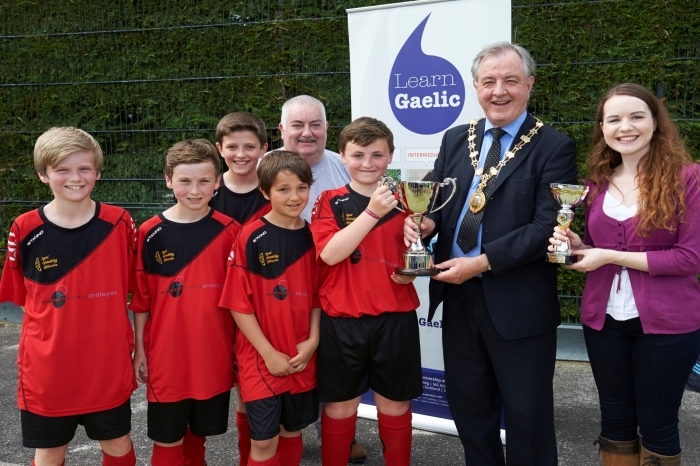 The Highland Council Gaelic team organised Gaelic medium activities for children and young people during July and August. Still time to make that career change into Secondary Education Teaching. Information evening on Tuesday 14 August 2018 from 5:30pm - 7pm at the University of Highlands and Islands, Inverness College, Inverness Campus IV2 5NA. Young people across the Highlands are receiving their SQA exam results by text, e-mail or post today (7th August 2018). Despite the challenges of serving Scotland’s largest council area, which includes some of the most sparsely populated areas of the UK, Highland Council is celebrating after achieving the Soil Association Scotland’s Silver and Bronze Food for Life Served Here award in its primary schools and nurseries for the ninth year running. New learning and bonding opportunities have become available for families who have a parent in Inverness Prison. The Highland Council is pleased to announce the recent appointment of 5 Head and 10 Acting Head Teachers across the region’s schools. Want a career shift? Thinking of teaching? 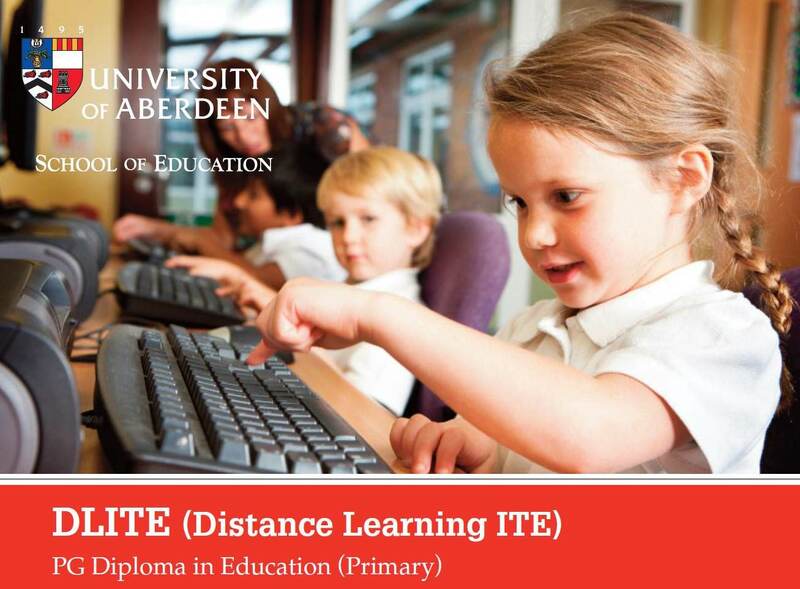 People looking for a career change and thinking of teaching in primary or secondary schools are being encouraged by The Highland Council and The University of Aberdeen to consider a distance learning course (DLITE). Nine Highland students graduated this weekend (Saturday 23 June) through the University of Aberdeen in partnership with Highland Council following an eighteen month distance learning PGDE (Primary) Programme. The Highland Council is pleased to announce the recent appointment of 8 Head and 4 Acting Head Teachers across the region’s schools in the north and south education areas. Everyone in Highland is asked to keep their Eyes Open for children at risk during the school holidays. The financial support available for many families in Highland towards the costs of school clothing has been increased from £90 per pupil per annum to £140 from academic year 2018/19. 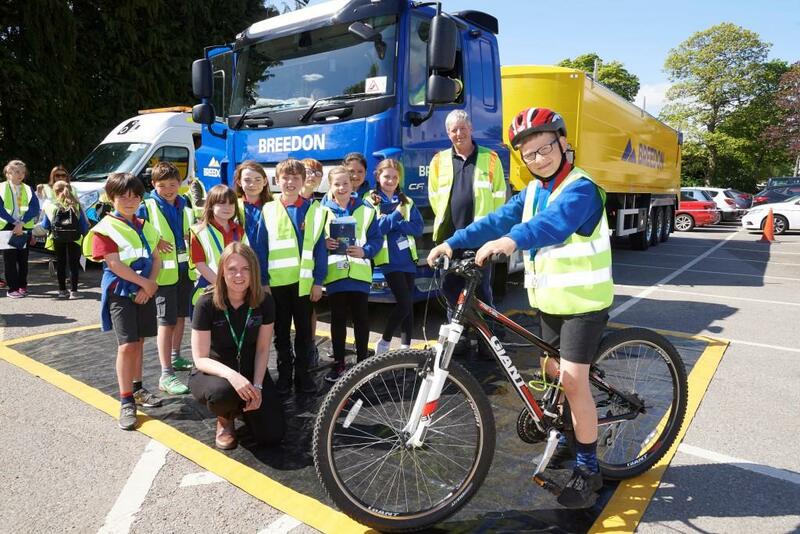 School pupils in Inverness were treated to the sight of an electric car being driven into the playground as they took part in an event to mark Clean Air Day. Parents of pupils at an Inverness primary school recently received help and advice at an online safety awareness session run by The Highland Council. 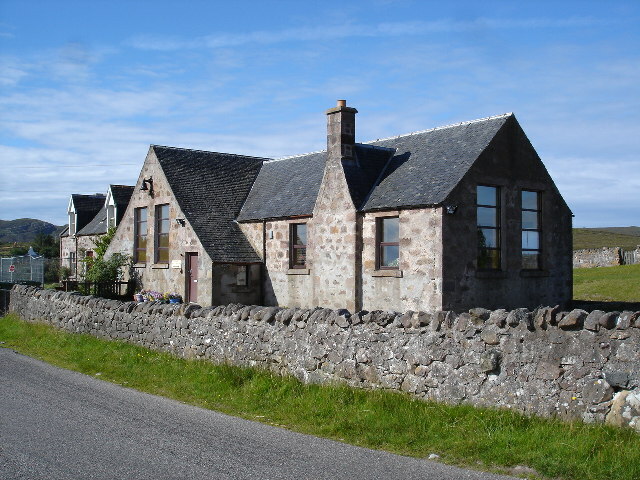 The Highland Council is currently advertising a Principal Teacher vacancy at Muck Primary school on the Island of Muck - the southernmost island of the Small Isles in Lochaber. Today (Thursday 14 June) at the High Life Highland, Highland Youth Parliament (HYP) Annual Conference, The Highland Council launched their new ‘Positive Relationships and Bullying Prevention Policy and Guidance’. This is the first Care and Learning Policy which has been developed by young people across Highland from initial consultation through to its launch. A morning of fun and festivities for the local community will mark the official opening of the East Caithness Community Campus on Saturday 16 June 2018. From the 11th June 2018 Grantown Library and Service Point will be changing its service provision to the local community. Since its relocation to the Courthouse, Grantown Library has seen a significant increase in demand for its services. Library and Service Point staff are co-located in the Courthouse. 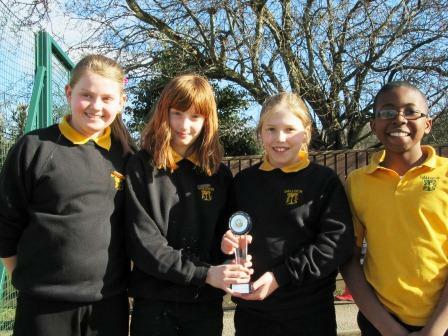 “Our sports days this year were all about enjoyment and participation. At Merkinch we encourage our children to make healthy, happy choices. The trial expansion of early learning and childcare in 6 centres in Highland was welcomed by Members of Highland Council’s Care, Learning and Housing Committee today (30 May). 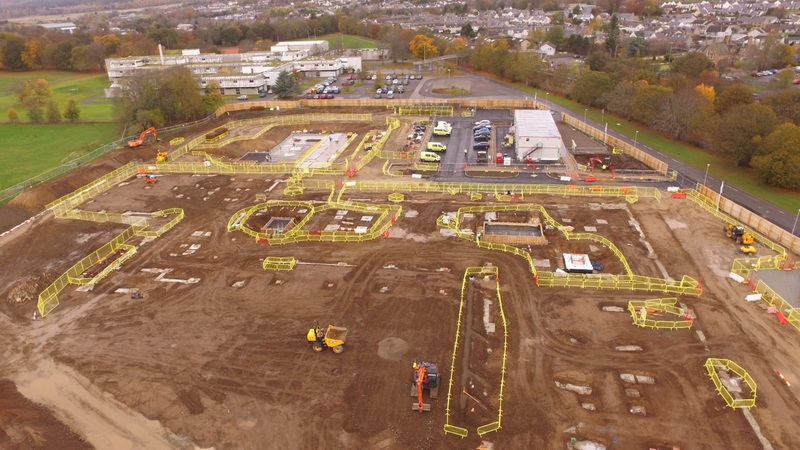 The building of a new primary school to the south of Inverness has taken a major step forward. The work of Highland Council’s Care and Learning Service to provide sustainable quality education in Highland communities was further endorsed today by members of the Council’s Care, Learning and Housing Committee. The Highland Council is to seek the views of local communities on a proposal to establish a new 3-18 campus in Tain, to replace the existing Tain Royal Academy, Craighill Primary School, Knockbreck Primary School and St. Duthus Special School. Looking for a career change into Secondary Education Teaching? An Information Evening about this exciting new Programme will be held on Tuesday 12 June 2018 from 5.30 - 7 pm at the University of Highlands and Islands, Inverness College, Inverness Campus IV2 5NA. 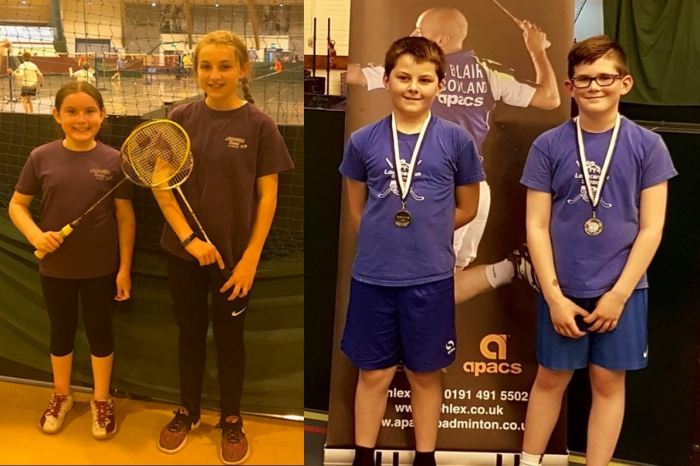 Silver and bronze medals were brought home to Highlands schools for badminton by pupils at Lochcarron and Lochardil Primaries. 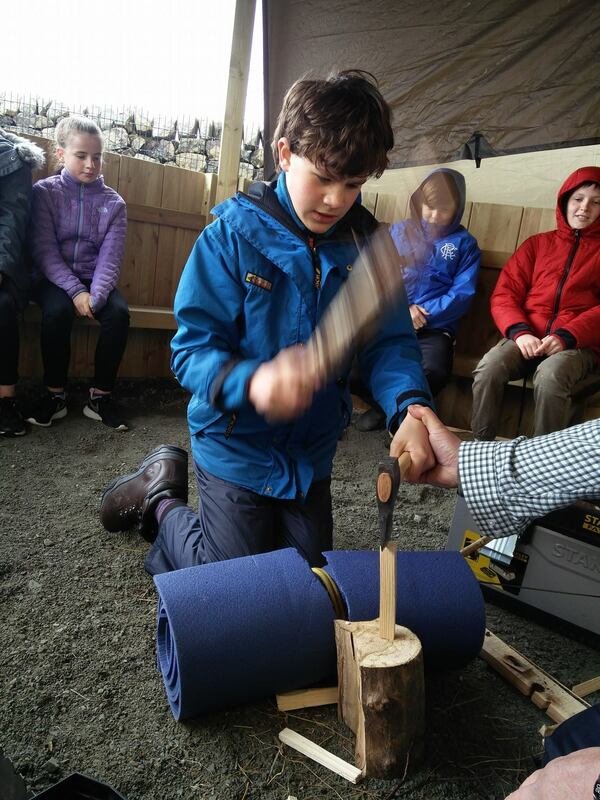 A large number of Skye’s school pupils got involved in outdoor activities on the 9th and 10th of May when the team of Spòrs Gàidhlig visited Portree. Signs of the times in Highland. To mark Deaf Awareness Week (14 – 20 May 2018), The Highland Council has launched an innovative pack for learning British Sign Language in Primary Schools. A number of Primary Schools in The Highland Council area are marking the marriage of Prince Harry and Meghan Markle which is taking place on Saturday 19 May 2018. 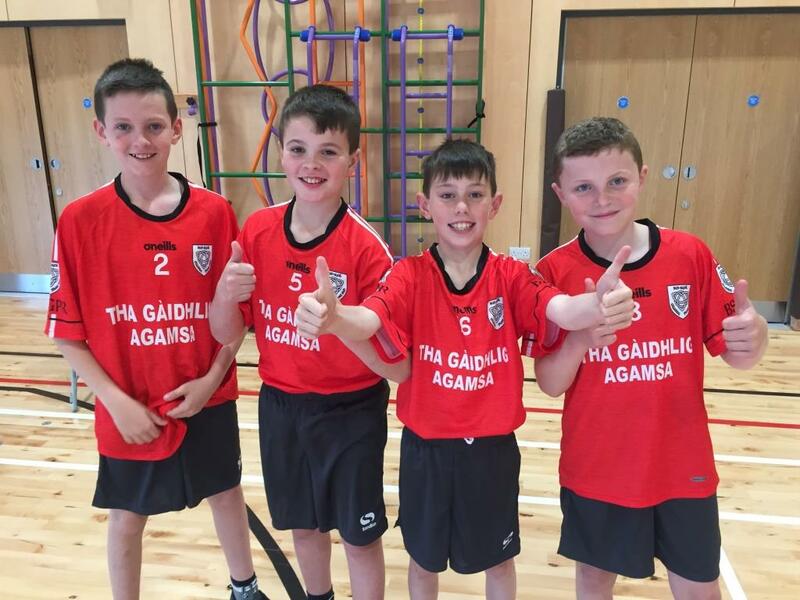 There has been a huge increase in the numbers taking part in Cuach na Cloinne over the 12 years since it was established and the 2018 competition will be the biggest ever with 78 teams across 38 schools participating. Pupils, parents and teachers celebrated the start of the summer term today (Monday 16 April 2018) at the newly opened Bun-Sgoil Ghàidhlig Phort Rìgh. 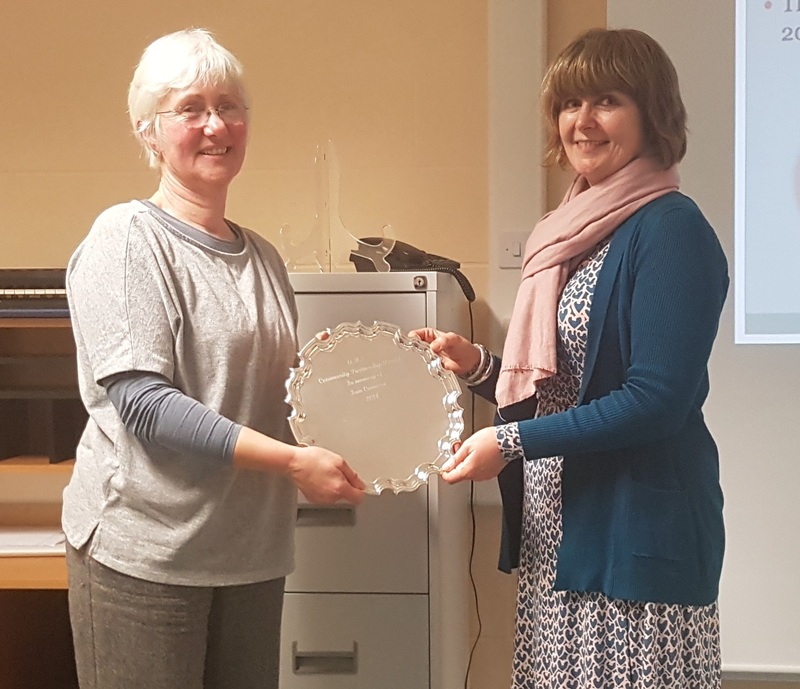 An Ardnamurchan High School Teacher, Mrs Wendy Green was recently awarded the Iain Cameron Partnership Award for 2018. Highland Council has reviewed prices for letting school facilities and has introduced some changes from 1 April 2018. The Council is to progress a further review and consultation on two site options; Tain Craighill and Tain Royal Academy. Bill Alexander, Director of Care and Learning, has announced his intention to retire from The Highland Council. 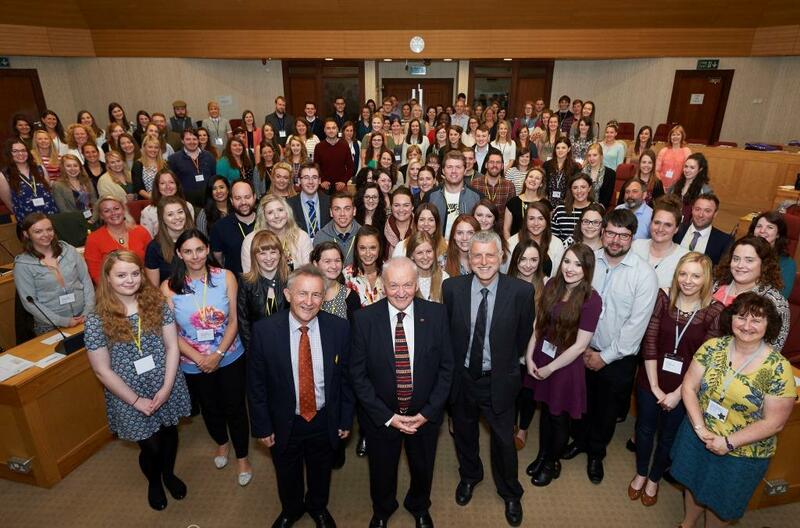 The 12th Highland Youth Parliament Apprentice Day is being held today Tuesday, 20th March. 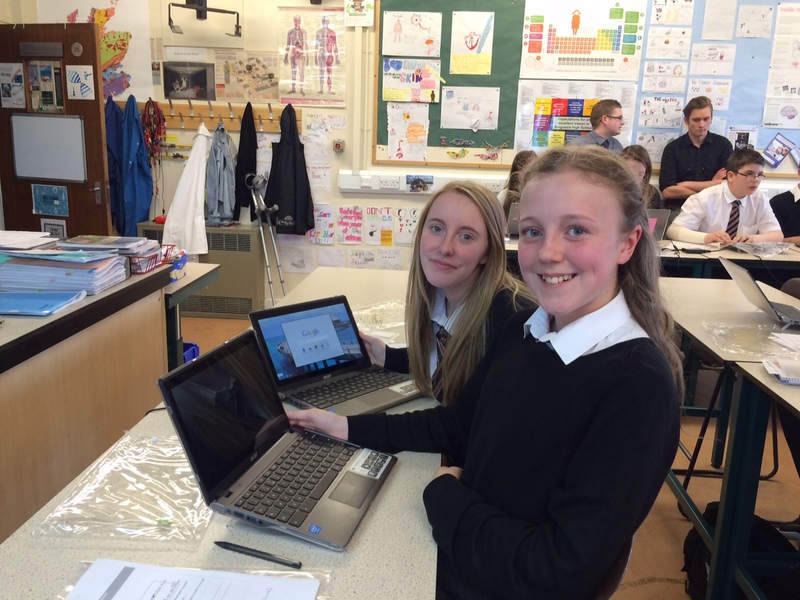 Improvements in learning, as a result of using Chromebooks have been highlighted by Inverness pupils from Inshes and Raigmore Primaries to Members of The Highland Council’s Care, Learning and Housing Committee. Members of the Highland Council’s Care, learning and Housing Committee have agreed to recommend to The Highland Council to create new Gaelic Medium catchment areas for the Portree ASG. The Highland Child Protection Committee will launch a Child Protection Toolkit for Community Groups during an event to be held in Inverness next week. Comunn na Gàidhlig (CnaG) has now started preparations for Cuach na Cloinne 2018. 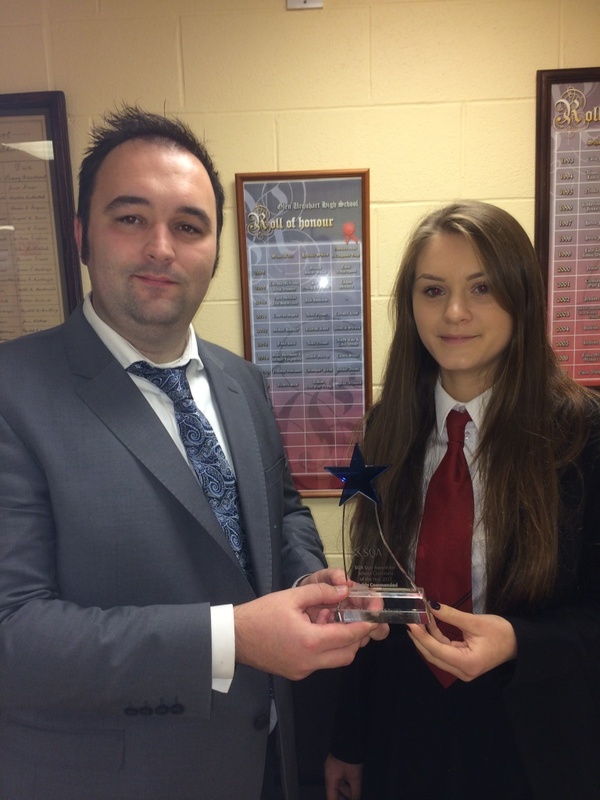 Culloden Academy pupil is 1 in a 1,000 globally. A fourth year pupil at Culloden Academy in Inverness has been selected to be one of only 1,000 girls worldwide to take part in a Global STEM Alliance. 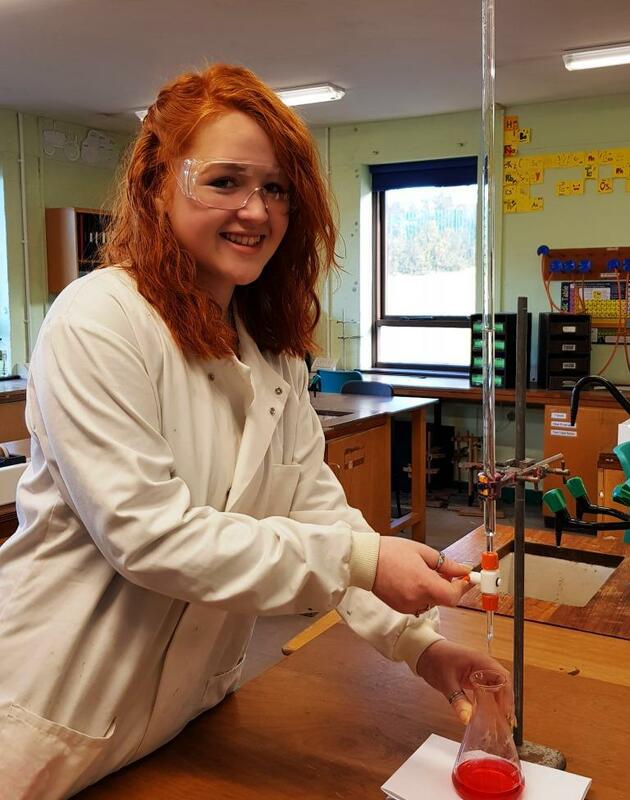 Kirkhill teen Rhona Lee has discovered the formula for an exciting STEM career and it all starts with a Foundation Apprenticeship. Highland Council is asking people with unwanted and unused musical instruments in their homes if they ‘Gave it up?’ to ‘Pass it on!’ during Pass it on Week which runs from 10 – 18 March 2018. 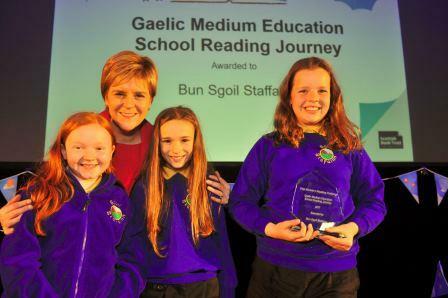 A Lochaber school is celebrating after picking up a Bronze Award for their celebrations to mark World Book Day. Across the Northern Alliance local authorities an exciting project has been rolled out to raise attainment in literacy, language and communication. Highland Council has welcomed the Scottish Government’s official statistics publication ‘Initial Destinations of Senior Phase School Leavers’ which was published today (Tuesday 27 February 2018). Students at Inverness College UHI will find out what’s involved in the immediate aftermath of a road traffic collision as part of an initiative to reduce the number of young deaths on Highland roads. Following a leak caused by a burst pipe, Cromarty Primary school will remain closed on Monday 12 and Tuesday 13 February. Highland Council advises that Knockbreck Primary School, Tain is capped for the 2018/19 academic session. 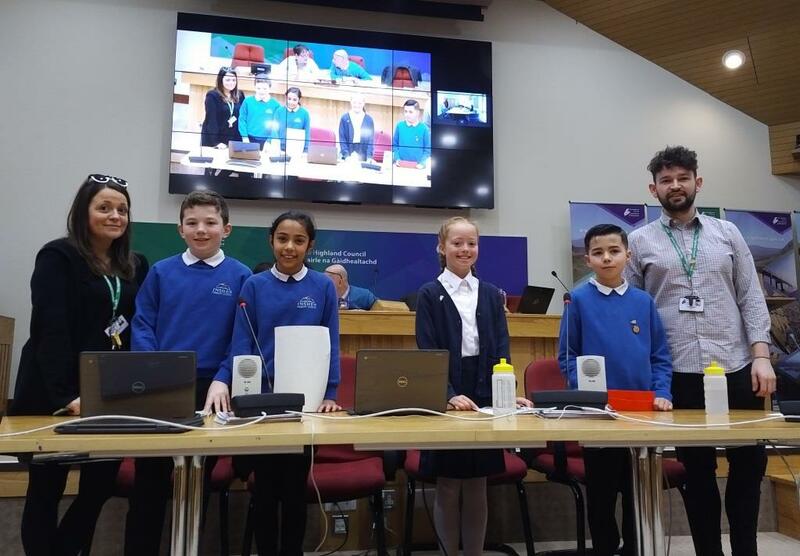 Last week pupils from Kinlochleven Primary School travelled to London to showcase the work they have been doing with digital technology including their achievements using new Chromebooks. Highland Council is inviting parents and carers to enrol their child for nursery and primary 1 for the 2018/19 school year which starts on 21 August 2018. 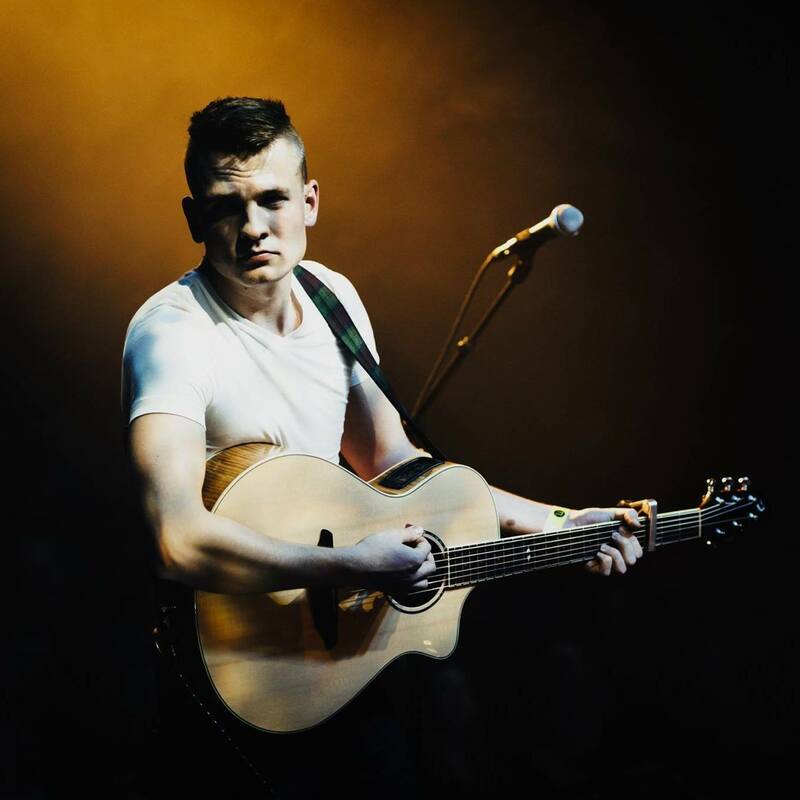 A former Highland Youth Musician owes his ‘head start’ in traditional music to the development of his professional career. Highland Councillors gave their unanimous support to the Year of Young People at the Council’s People Committee today (25 January). Members of the Council’s People Committee have agreed that High Life Highland will deliver Music Tuition services from April 2018. The Highland Council is to seek the views of local communities on a proposal to establish a Gaelic Medium catchment area for Bun-sgoil Ghàidhlig Loch Abar. The Depute Leader of The Highland Council, Cllr Alasdair Christie and Chair of the Council’s People Committee, Cllr Andrew Baxter have written to Highland Council teachers and parents of pupils at Highland schools. Pupils at Strathconon Primary School will in the New Year temporarily relocate to Marybank Primary School due to teacher shortages. Highland Councillors considered Scottish Government’s proposals for changes to the management of schools at today’s meeting of the Council. Wick Campus, including Wick High School, Newtonpark Primary School and High Life Highland Leisure facilities will remain closed on Friday 8 December 2017. The high winds during Storm Caroline today have caused some damage to part of the roof of the Wick campus gym, causing the metal flashing around a roof light to become detached. 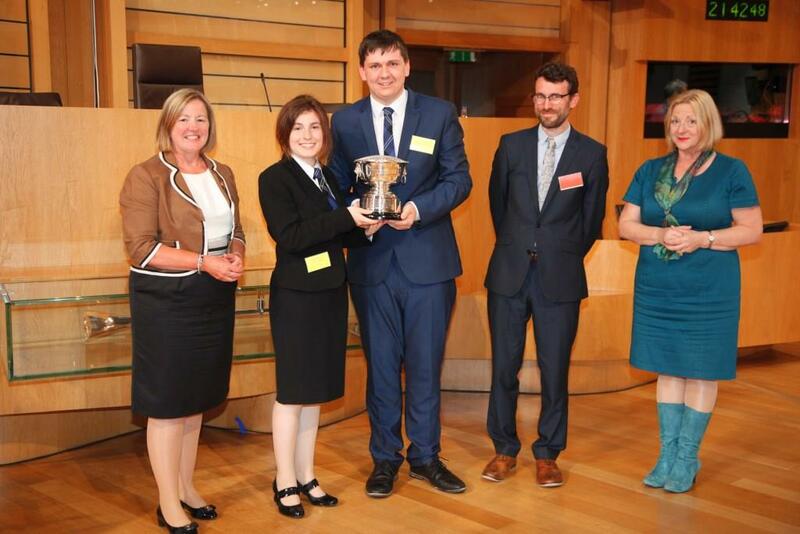 A Lochaber High School pupil was the best debater at the final of the 2017 National Gaelic Schools Debate which took place at the Scottish Parliament on Wednesday 29 November. It’s a ‘double whammy’ for Portree Primary School today (29 November 2017) as they received their second Gold School Sport Award from Garry Reid of sportscotland. Yesterday (Monday 27 December) pupils, staff, parents and invited guests from the community came together at South Lodge Primary in Invergordon for a special celebration to mark the official opening of a new school library. Grantown Grammar pupil Rebecca Gilchrist has won the Special Achievement Award at the Sports Moray award ceremony which was held yesterday. 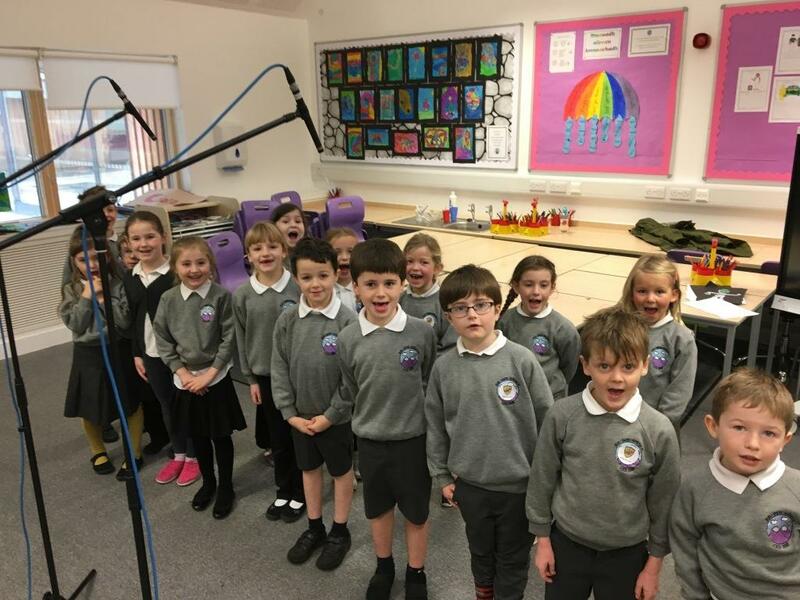 Pre-orders are now being accepted for a brand new Gaelic Christmas CD recorded by Lochaber Gaelic Primary School. 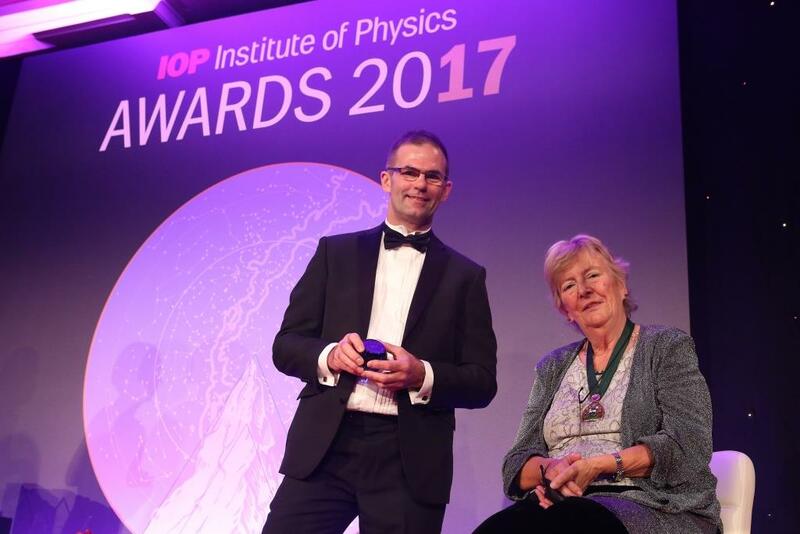 Martyn Crawshaw, Principal Teacher of Science at Millburn Academy, Inverness has been awarded the Institute of Physics ‘Teacher of Physics Award’ 2017 for his outstanding contributions to the teaching of physics. 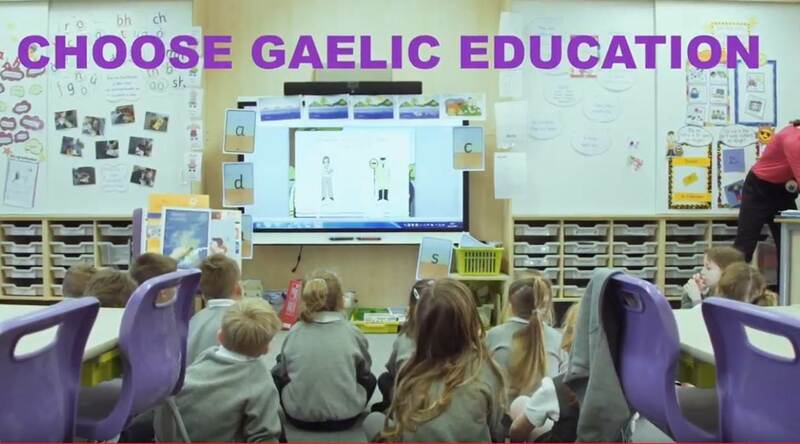 An online Gaelic Education resource site for Primary School Teachers “Lasadh” has received the award for Innovation in Education at the prestigious Gaelic Awards held in Glasgow on 15 November. Ill health among pupils and staff at Kinmylies Primary school in Inverness has forced Highland Council to close the school on Wednesday 22, Thursday 23 and Friday 24 November. Pupils from Nairn Academy, Cawdor, Millbank and Rosebank Primary schools are to have a starring role in the Nairn Christmas lights switch on this year on Friday 24 November. 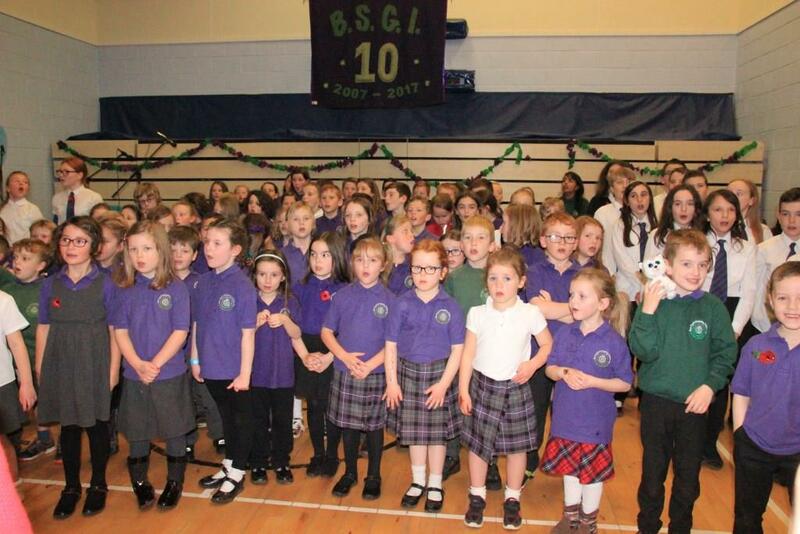 Pupils, staff and parents of Bun-sgoil Ghaidhlig Inbhir Nis recently celebrated 10 years since the school opened its doors to pupils. The Highland Council Learning & Development team has won the SQA Life Long Learning Centre Award (Highly Commended) for 2017. Councillor Margaret Davidson , Leader of The Highland Council and Steve Barron Chief Executive met with the first intake of Modern Apprentices (MA) under the new MA Programme last Thursday. Highland Parent Council Partnership conference will be held on Saturday 18 Nov 2017 from 9:30am to 3:30pm. 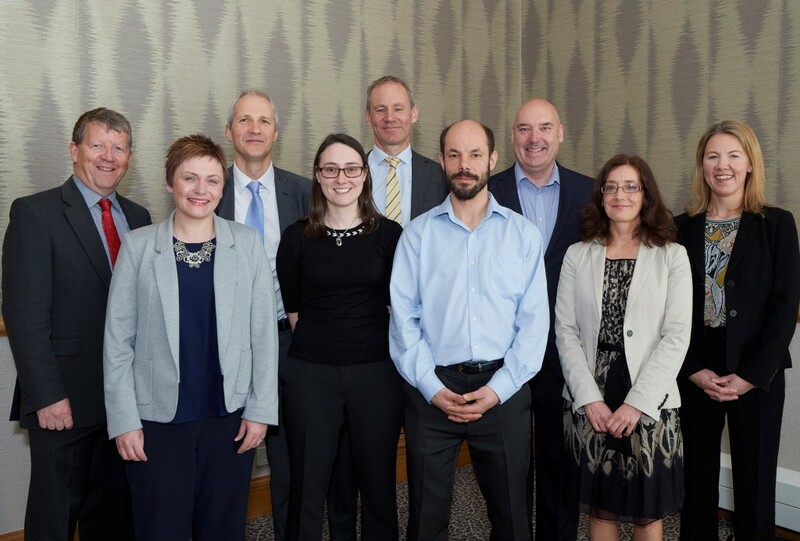 A trainee plumber from Fort William, a photography student from Kyleakin on the Isle of Skye, a high achieving school pupil from Inverness, and Highland Council’s learning and development centre were amongst those recognised at this this year’s Scottish Qualification Authority (SQA) Star Awards. A public meeting will be held at Holm Primary School on Wednesday 8 November starting at 7pm. The newly appointed Armed Forces Covenant Development Officer for Highland and Moray, Jo Lenihan visited Culloden Academy today. Millburn Academy in Inverness, has been recognised with a prestigious national award for innovation and achievement in delivering physical education and extra-curricular sport. After eight days of competitions, performances and festivities, the Royal National Mòd says goodbye to current host, Lochaber. Highland Council is to seek the views of local communities on a proposal to establish a new primary school in Inverness, to serve the Ness Castle and Ness-side housing developments. The Highland Council is proposing an exciting and unique opportunity for children aged 3-5 at Ferintosh Primary and has invited parents and the community to come along and find out more about plans. 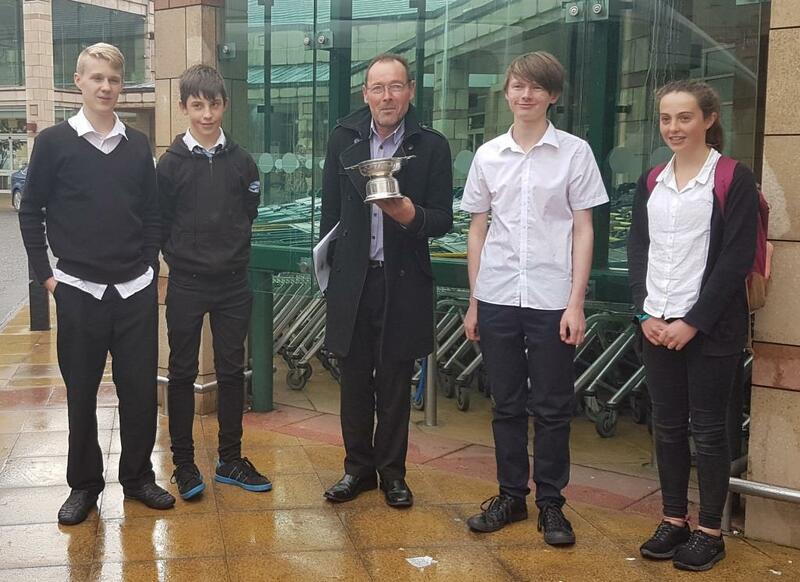 Ardnamurchan High School has won the ’Highland Enterprising Maths’ trophy for the second year running. 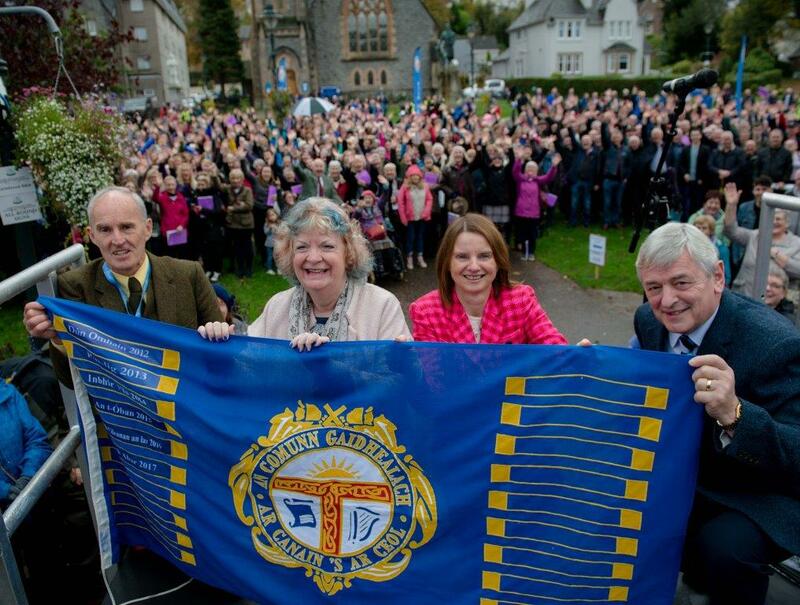 The high point of the year for celebrating the local heritage of the Highlands starts on Friday 29th September. Members of The Highland Council’s Caithness Committee recently welcomed an update of the Wick Associated School Group. Ross and Cromarty Pipes & Drums School (RACPADS) will perform on Saturday 2 September at 2pm on Alness High Street. Winners of the Highland Council’s Play Improvement Group annual Highland Play Award were in Inverness today (Wed 23 August 2017) to receive £1000 towards their children’s play project. Ardersier Primary and Nursery will close on 24 and 25 August because of a suspected Norovirus outbreak. Highland Council is to seek the views of local communities on a proposal to establish Gaelic Medium catchment areas for the primary schools serving Portree High School. Highland Council Piping Instructors Niall Matheson and Niall Stewart, and drumming Instructor Drew Caldwell, with their bands 'Ross and Cromarty Pipes & Drums School' (Novice A) and 'Lochalsh Junior Pipe Band' (Novice B) achieved the ultimate accolade by becoming World Pipe Band Champions in their respective grades at the weekends competition in Glasgow. Due to mechanical failure of freezers, the Food Preparation and Serving Area in the school kitchen is out of commission. Therefore the school will be closed on Tuesday 15th August to pupils. The public are being invited to join the local Countryside Ranger on the evening of Friday 1 September to discover more about the bats found living in and around Grantown-on-Spey. Highland Council has written to the Wick Stakeholder Group, Wick High School Parent Council and Newton Park Primary School Parent Council to provide a statement of assurance regarding the new Wick Campus facility. Exam candidates across the Highlands received their results by text, email or by post on the 8th August. The Blas Festival makes a virtue of bringing good quality events to venues large and small across the Highland offering the opportunity for communities to celebrate Highland culture. Ardnamurchan High School’s annual “Celebration of success” which was held in the school last Tuesday evening, was well attended and gave families, pupils, staff and members of the community the chance to come together to celebrate the achievements of the young people. Pupils at a Highland primary school in Ross-shire are the first in the region to take part in a programme that has been given the Royal seal of approval. Dementia Friendly drama group from Millburn Academy delivered a moving performance about dementia at the Council Chamber today. 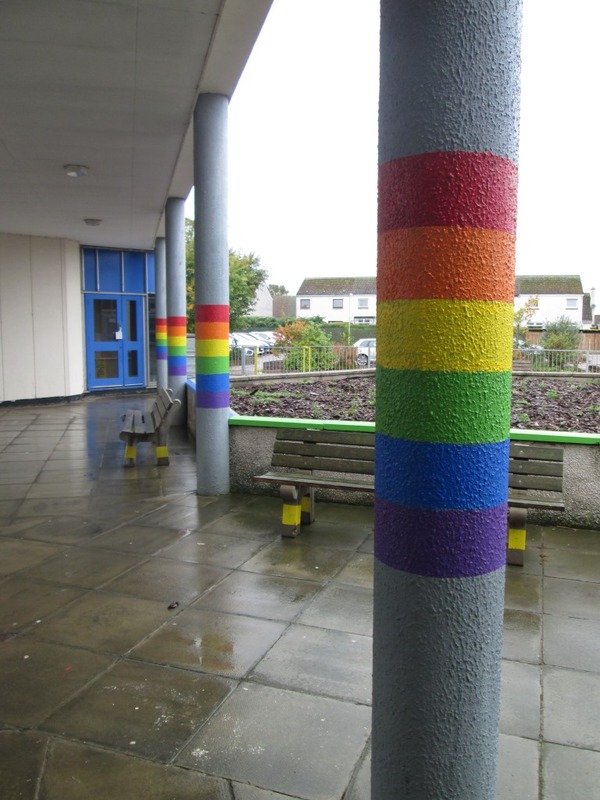 Highland Council is delighted and honoured to have been announced as the ‘Most Improved Local Education Authority’ and top performing Council in Scotland in Stonewall’s seventh annual Education Equality Index. New play equipment installed at Tore Primary school is supporting a creative approach to learning. 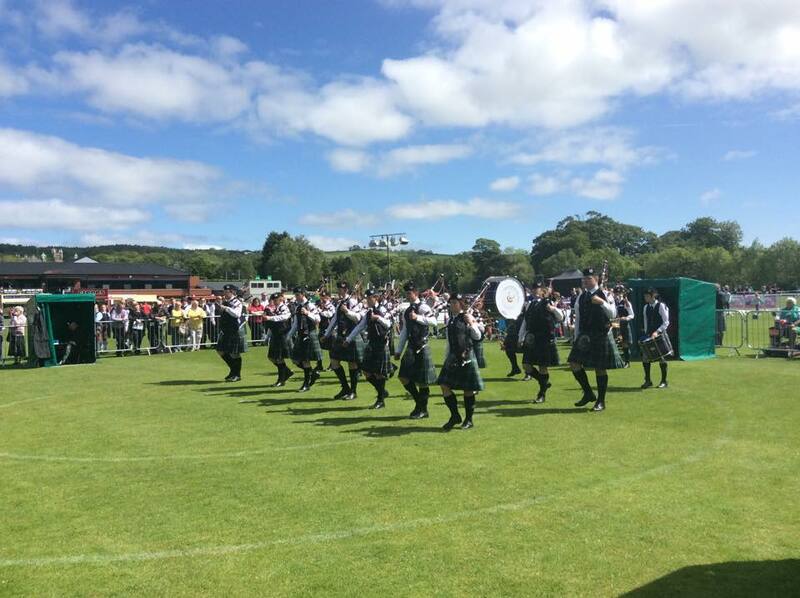 Highland can once again be proud of its young people following the success of several youth pipe bands at the weekend’s European Pipe Band Championships in Forres on Saturday 24 June. The official opening of Highland Council’s Caol Joint Campus comprising Caol Primary School, St. Columba’s Primary School and Caol Community Centre took place this morning Friday 23 June 2017. Bun-sgoil Shlèite have had a a very successful range of events to mark Refugee Week and International Refugee Day. 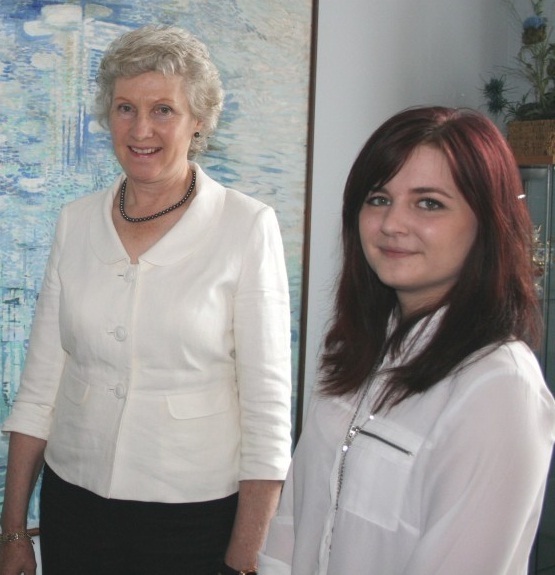 ​​​​​​​Appointments to Adult Services Development and Scrutiny Sub-Committee and other bodies. The Highland Council’s People Committee has today (21 June) agreed membership of the Council’s new Adult Services Development and Scrutiny Sub-Committee. The Highland Council Leader responds to the publication of Education Governance: Next Steps, announced today by John Swinney, Deputy First Minister and Cabinet Secretary for Education and Skills. 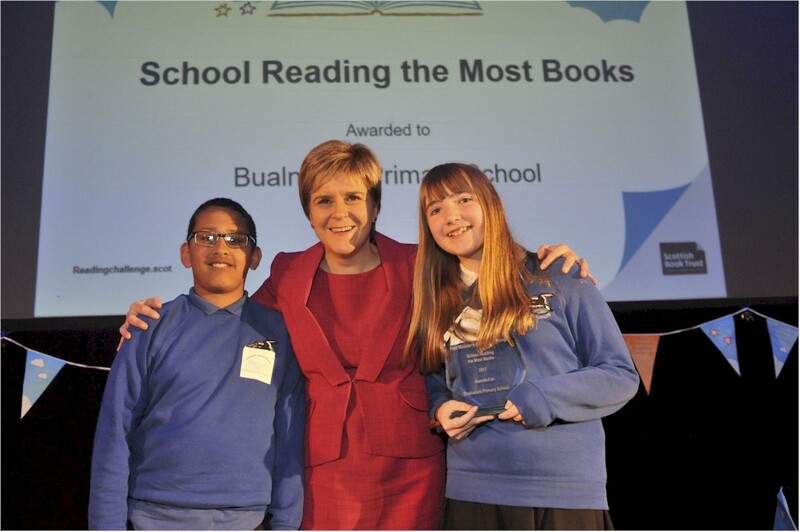 A Ross-shire primary school has received two awards from the First Minister in a nationwide competition to encourage Scottish children to foster a lifelong love of reading. ntony Hook, tuba player, former pupil at Lochaber High School, and Highland Young Musician of the Year 2016 will return on Sunday to perform at the evening public final of this year’s competition. During the recent Isle of Skye Provincial Mod 2017, the Elgol Primary School String Trio won1st place and Plockton Primary String Ensemble came 2nd as part of the string group competition. 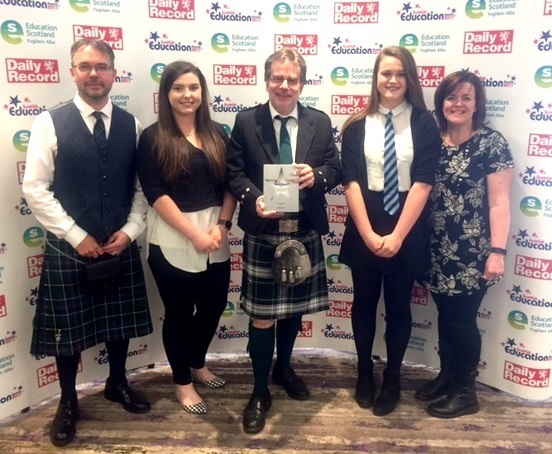 Ardnamurchan High school has received the Gaelic Education Award at the prestigious annual Scottish Education Awards at a ceremony held in Glasgow yesterday (7 June). Young musicians attending Highland Schools are being invited to apply now for fantastic high quality musical experiences with the Highland Young Musicians groups in 2017/18. 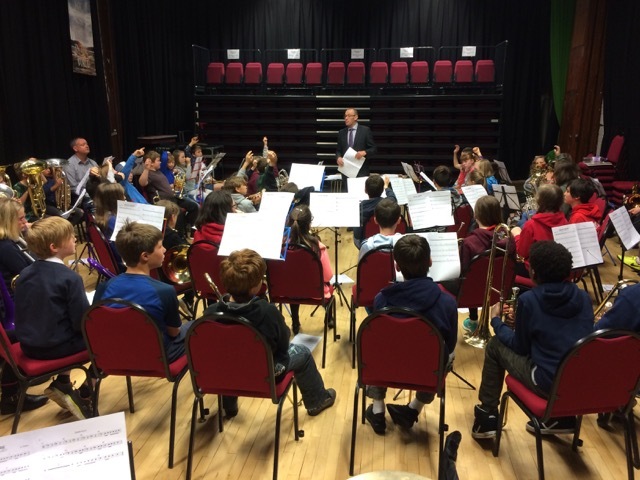 ​​​​​​​Scores of pupils attend Highland Brass Day! Pupils from across Highland schools attended a Brass Day held in Inverness on Wednesday 31 May, organised by Highland Council’s Instrumental Tuition Service. Highland Council can advise that the Council's new People Committee, meeting on 21 June 2017, will be asked to agree to a new site selection review for the Tain 3 – 18 Campus. 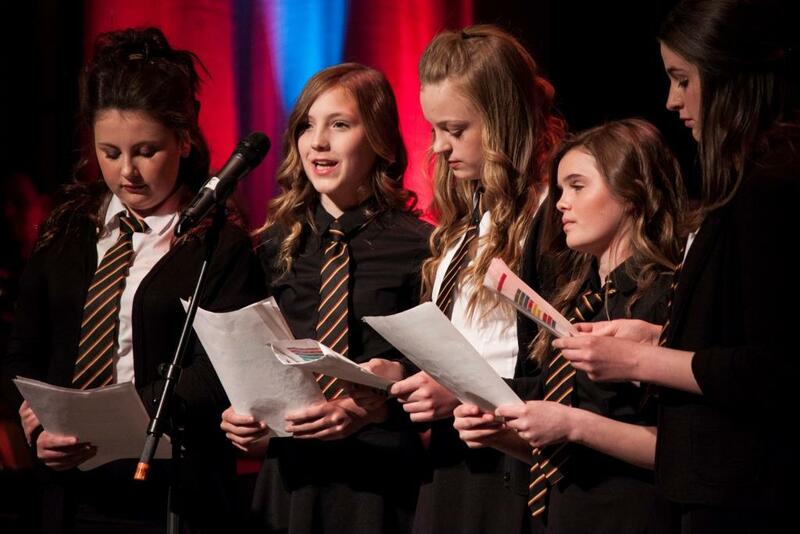 Bun-sgoil Taobh na Pàirce have emerged as winners of this year’s Cuach na Cloinne competition! 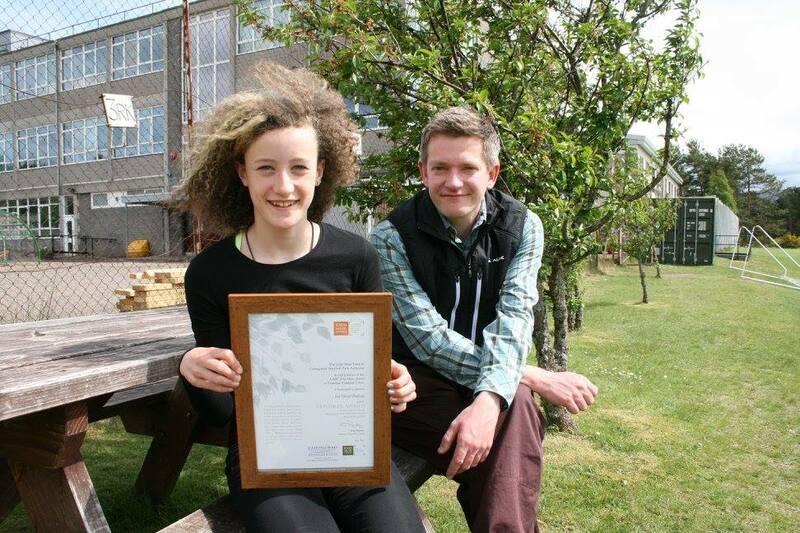 Grantown Grammar School achieved a milestone last week when a pupil was presented with the 1000th John Muir Award achieved at the school. 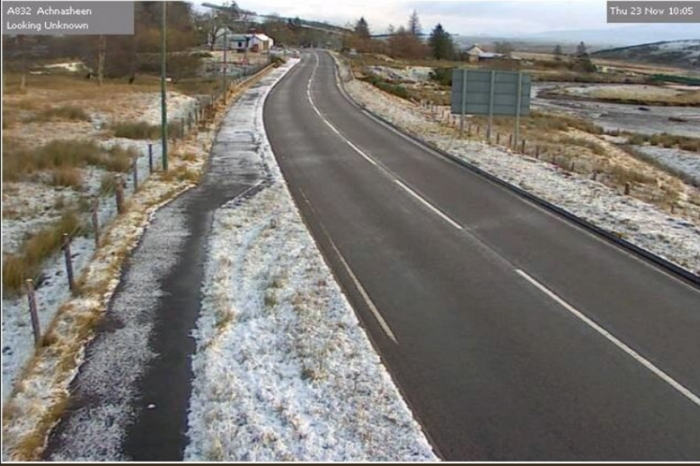 The A831 road is closed near Balnain due to a road traffic accident. Lochalsh Junior Pipe Band won British Champions in the Novice B Section of the British Pipe Band Championships in Paisley on Saturday 20 May. 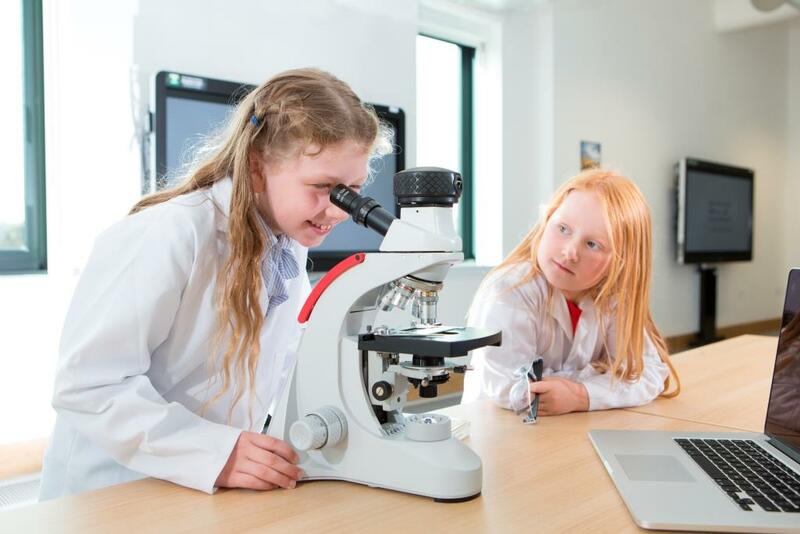 The transformation of future learning in Highland schools was discussed by around 100 head teachers at a Science and Technology Conference last week in Inverness. Police Scotland is appealing for witnesses after a number of windows were vandalised at the Old Wick High School, West Banks Avenue, Wick, Caithness. 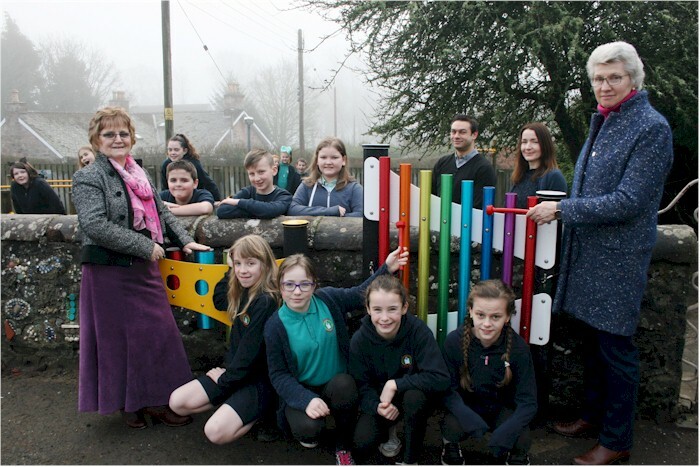 The Scottish Ensemble musicians, with two of their guests playing percussion and harpsichord, visited Dalneigh Primary School recently as part of their Inverness Residency. For the third night in a row the Safer Highland events, sponsored by the Safer Highland Partnership and Police Scotland’s Choices for Life were performed to a sold out audience. Ten S3 history pupils from across the Highland area are set for a once-in-a-lifetime trip to France to observe the centenary of the Battle of Arras at Scotland’s national commemorations. 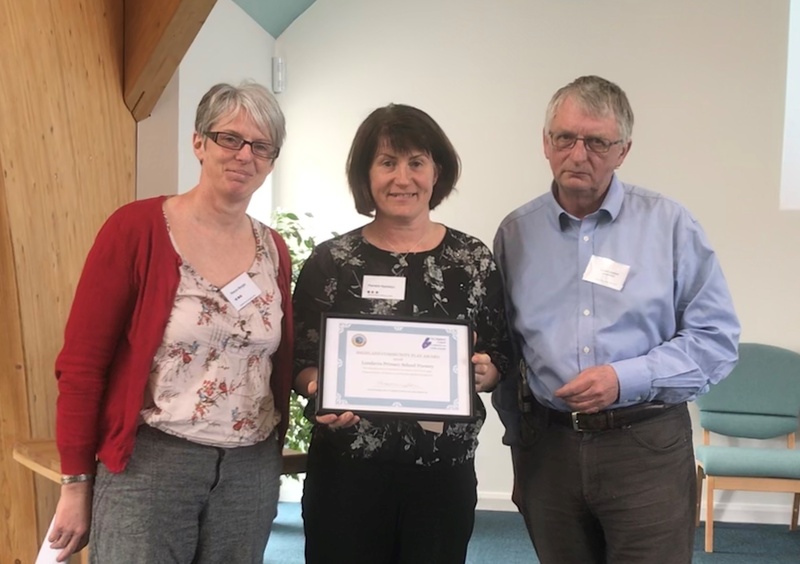 Highland Council’s Play Improvement Group annual Highland Play Award will go to Badenoch and Strathspey-based “Roots and Shoots". Tonight, the event held at Eden Court Theatre, Inverness took place to a sold out audience and was supported by the Safer Highland Partnership and Police Scotland’s Choices for Life. School children from the Highlands have taken part in a wildlife crime poster competition following school visits from officers. The Highland Council has awarded three contracts valuing £7.9 million in total for works at three Inverness schools which are expected to commence in April 2017. Congratulations go to a team of S1and S2 pupils from Nairn Academy who took part in the UKMT Team Maths Challenge Regional Heats in Aberdeen University on Monday. Lots of slow deep breathing will be taking place in Nairn Academy this week as the school’s Pupil Council have organised a range of events for a Stress Less Week. 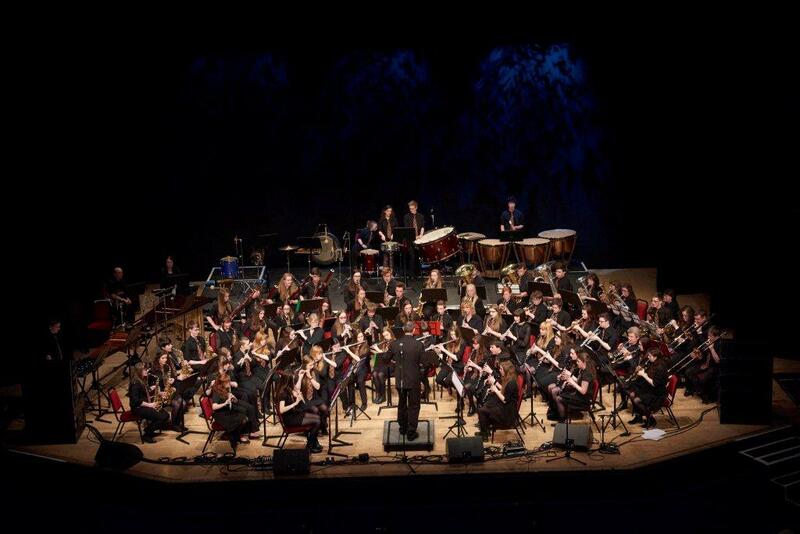 On Saturday (18th March) Lochaber High School Senior Wind Band took part in the National Finals of the Scottish Concert Band Festival in the prestigious venue of Perth Concert Hall. A Careers Day for Highland Gaelic Secondary pupils was officially opened at Eden Court in Inverness today, March 16th by Calum Maclean, one of “Siuthad’s!” Young Ambassadors, also a film-maker and broadcaster. 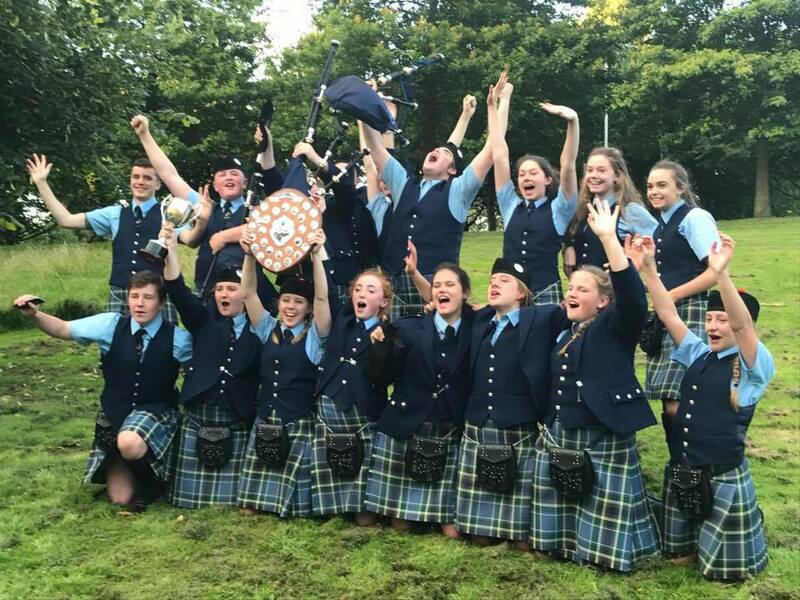 Highland school pipe bands received a number of accolades at last Sunday’s Scottish Schools Pipe Band Championships which were held in Edinburgh’s James Gillespie School. 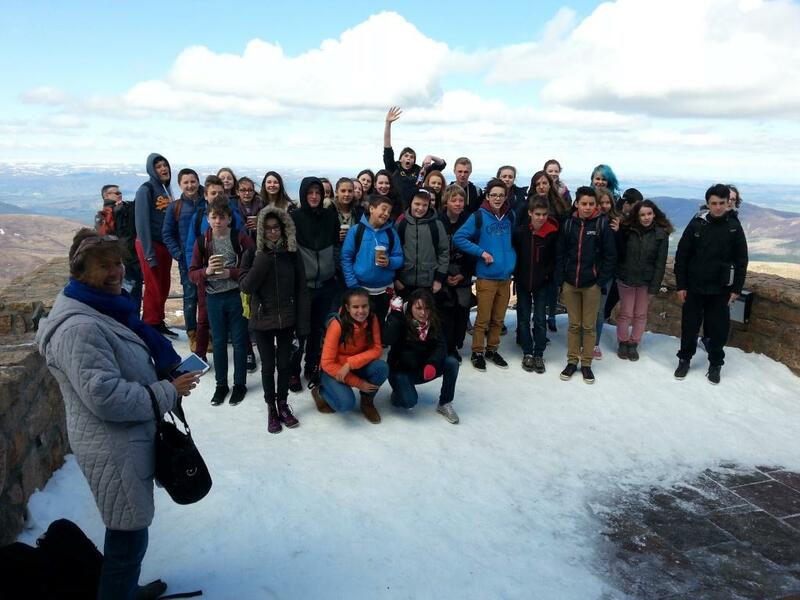 A total of 33 young people from Portree, Plockton and Mallaig High Schools participated in the event which took place over 4 days and involved both Gaelic fluent speakers and Gaelic learner pupils. On Thursday 9 March 2017, The Highland Council resolved to discontinue the provision of education at the Black Isle Education Centre. Ardnamurchan High School held its first Youth Philanthropy Initiative (YPI) final On Friday 3rd March. 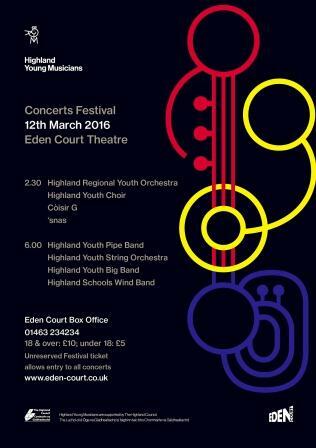 March 19th will see two youth wind bands from Highland travel to the final of the Scottish Concert Bands Festival in Perth. Highland Council has issued reassurance on the provenance of ingredients in its school meals following recent national media reports this week. Highland Council has confirmed move-in arrangements for the new Wick Campus. The success of Highland film makers in the ninth annual Gaelic FilmG Awards was highly commended today (1 March 2017) at The Highland Council’s Education, Children and Adult Services Committee. Members of The Highland Council’s Education, Children and Adult Services Committee have approved a management proposal for the Farr (Sutherland) associated school group. A recommendation to discontinue education provision at The Black Isle Education Centre will be presented to the meeting of The Highland Council on 9 March 2017 for Members’ consideration. A proposal to relocate Dunvegan Primary School to a new building received approval today (1 March 2017) from The Highland Council’s Education, Children and Adult Services Committee. 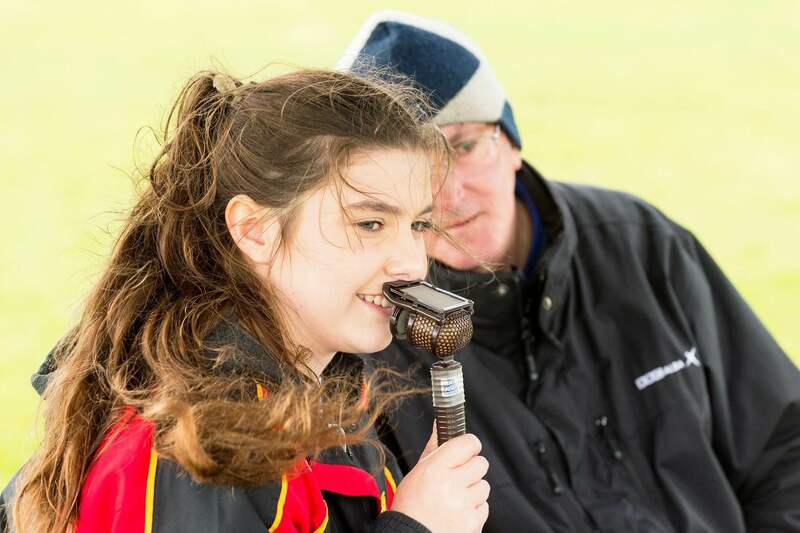 Congratulations to Kate Bradley, a pupil at Ardnamurchan High School for her success in winning the 2017 FilmG Sports commentary award. Lundavra Primary leads the way in digital teaching and learning as one of Scotland’s first ‘Digital Schools’. A highly successful Gaelic In-Service day took place in the Merkinch Community Centre today (Wednesday 22 February), aimed at staff who are directly involved in Gaelic Education. The Highland Council refutes Unison’s claims that “88% of Highland Council school support staff have suffered violence or aggression” when their figures in fact represent 5.7% of the council’s total Pupil Support Assistants and Early Years Practitioners. Young people in Caithness and Lochaber will be among the first in Scotland to benefit from new Norwegian style learning centres. 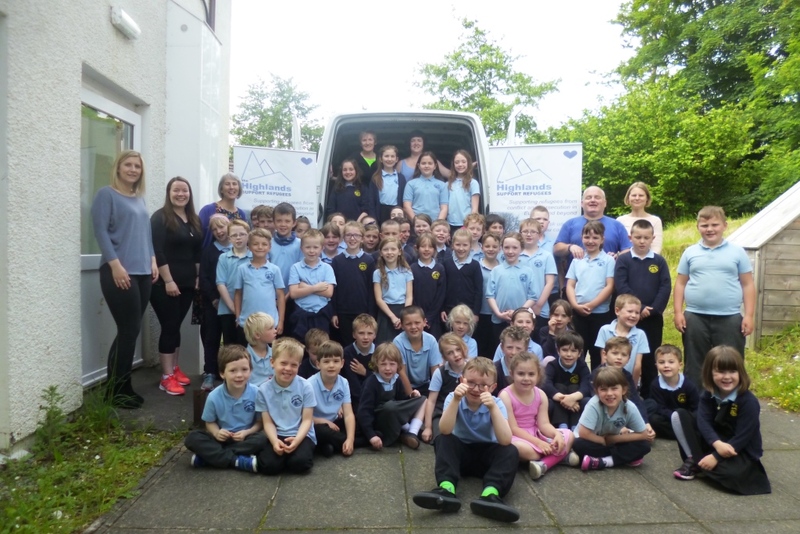 Munlochy Primary School pupils invited their local Councillors to school to thank them for part funding new outdoor exercise and fitness equipment at their school from the Black Isle Ward discretionary budget. 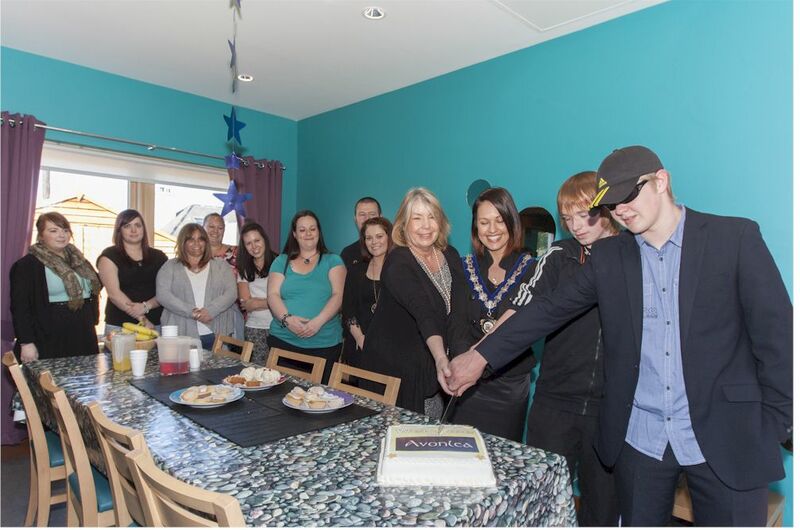 New cutting-edge careers spaces aimed at inspiring youngsters have opened in Inverness. Highland Council Leader, Cllr Margaret Davidson is pleased that the authority’s Countryside Ranger and Access Team will be retained in the council’s budget proposals for 2017/18. 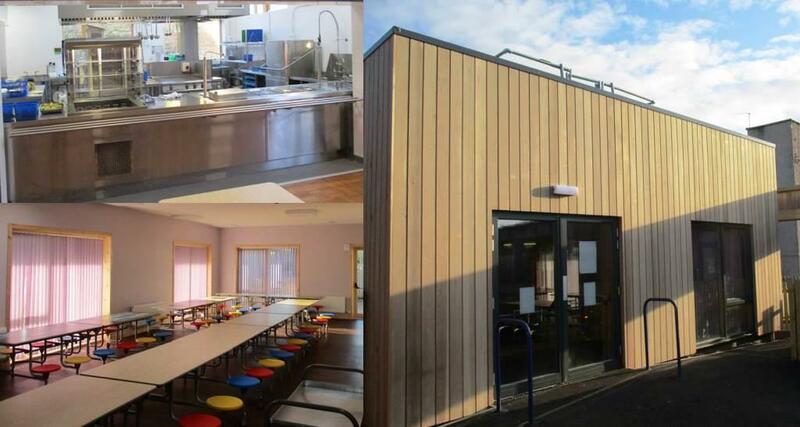 Works at five Highland Primary Schools have recently been completed providing additional dining and catering facilities to help improve the provision and take up of school meals. 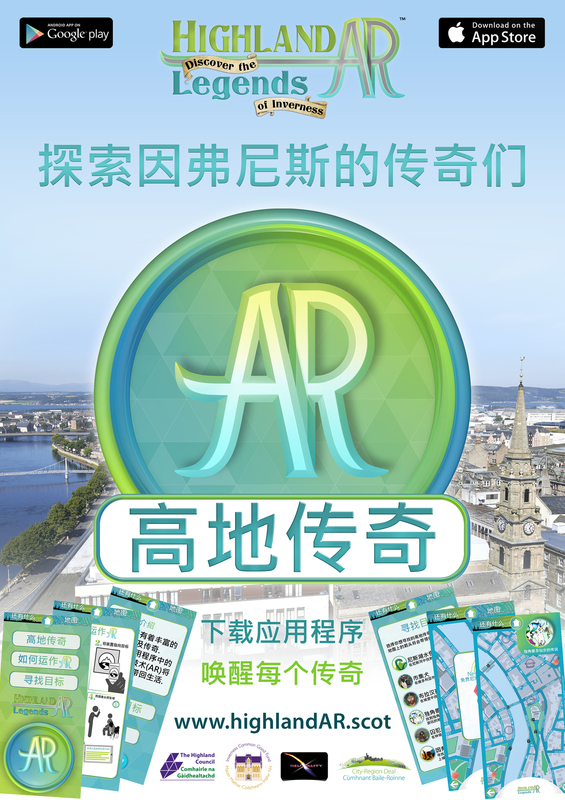 Chaidh an Stiùireadh Reachdail airson Foghlam Gàidhlig fhoillseachadh an t-seachdain sa chaidh aig cuirm aig oifisean Comhairle na Gàidhealtachd às dèidh coinneamh de Bhuidheann Buileachaidh na Gàidhlig aca. Due to current pressures on school rolls and following an analysis of school roll forecasts, The Highland Council is ‘capping’ or limiting school rolls and reserving places in some Primary Schools in Inverness for the 2017/18 academic session. The future strategic direction for schools as set out in Highland Council’s Management of School’s Programme was agreed by Members of the Council’s Education, Children and Adult Services Committee. A recommendation to discontinue education provision at the currently mothballed Kinbrace Primary School will be presented to the meeting of The Highland Council on 9 March. 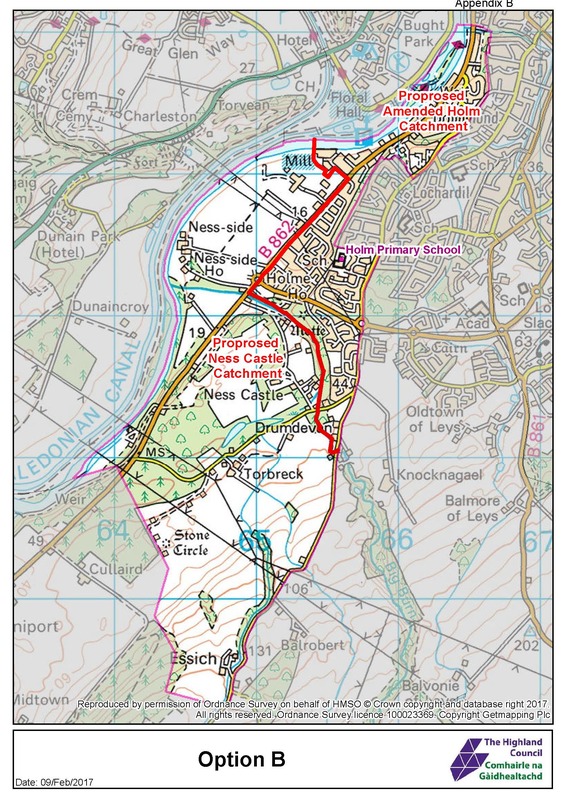 Highland Council is to seek the views of local communities on a proposal to change the catchment boundary between Inverlochy Primary School and Lundavra Primary School. 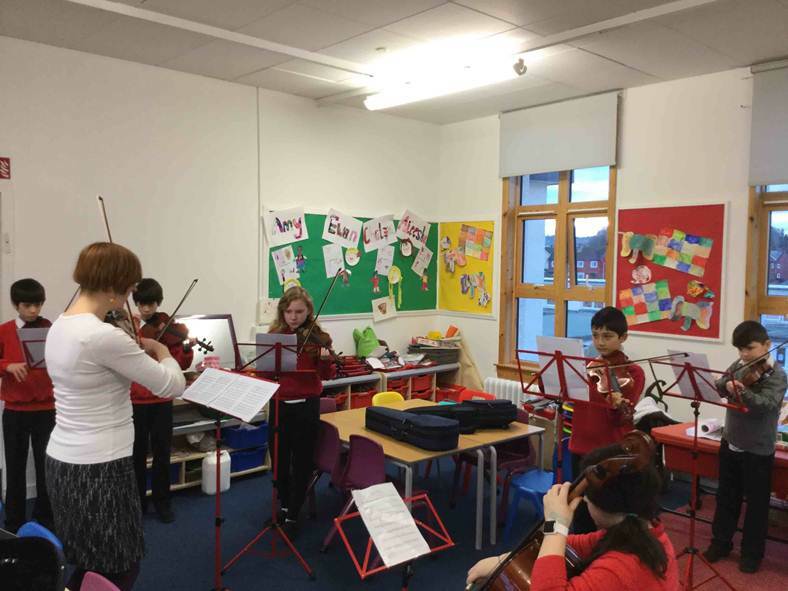 Pupils from Dalneigh Primary, Inverness have been practicing for the Scottish Ensemble all-day residency. The City of Inverness Youth Pipe Band were delighted to be a part of Eden Court CREATIVE and Event Scotland’s fifth annual Burns night event. 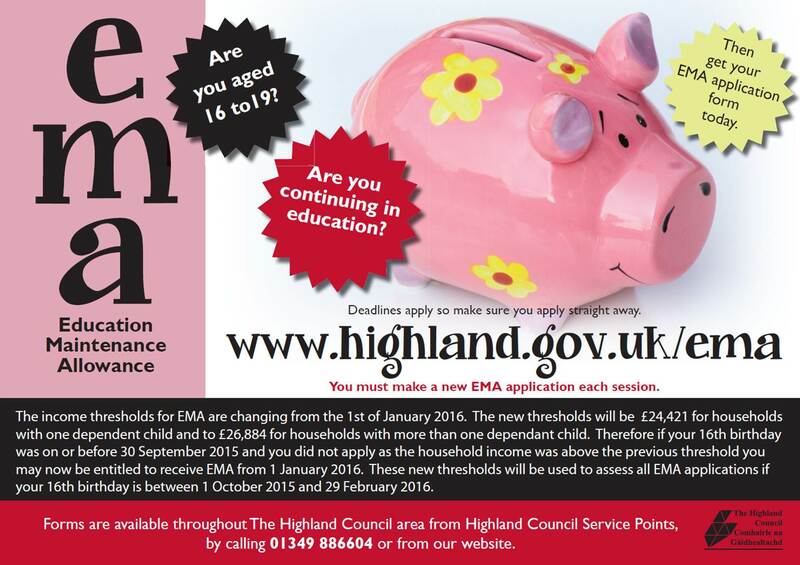 Highland Council is inviting parents to enrol their child for nursery and primary 1 for the 2017/18 school year. Highland Council has updated Wick Campus stakeholders and confirmed that the Campus has now been handed over by Hub North Scotland to the Council. New head teachers have been appointed by The Highland Council. The Highland Council has appointed a primary teacher to take up post at Scoraig Primary school. Highland Council secondary schools in the Inverness and Nairn area and Police Scotland are writing to parents and carers urging them to share any concerns or information related to possible drug activity in their areas. The search for the Highlands’ brightest education stars is underway as nominations are open for the Scottish Education Awards 2017. Lundavra Primary School in Fort William has become the first school in Highland and one of the first schools in Scotland to receive the ‘Digital Schools Award’. Highland Council welcomes today’s publication of experimental statistics (by the Scottish Government) showing local judgement of the level achieved by pupils at selected stages in school. The Highland Council has been notified by hub North Scotland Limited that the expected handover date for the Wick Campus facility is now Thursday 8 December 2016. The Highland Council welcomes the confirmation from the Scottish Government that the Council’s decision to close Dalwhinnie Primary School has not been called in by Ministers. Members of The Highland Council’s Education, Children and Adult Services Committee have overwhelmingly ‘embraced, celebrated, and welcomed’ a report on ‘Emerging Literacy’. Highland Council is to seek the views of local communities on a proposal to relocate Dunvegan Primary School to Lonmore, on the outskirts of the village of Dunvegan. Highland Council has announced the appointment of two new head teachers in schools in Inverness. en talented school pupils are embarking on a trip to NASA’s Johnson Space Center in Houston, Texas with the University of Strathclyde Faculty of Engineering’s Scottish Space School. Due to building work, Inverness High school will remain closed to S1, S2 and S3 pupils on Friday, 7 October. Young musicians from Ardnamurchan High School visited Lochaline last Wednesday and Acharacle on Thursday to perform in public and entertain the communities as part of the rolling programme of musical village hall tours. 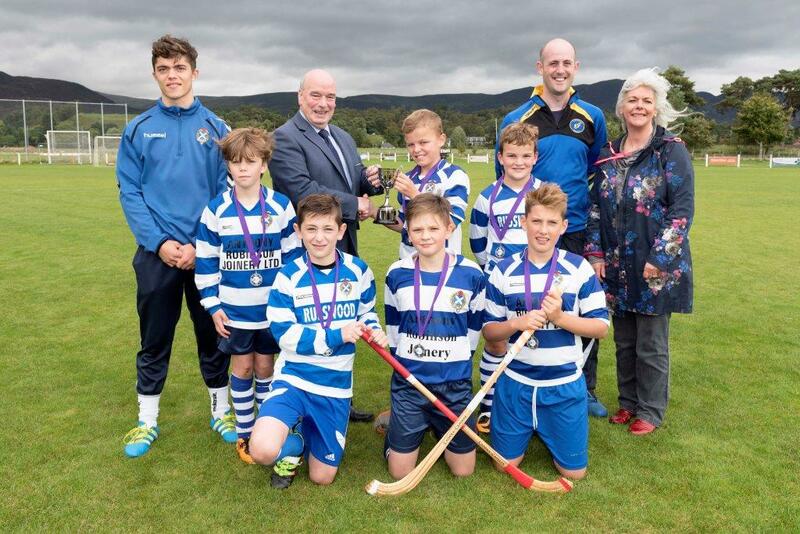 Iomain Cholmcille – the Gaelic Shinty Project – have worked in partnership with the Highland Council’s Gaelic Team and High Life Highland to organise a national shinty event for P4 – P7 Gaelic Medium pupils from schools across Scotland. As concerns over childhood obesity make headline news recently, a board game that helps shape children’s thinking and behaviour around food has been given the go-ahead for a UK-wide launch. Pupils from Dalneigh Primary School, Inverness are pictured with Andrew Berridge (viola) and Naomi Pavri (cello) during a Scottish Ensemble workshop held last Thursday (8 September). On Thursday 8 September 2016, Highland Council agreed the proposal to discontinue the provision of education at Dalwhinnie Primary School, re-assigning the school’s catchment area to that of Newtonmore Primary School. Proposals for a community owned, funded and developed primary school for Strontian received approval today from The Highland Council’s Education, Children and Adult Services Committee. Repairs are to be made to a multi-use games area at Upper Achintore, Fort William to allow the previously closed pitch to be brought back into temporary use. Over 270 local primary seven pupils across Caithness and North Sutherland will be looking forward to taking part in the forthcoming ‘Safe Highlander’ event which is being coordinated by a local steering group on behalf of The Highland Council, Community Planning Partners and the many other organisations involved. In celebration of the Duke of Edinburgh, Diamond Anniversary, the DofE organisation is inviting people of all ages to take part in a once-in-a-lifetime DofE-inspired Diamond Challenge and raise funds to help transform young lives in local areas. The Highland Council’s Care and Learning Service will be reflecting on the success of their summer works programme carried out in various primary and secondary schools while reviewing the projects which did have problems. The Highland Council is able to confirm that Duncan Forbes Primary School in Inverness will open on Thursday 18 August. The Highland Council has been made aware by its contractor Hub North Scotland (Wick) Ltd., of delays affecting the completion of the Wick Joint Campus. The deadline is nearing for members of the public to submit their views on the proposed closure of The Black Isle Education Centre, and also the proposed closure of Kinbrace Primary School. One hundred and thirty probationer teachers were recently welcomed to the Highlands (on Friday 12 August), at an induction course held in the Highland Council Chamber. The Highland Council has confirmed that Duncan Forbes Primary in Inverness will not open to pupils tomorrow as expected. Young people across the Highlands have received their results by text, e-mail or post. Highland Council welcomed 5 Young people who achieved their Gold Duke of Edinburgh’s Award, to the meeting of the Highland Council in Inverness today. Ross and Cromarty Pipes and Drums School (RACPADS) pipe band, Lochalsh Junior Pipe Band and City of Inverness Youth Pipe Band were competing at the European championships last Saturday in Forres. 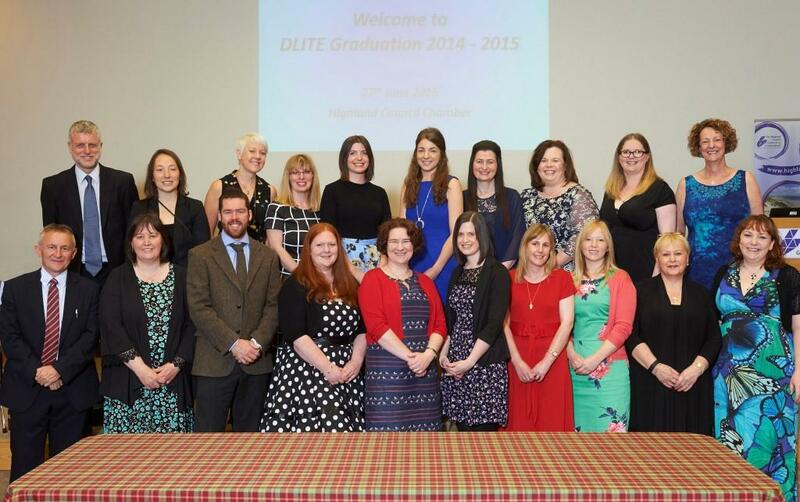 DLITE PGDE Primary Graduates June 2016 at Highland Council’s Headquarters, Inverness (ltor) Bill Alexander Director of Care & Learning, Jessica MacLennan, Siobhan Millar, Yvonne Stoddart, Elizabeth Fuller, Sara Riach, Roddie Jamieson, Ann Stewart, Melanie McKay, Nicola Cope, Catriona Smith and Louise Chisholm. Dr Finlay Wild, officially opened Lundavra Primary School today (24 June) by unveiling a plaque at the new school. 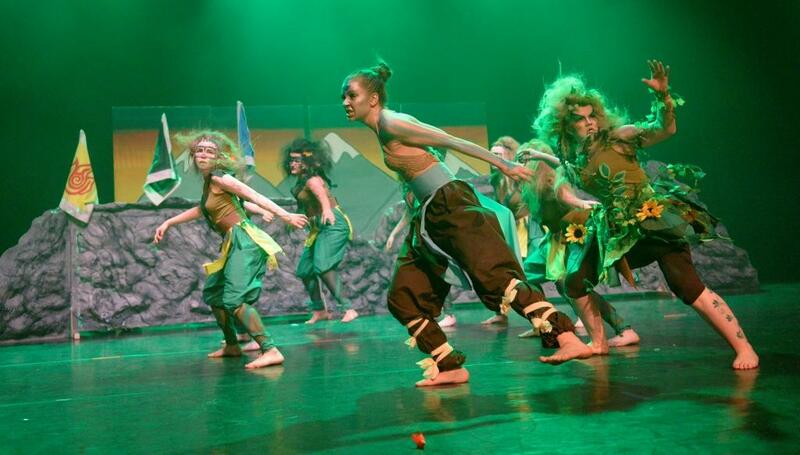 Alness Academy won first place becoming the Scottish Champions for 2016 in UK Rock Challenge. Antony Hook, tuba player and pupil at Lochaber High School, was awarded Highland Young Musician of the Year 2016 at a competition held in Inverness yesterday (Sunday 19 June). 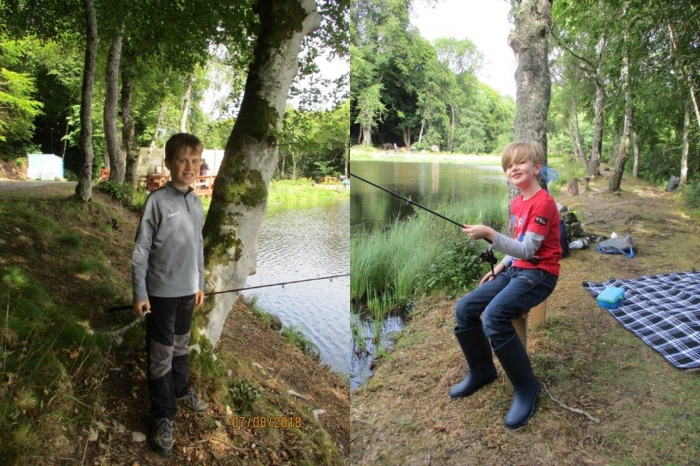 As the summer holiday programme starts for the Highland Council Rangers, things that creep and crawl and swim are the focus for several events taking place in and around the Inner Moray Firth area. The Highland Council are inviting parents, children and members of the public to attend a meeting next week to discuss the proposal to close The Black Isle Education Centre. 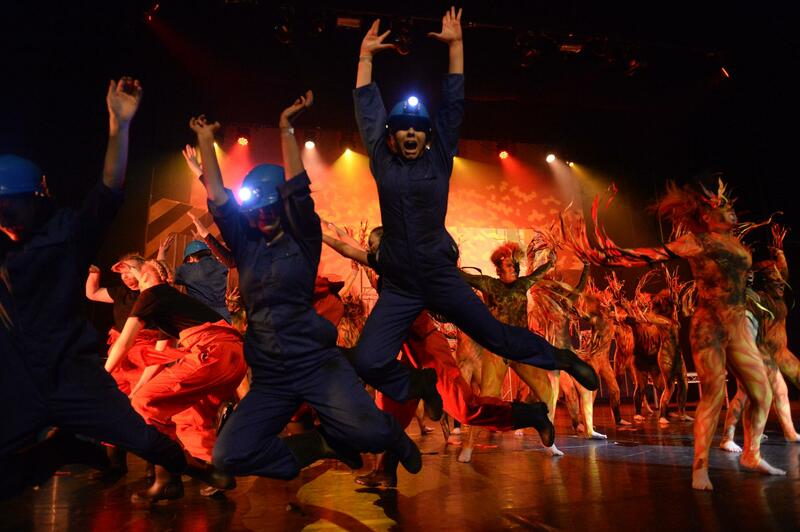 Culloden Academy’s latest production is sure to get feet tapping when pupils take to the stage for ‘We Will Rock You’ - The Musical, written by Ben Elton and featuring the songs of iconic rock band Queen. Leugh ’s Seinn le Linda is a national partnership initiative organised by An Lòchran and the Gaelic Books Council, giving children under 5 years of age the opportunity to enjoy fun-filled reading and singing sessions in Gaelic. 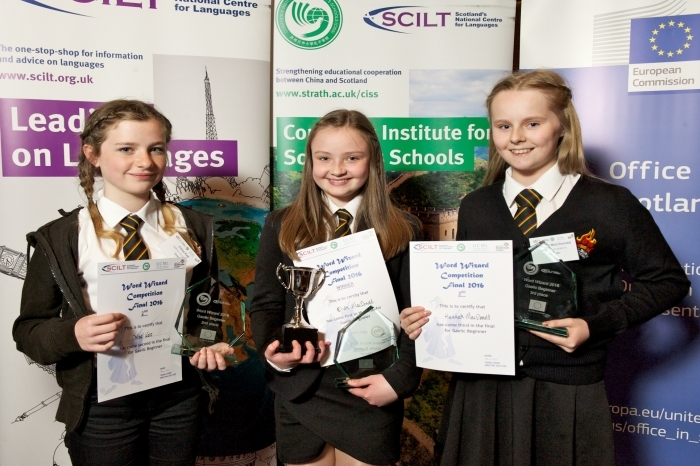 The language skills of six Highland pupils were recognised at a national competition held in Edinburgh at the end of May. The Highland Council has been forced to close Noss Primary School this afternoon (24 May) and tomorrow (25 May). A group of Inverness schoolgirls have taken a starring role at a Salvation Army congress after helping boost the church and charity’s local work to the tune of £3000. ​Highland Council to introduce updated school transport policy. Members of The Highland Council’s Education, Children and Adult Services Committee have approved a new ‘Home-to-school transport policy’. Pupils at Milton of Leys Primary School in Inverness have been taking part in on-bus sessions to learn about using public transport in a safe and responsible way. The Highland Council is to seek the views of local communities on the future of two Highland educational establishments – Kinbrace Primary School and Black Isle Education Centre. Highland Council has received the keys to the door of a pupil residence at Portree High School which has seen the refurbishment of the former Elgin Hostel building. 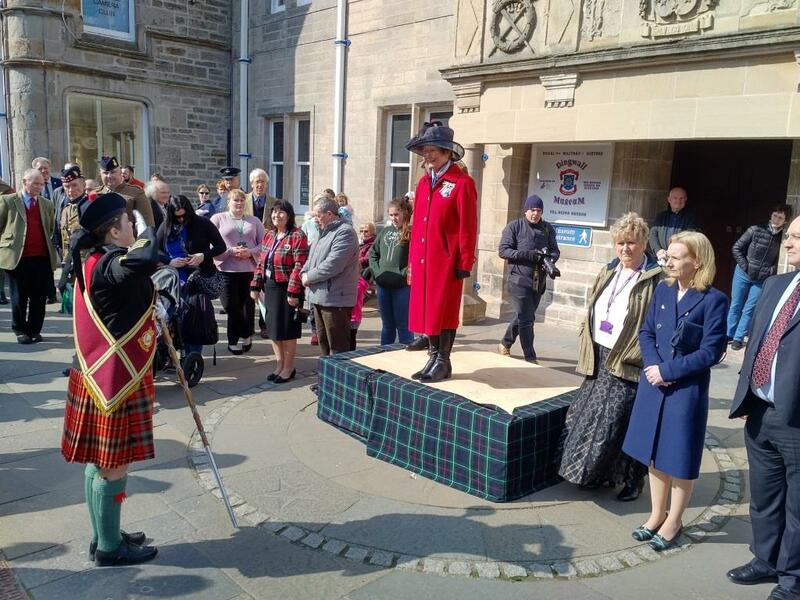 This week, more than 2000 people have passed through the doors of Eden Court in Inverness, to watch 20 performances by 1000 students from Highland Schools, promoting the value of healthy lifestyles. 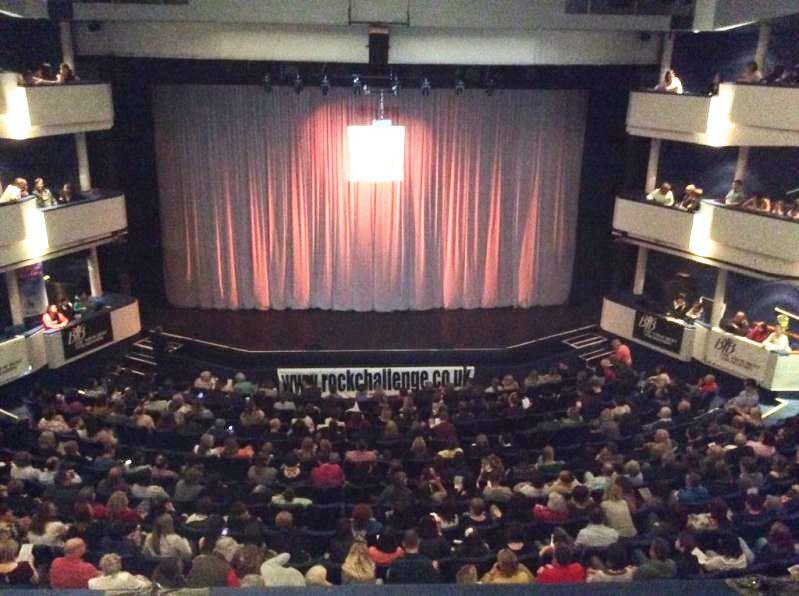 A packed Eden Court celebrated wonderful Rock Challenge performances last night (19 April) from Grantown Grammar School, Alness Academy, Culloden Academy, Dingwall Academy, Inverness High School, Nairn Academy and Wick High School. 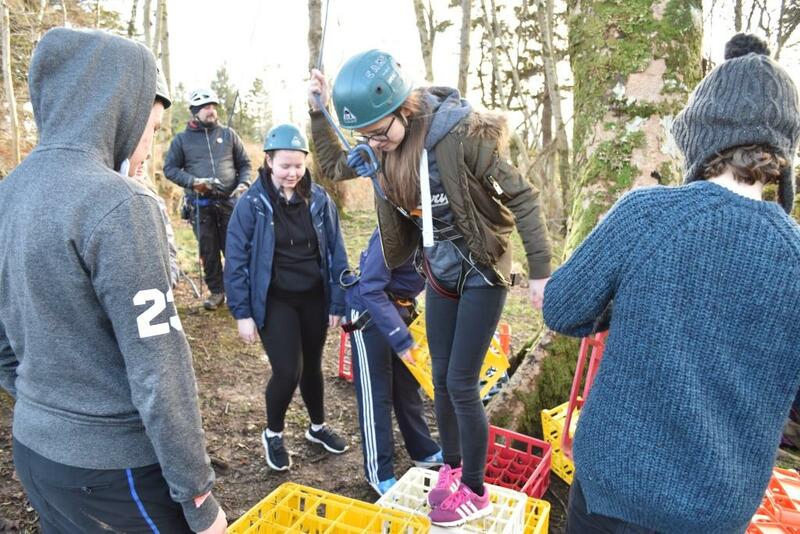 Highland’s care experienced young people are to have a bigger say in the decisions that affect their lives thanks to a funding boost of £225,000. In light of recent developments regarding the condition of Edinburgh Schools, The Highland Council confirms that it has no cause for concern about the safety of school buildings in this authority. The new £15.4million Noss Primary School in Wick has reached a vital milestone with the practical completion of the facility. A Gaelic Awareness Event took place in the Strathnaver Museum, where parents received information and advice on the benefits of bilingualism from the Highland Council Gaelic Team Officials. 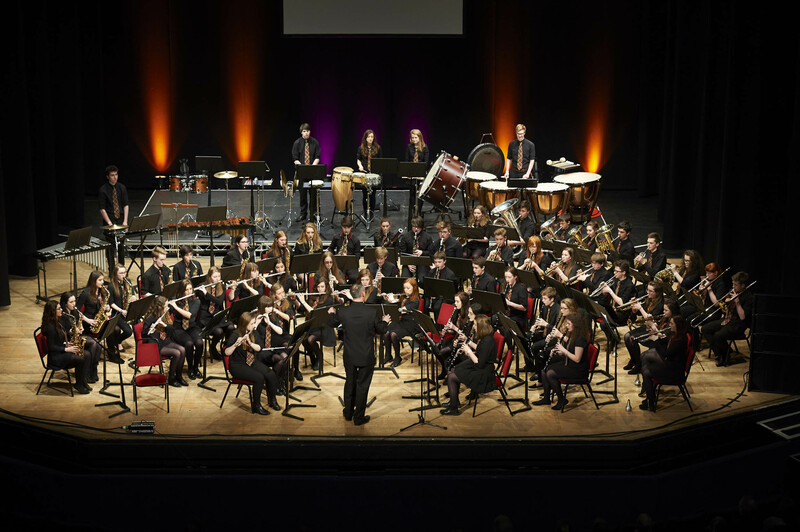 This weekend’s Scottish Concert Band Festival finals being held in Perth Concert Hall will see representation from two Wind Bands from the Highlands. The sole agenda item for the next Wick and Landward Ward Forum will be the new Noss Primary School 20mph speed limit traffic order. An Inverness school has been busy raising money for a new and unique partnership with a locally based charity, Scottish Exotic Animal Rescue. 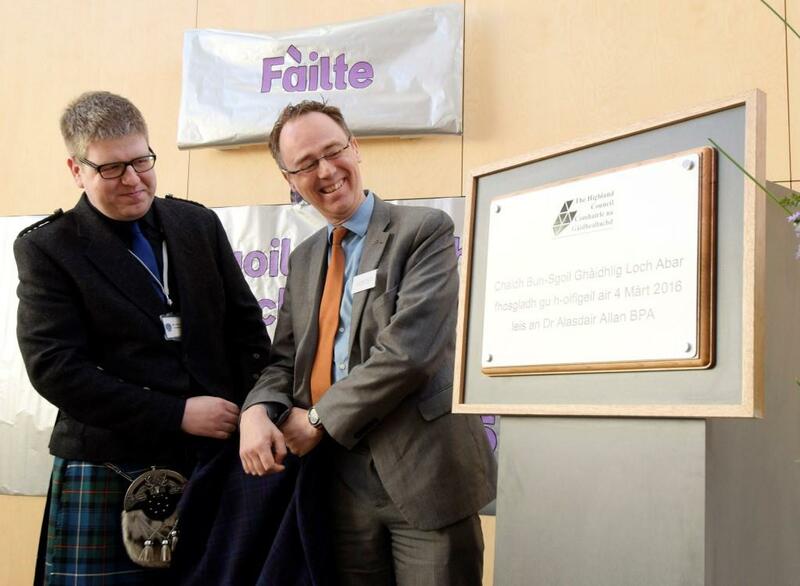 Dr Alasdair Allan MSP, Minister for Learning, Science and Scotland’s Languages, officially opened Bun-Sgoil Ghàidhlig Loch Abar today (4 March) by unveiling a plaque at the new school. 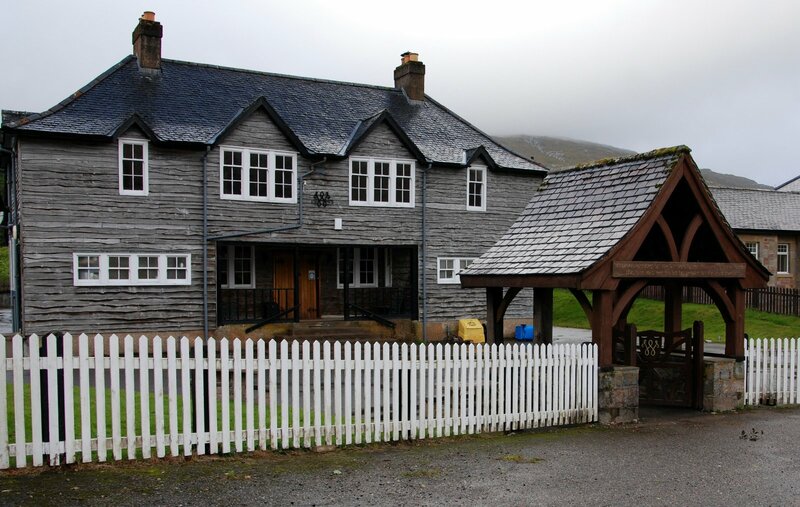 Former pupils and staff are being invited to an open day at the Margaret Carnegie Hostel in Portree, Isle of Skye on Saturday 5 March from 11am – 4pm. A chance to join the Inverness Caley Thistle team in training, a special art exhibition and opportunities for young people to shadow some of Highland’s senior public figures will be some of many ways. Police Scotland officers from the Stornoway dog handling section made a planned visit to Portree High School today. The Council welcomes the confirmation from the Scottish Government that the Council’s decision to close Inverasdale Primary School has not been called in by Ministers. FilmG, MG ALBA’s Gaelic Short Film Competition, has announced the shortlists for this year’s competition with budding filmmakers, community groups and school groups from around the country making the final cut. The Highland Council is ‘capping’ or limiting school rolls and reserving places in primary and secondary schools for the 2016/17 academic session. The Highland Council welcomes the confirmation today (25 January 2016) of Scottish Government funding to achieve a new building for Alness Academy. The Highland Council is to seek the views of local communities on the future of Dalwhinnie Primary School, which has been mothballed since the summer of 2012. 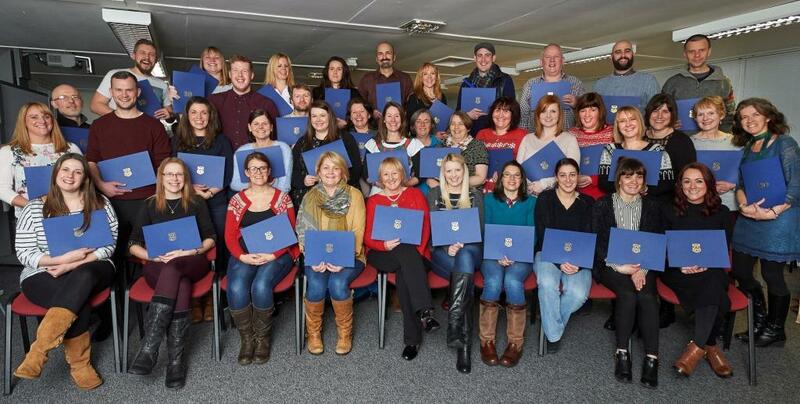 Around 50 staff in The Highland Council’s Care and Learning Service have recently completed training programmes aimed at encouraging generic leadership skills. Pupils at Strathconon Primary start their 2016 term with two new teachers after a successful campaign to recruit staff to the rural, 22 pupil school. Stuart Benjafield has been appointed as Teacher for Scoraig Primary School by The Highland Council. He takes up his post when Highland Schools re-open on 7 January 2016. 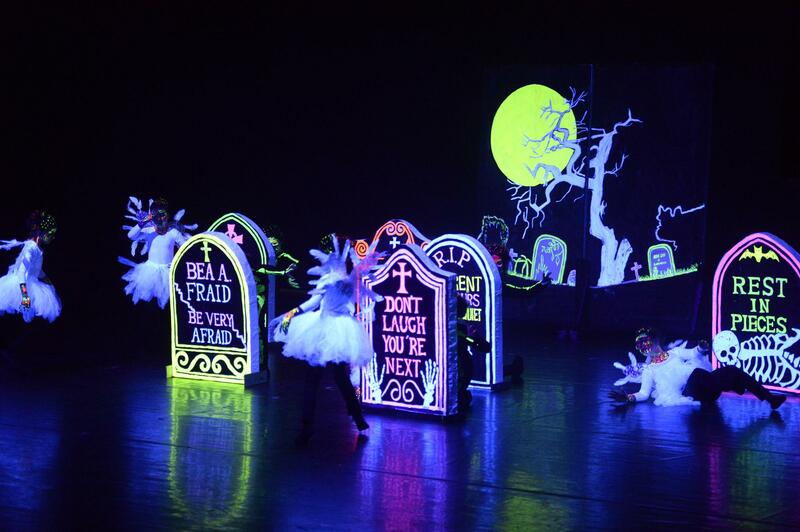 Millburn Academy wins bid for Year of Light competition funding. From 1 January 2016, two significant changes to the EMA programme will widen the net of those eligible for this weekly allowance. Members of The Highland Council have today (17 December 2015) agreed the proposal to discontinue the provision of education at Inverasdale Primary School, re-assigning the school’s catchment area to that of Poolewe Primary School. Alastair was chosen to represent Highlands as part of the new Scotland’s Young Ambassadors for Inclusion programme developed by Education Scotland. Chair of Education, Children and Adult Services Committee, Cllr Drew Millar is urging the Scottish Government to rethink their proposal to impose a minimum 25 hour primary school week. Pupils at an Inverness primary school have organised a Christmas shopping day on Wednesday 25 November with over 20 tables of festive wares for sale by businesses in and around Inverness, Nairn and further afield. Ross and Cromarty pipes and drums school are embarking on a 3 night mini tour of the Ross-shire area to bring the bands successful year to a close. A recommendation to discontinue education provision at the currently mothballed Inverasdale Primary School will be presented to the next meeting of The Highland Council on 17 December for Members’ consideration. Highland Council will be holding a Facebook chat on Wednesday 11 November on Care and Learning. The Highland Council Countryside Rangers are inviting people outdoors to enjoy an autumnal stroll at Merkinch Local Nature Reserve in Inverness during the afternoon on Saturday 14 November. Cllr Fiona Robertson will join learners, parents, carers and teachers to celebrate the opening of the new facilities at St Duthus School, Tain on Wednesday 4 November 2015. The Highland Council has appointed 6 new Head Teachers at schools in the Highlands. Tomorrow (20 October) The Highland Council will publish a Final Consultation Report into its proposal to discontinue the provision of education at Inverasdale Primary School (currently mothballed), reassigning its catchment area to that of Poolewe Primary. The Highland Council is to hold further dialogue with Head Teachers and stakeholders on proposals to enhance support for Head Teachers and create sustained management support in Highland schools. 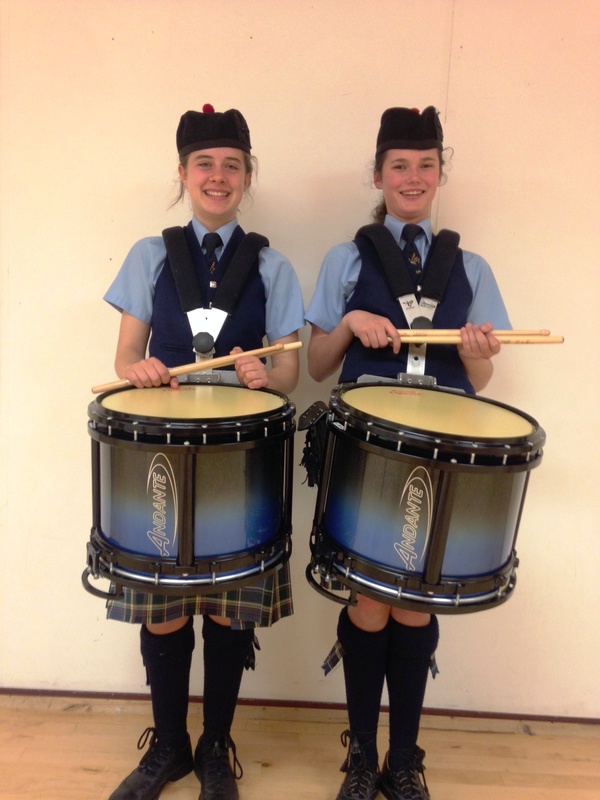 Four young drummers from the Highlands are heading to Glasgow to compete in the Pipe Band World Solo Drumming Championships on the 17th of October. Pupils at Hilton Primary in Inverness are eagerly looking forward to the arrival next week of the Healthier Scotland cooking bus. Councillor Drew Millar, Chair of The Highland Council’s Education, Children and Adult Services Committee, and senior Council officers including Director of Care and Learning, Bill Alexander met with the Scottish Government and other northern education authorities, at today’s teachers’ summit held in Aberdeen. Pupils from Hillhead Primary in Wick, took part in the national Marine Conservations Society’s Beachwatch project on Monday (21 September). 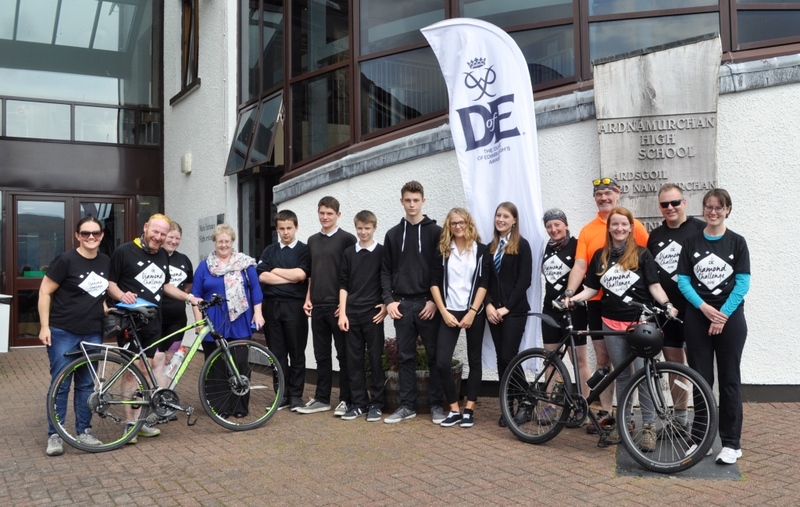 People living in Lochaber are being reminded that there is still time for them to cast their votes and get a share of £10,000 for their favourite projects to support young people in the area. The announcement of the preliminary rounds of the National Gaelic Schools Debate competition, formerly known as the BT Scotland Gaelic Schools’ Debate, has been made and the 2015 competition looks set to be another excellent year! Did you vote in last year’s independence referendum? Did it spark your interest in getting involved in your local area? 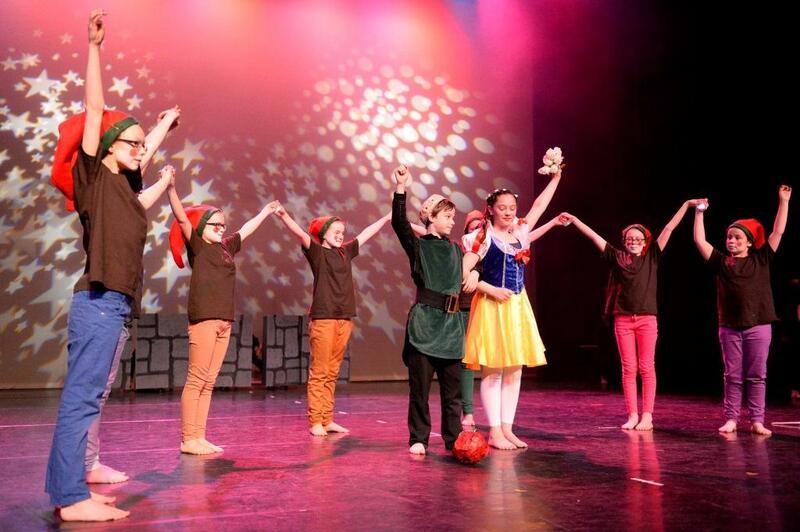 Entry day for the 2016 Be Your Best Rock Challenge® and J Rock™ tour fast approaches! 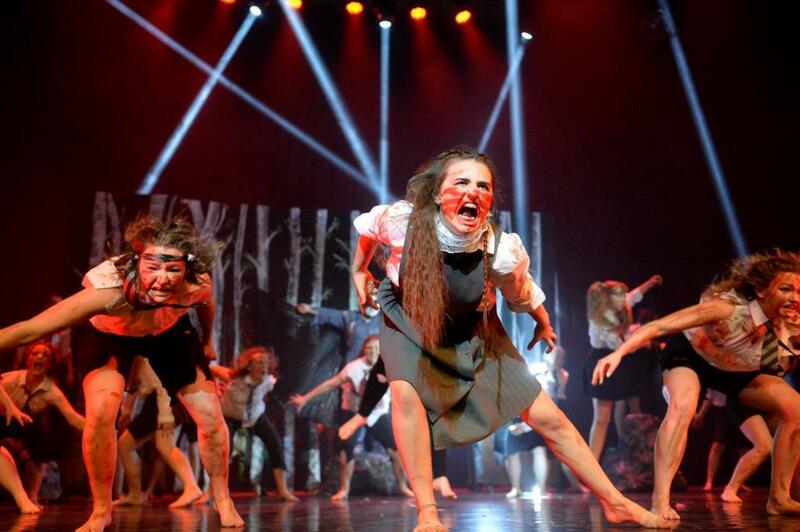 From 6am on Tuesday 22nd September Senior Schools, Academies and Sixth Form Colleges (6:30am for Junior and Primary Schools) registration will open to take part in one of the region’s most dazzling, high energy performing arts competitions as the Rock Challenge® and J Rock™ tour returns for 2016! 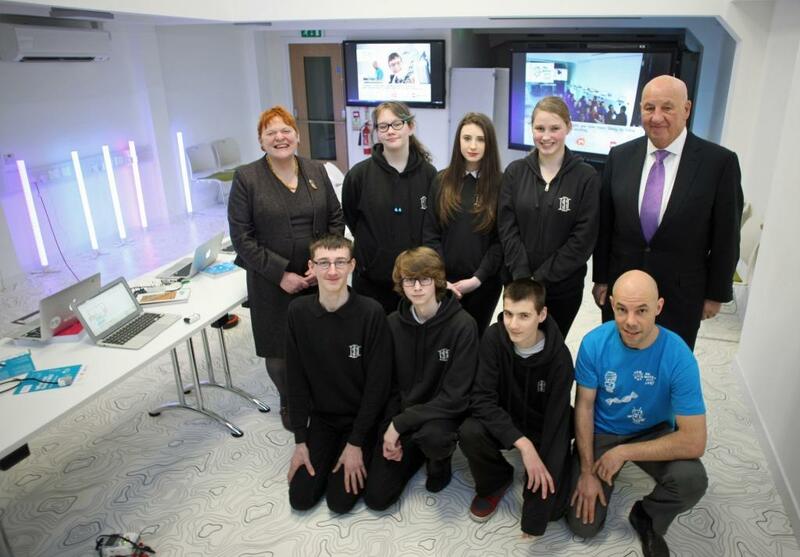 The progress of ICT learning by pupils at Wick High School is bucking national trends as more girls at the school take part in the “Apps for Good” programme and teams of boys and girls from the school win UK competitions. Members of The Highland Council’s Education, Children and Adult Services Committee have endorsed the Council’s existing policy across Highland regarding teacher/pupil ratios. Workers from construction and infrastructure company Morgan Sindall plc have unearthed a 121 year old time capsule while working for The Highland Council to replace the Ruthven Road Bridge on the outskirts of Kingussie in the Cairngorms National Park, Scotland. Children and parents are reminded how to stay safe going to and from school using “Stranger Smart”, an initiative launched in May, by The Highland Council and Police Scotland. 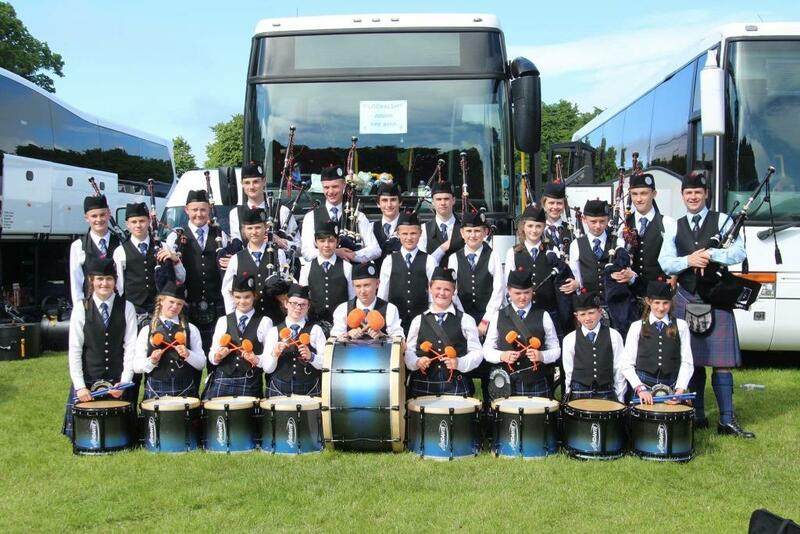 Twenty three East Ross school pupils who are members of Ross and Cromarty Pipes and Drum School (RACPADS) travelled south to the recent World Pipe Band Championships held in Glasgow and were judged to be eligible to compete in the final. 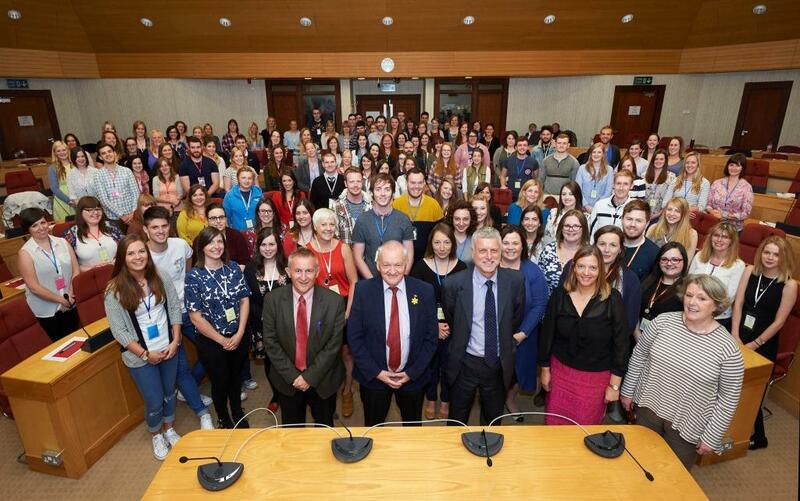 One hundred and twenty probationer teachers were recently welcomed to the Highlands (on Friday 14 August), at an induction course held in the Highland Council Chamber. Highland Council welcomes the announcement today by the First Minister that 5 local schools are going to receive additional funding as part of the Attainment Scotland Fund. A special topping out ceremony has been held to mark the midway point in construction of the new £34million Inverness Royal Academy. This term’s new Gaelic Classes in Inverness run by The Highland Council will start on Monday 31 August and will cater for everyone from those new to learning the language, to others who want to develop their skills. 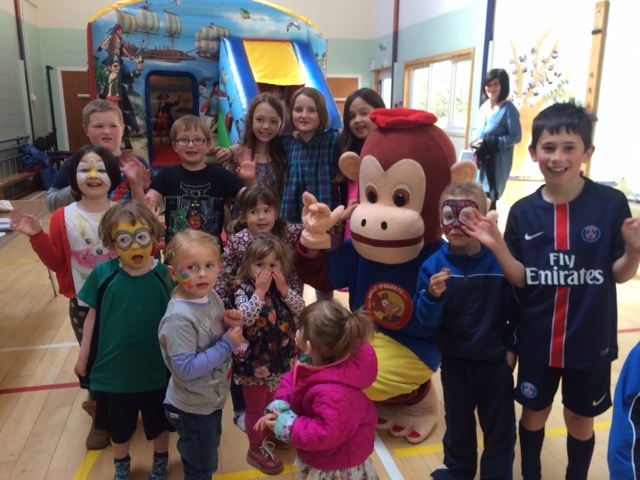 Children who attend the Gaelic Medium provision in Nairn’s Millbank School enjoyed a fun day of activities recently at Nairn Community Centre. The young people of Lochaber and organisations that support their activities are being urged to come forward with bids for a £10,000 cash pot giveaway. The deadline is nearing for members of the public to submit their views on the proposed closure of Inverasdale Primary School, which has been mothballed since the summer of 2012. 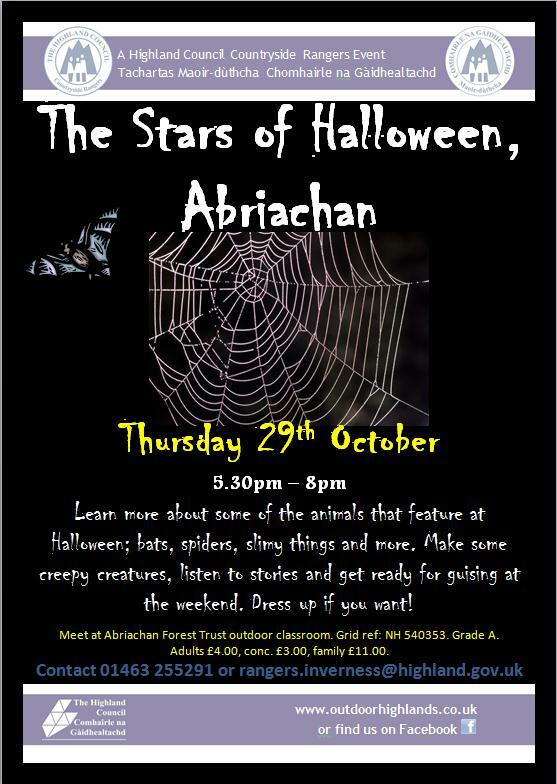 People are invited to take part in an event on Friday run by the local Countryside Ranger, to discover more about the bats found living in Nairn. Christopher Millar-Craig, Headteacher at Ardnamurchan High School said: "We are delighted at how well our young people have performed in their SQA qualifications this year. 32.1% of S5 pupils at Glen Urquhart High School have gained 5 Highers at A-D – the highest in the Authority. Farr High School, Bettyhill has congratulated students on their successes. Pupils at Fortrose Academy have proved themselves high achievers following this week's exam results. 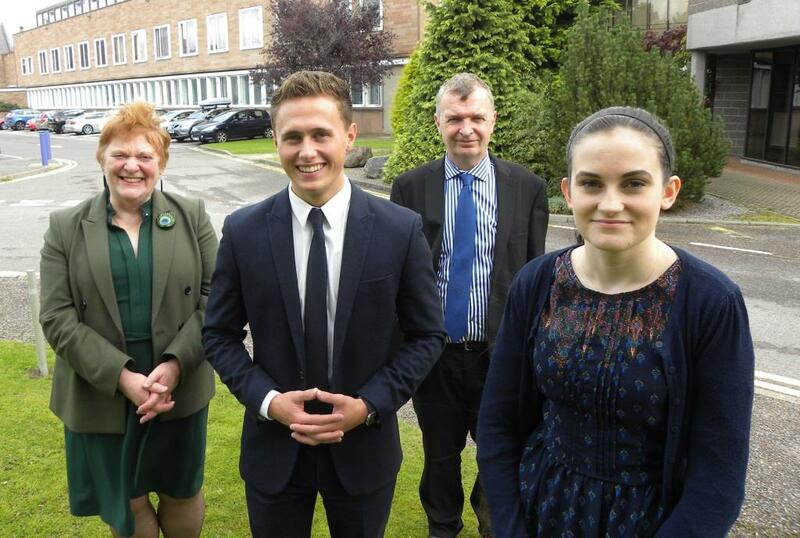 Highland pupils have again displayed a strong exam performance, as results are revealed. 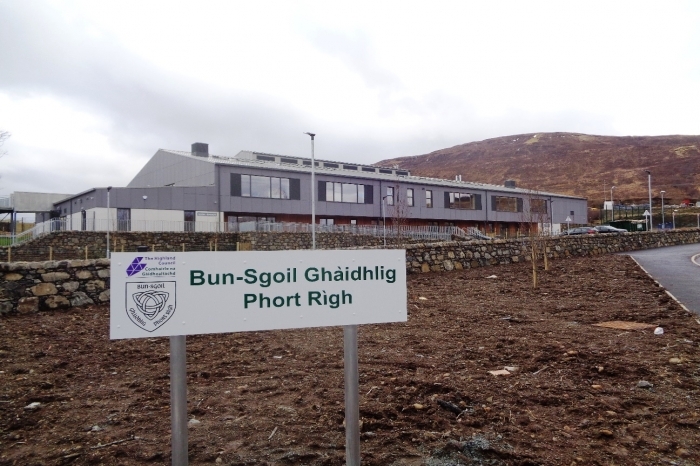 The Highland Council’s new Gaelic Primary School, Bun-Sgoil Ghàidhlig Loch Abar, located in Caol, Fort William will welcome pupils on Wednesday 19th August. 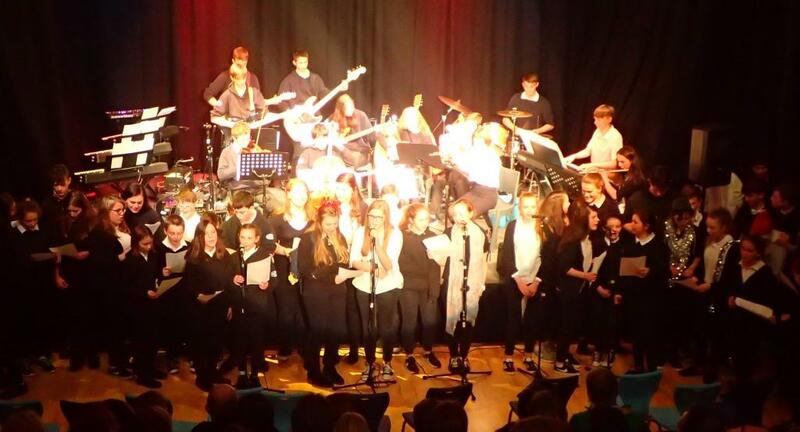 Before the end of school session, over 300 Primary school pupils gathered in Inverness Leisure Centre’s main hall to celebrate the success of Youth Music Initiative activities in Highland. 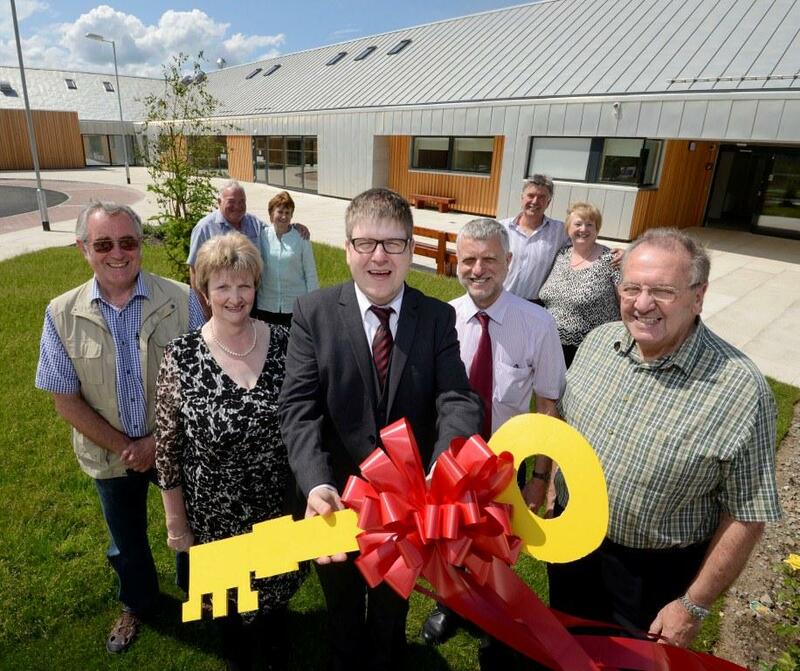 The new Head Teacher of the new Lochaber Gaelic primary school, Bun-Sgoil Ghàidhlig Loch Abar, received the keys to Highland Council’s second purpose built Gaelic school in the Highlands on Friday 3 July 2015. 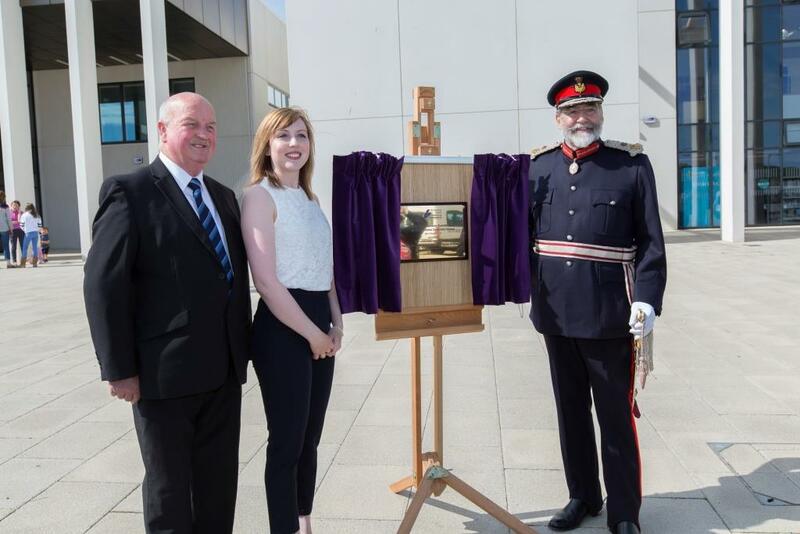 Following a £1.5 million refurbishment of Central Primary School, Councillor Drew Millar, Chair of Education, Children and Adult Services, reopened the two Victorian buildings at the school on 30th June. The Highland Council has recently made a number of new Head Teacher appointments in its mid and south education areas. The Highland Council has today informed the Parent Councils in Dunvegan, Edinbane, Knockbreck and Struan, that the School Closure Review Panel has refused consent to the closure of these four small schools in North West Skye, which would have allowed the building of a new purpose built school in Dunvegan. 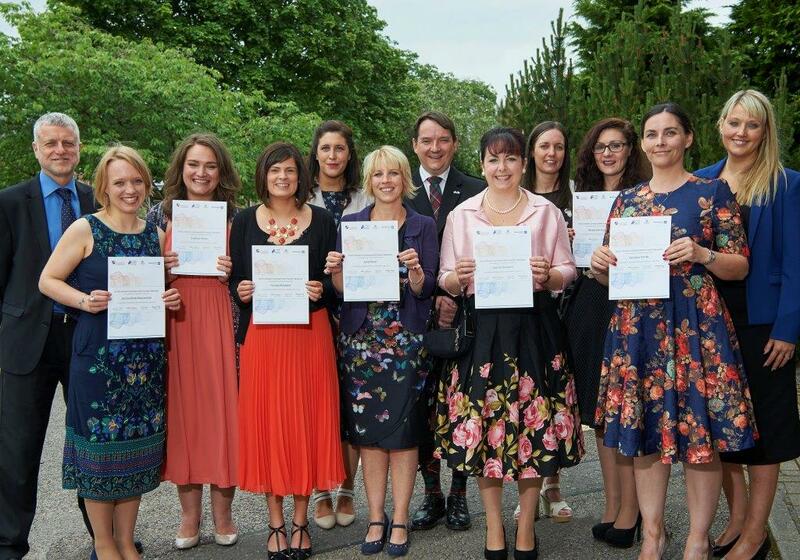 Sixteen Highland students graduated this weekend (Saturday 27 June) through the University of Aberdeen in partnership with The Highland Council following an eighteen month distance learning diploma in Primary Teaching. 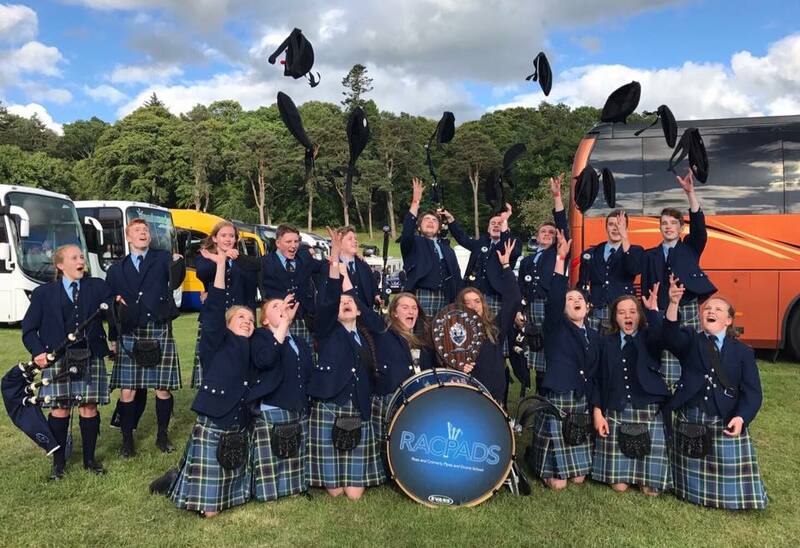 The Ross and Cromarty Pipes and Drum School (RACPADS) were delighted with their success in the European Pipe Band Championships which saw them come 6th out of 15 pipe bands in a tough category, to receive the Jim Baxter shield. The Highland Pipers Club is a group made up of pupils from Fortrose, Culloden and Nairn Academies, taught by The Highland Council’s Piping Instructor in these schools, Jim McGregor. Nairn Academy leaver, Matthew Campbell, excelled himself recently by achieving 97 marks out of 100 for his Grade 8 Trinity College tuned percussion exam. 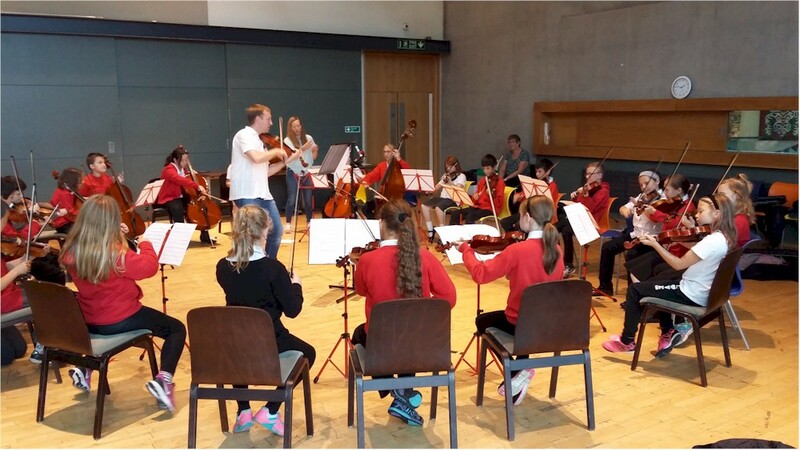 Eighteen pupils from Dalneigh Primary in Inverness spent last Tuesday working with American string specialist and project facilitator Terry Shade. 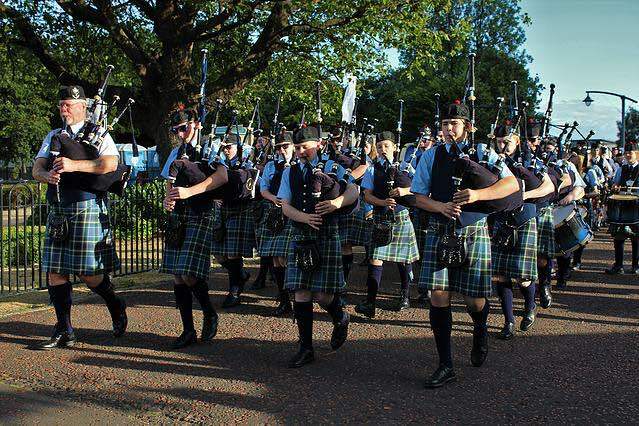 Last Friday (12 June) 31 pipers and drummers travelled from Ullapool and the surrounding area to Belfast, Northern Ireland to compete in the United Kingdom Pipe Band Championships held at Stormont Estate. The North’s only full-size youth symphony orchestra, Highland Regional Youth Orchestra (HRYO), is delighted to announce that Christopher George has been appointed as new Conductor of the group. 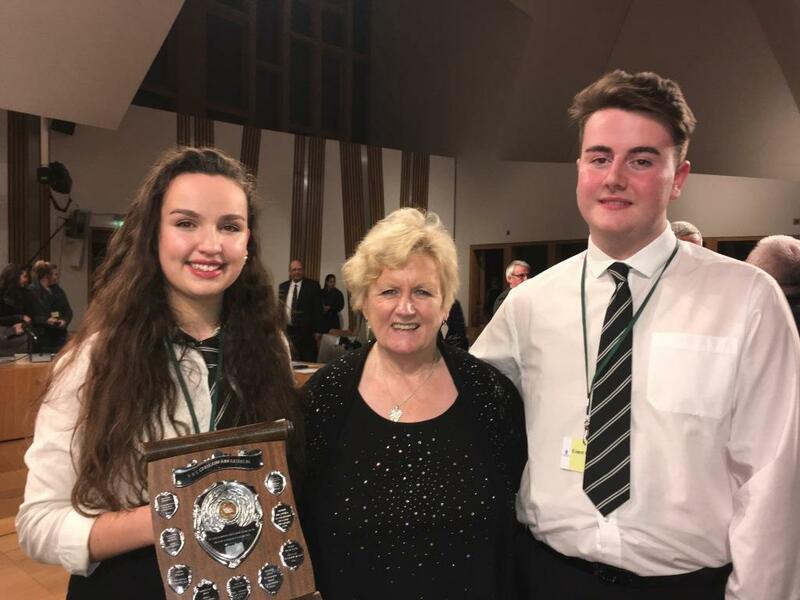 Abigail Millar-Todd, harpist and pupil at Fortrose Academy, was awarded Highland Young Musician of the Year 2015 at yesterday’s competition held in Inverness. 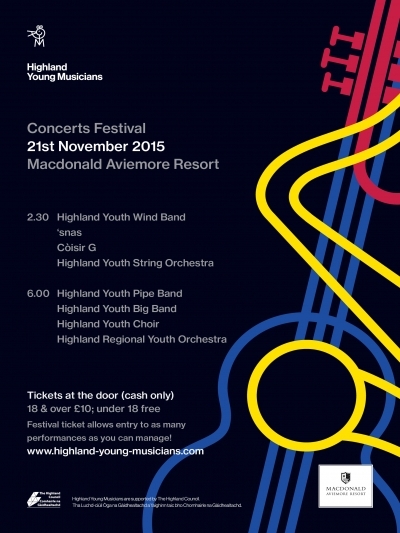 Twelve of the Highland’s most talented young musicians will gather at Eden Court’s Maclean Room on Sunday (14 June) as they complete for the title of ‘Highland Young Musician of the Year 2015. 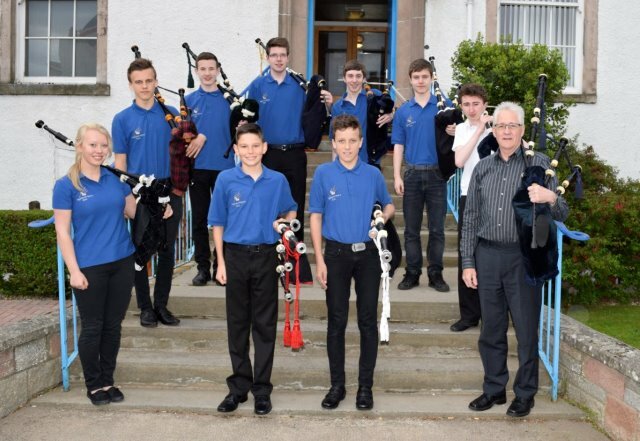 The Lochalsh Junior Pipe Band is gearing up for their debut at the European Pipe Band Championships in Forres on Saturday 27 June. The new head teacher of Lochaber Gaelic Primary School, Fort William, is Mr John Joe MacNeil. Last Monday, almost 200 Primary 7 pupils from across Lochaber learned the importance of staying safe as they make the transition from primary to secondary school. It’s Time to Rock as the 2015 Be Your Best Rock Challenge® Scottish Final heads to The Caird Hall in Dundee! 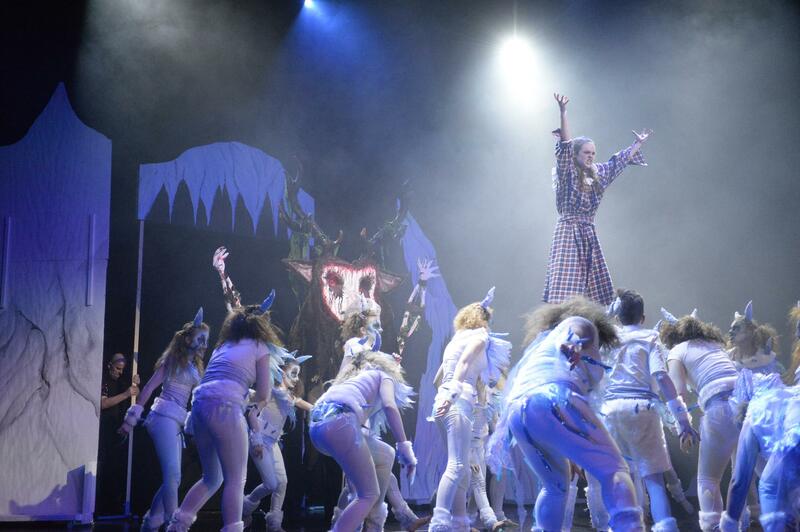 Since the Rock Challenge® heats in Inverness last month, two local schools from Ross and Cromarty have spent the last few weeks finalising their performances and will this week travel around 150 miles to The Caird Hall to compete in the prestigious Scottish Final. 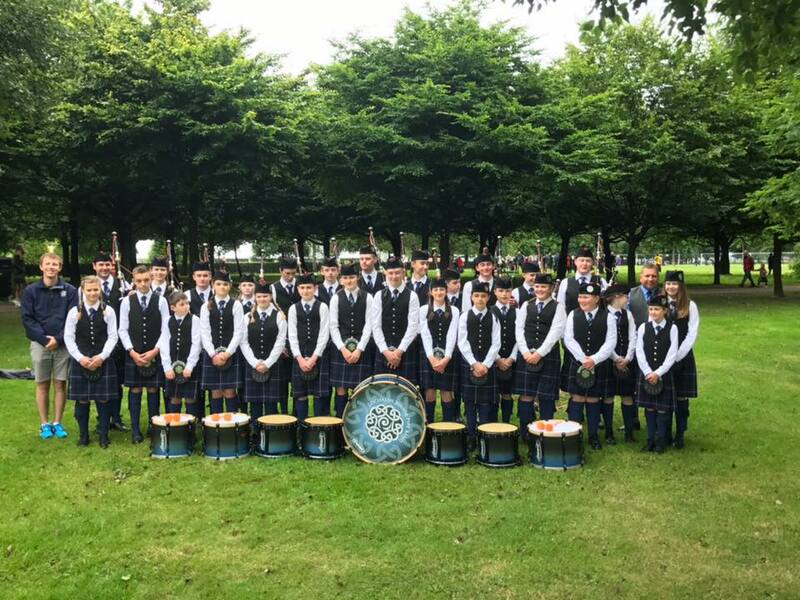 Sixty one young pipers and drummers from Wester Ross travelled down to Bathgate on the 29th May to compete at the British Pipe Band Championships. The new Head Teacher of Keiss Primary School in Caithness is Kathryn Laidlaw. She takes up her post in August 2015. Over 300 Primary school pupils will gather in Inverness Leisure’s main hall on Friday 5 June to celebrate the success of Youth Music Initiative activities in Highland. 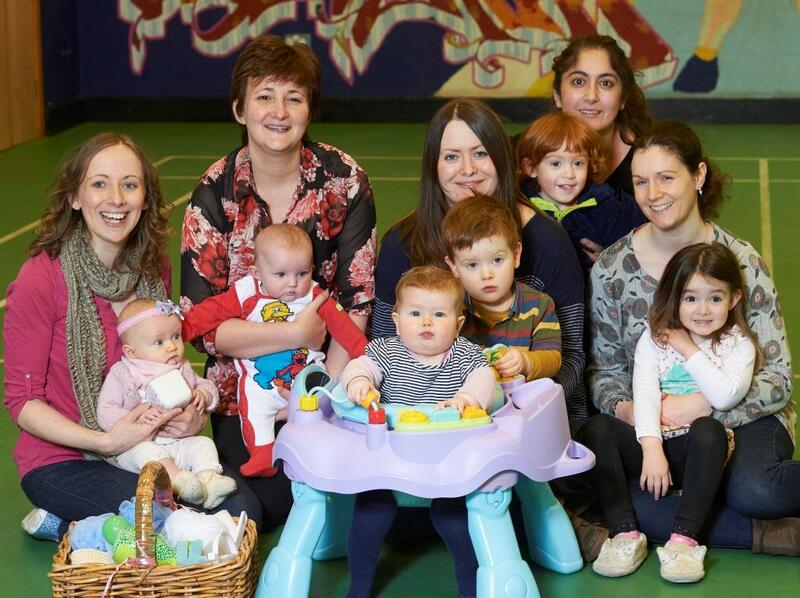 It is thirty years since the introduction of Gaelic Medium Education in Highland Council and now some of the very first pupils are returning with their own babies to their local Gaelic ‘Parant is Paisde’ groups. Inverness Royal Academy recently welcomed 22 students and 3 teachers from Collège Éric Tabarly in La Baule, France to Inverness on an educational exchange visit. Far reaching strategies for improving the success rate of Head Teacher recruitment in the Highlands are being devised by The Highland Council. The Highland Council is to seek the views of local communities on the future of Inverasdale Primary School, which has been mothballed since the summer of 2012. 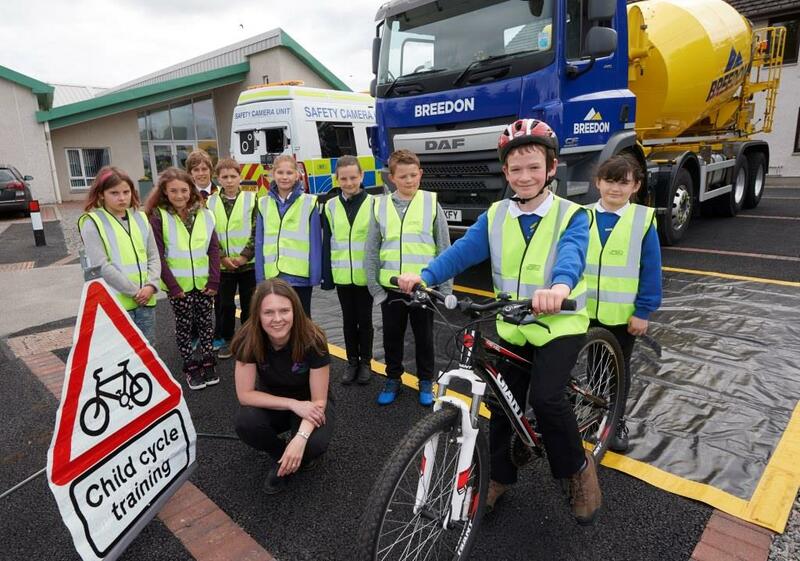 Young people and children in the Highlands can learn how to stay safe going to and from school thanks to a new project “Stranger Smart” launched today (20 May 2015) by Police Scotland and The Highland Council in Inverness. 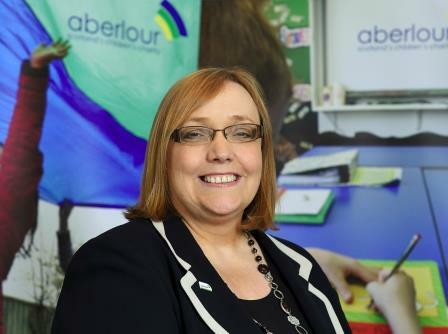 Miss Carol Divers has been appointed by The Highland Council as new head teacher of Ballachulish Primary school in Lochaber following interviews held on Monday 11 May 2015. 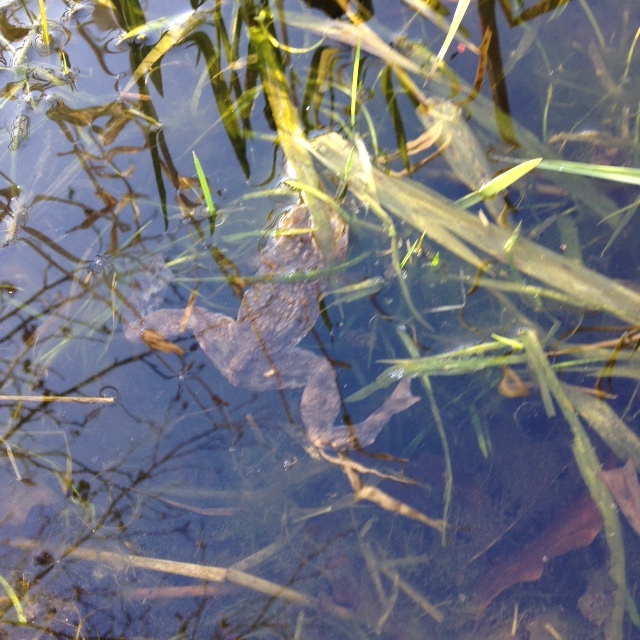 Anyone interested in amphibians, bugs and the sorts of beasties that may be found lurking around in water is invited to come along to a special free family event in Inshes Park, Inverness on Saturday 18 April. 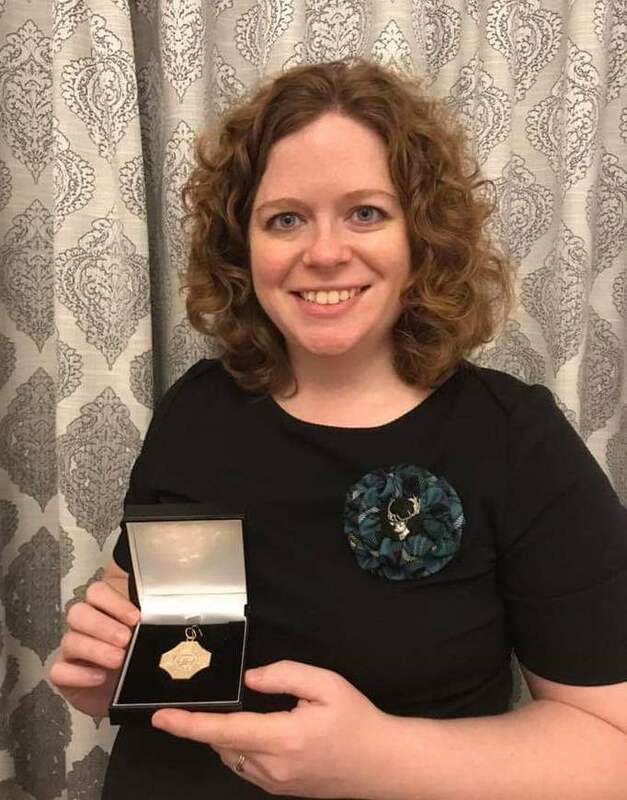 Miss Gemma Stewart has been appointed by The Highland Council to the post of Head Teacher for the Hill of Fearn Primary School/Tarbat Old Primary school cluster in Easter Ross. 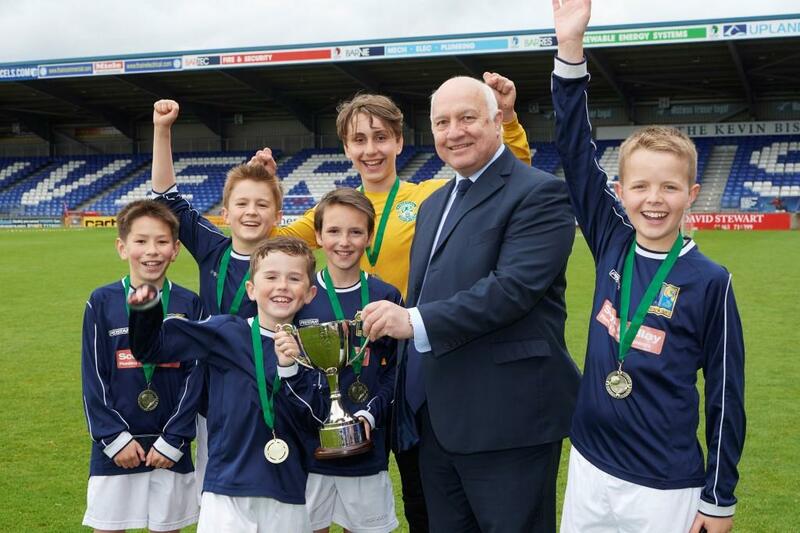 An Inverness Primary School team has won the Scottish Minibridge Championship. 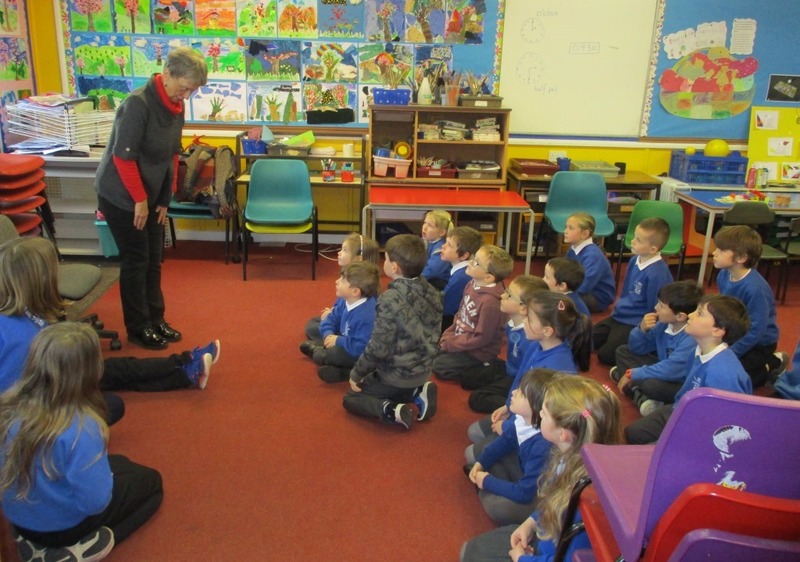 The Highland Council’s Gaelic Team recently organised three storytelling writing workshops at Lochcarron Primary School which were attended by both Gaelic Medium and English Medium Education pupils. The Scottish Cabinet joined the Children and Young People Regional Summit in Inverness this week (Mon 23 March) at the Ironworks venue on Academy Street. The 10th Highland Youth Parliament Apprentice Day is being held tomorrow (Tuesday, 24 March) with 20 young people from across the Highlands taking part. Earlier today (Tuesday 17 March) the Provost of Inverness Alex Graham was joined by pupils from Inverness Royal Academy to welcome a group of young Gaelic students from across the Atlantic to the Town House. The Highland Council will be writing to parents who have made placing requests for three primary schools, stating that rolls will be capped for the forthcoming school year. A very successful Gaelic Fun and Information Day organised by the Highland Councils Gaelic Team in partnership with Bòrd na Gàidhlig took place recently in the Fingal Centre Portree High School. Two primary pupils from Fort William gave an inspiring presentation to members of The Highland Council’s Education, Children and Adult Service Committee this week (11 Feb 2015) in Inverness. 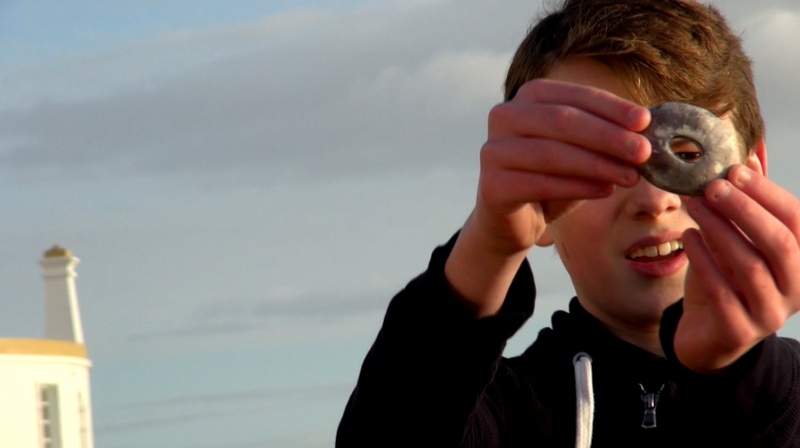 FilmG, MG ALBA’s Gaelic Short Film Competition, has announced the shortlists for this year’s competition with budding filmmakers, community groups and school groups from the Highland region making the final cut. During reports at yesterday’s Caithness and Sutherland Area Committee on both Dornoch Academy and Golspie High School, Councillors praised pupils and staff for their high attainment and achievement. The new Rector at Dornoch Academy is Miss Tina Stones, who was appointed on Thursday 5 February at the 258 pupil school. 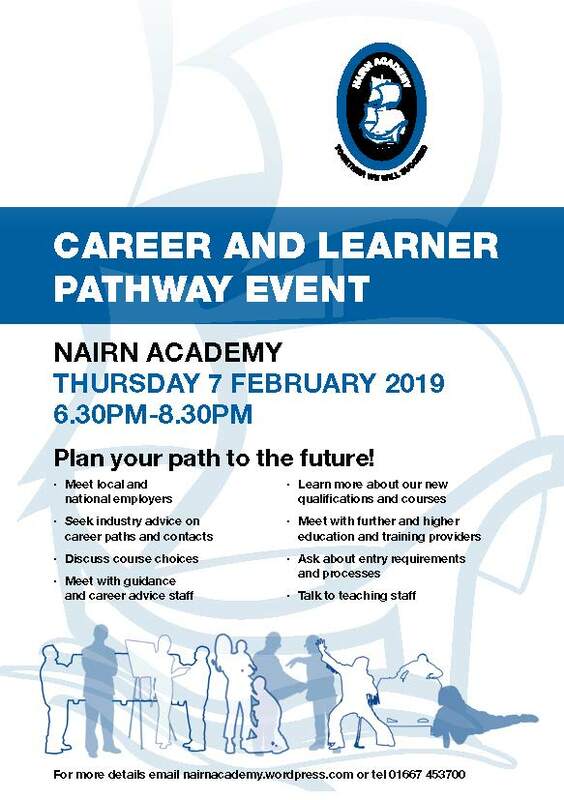 Senior pupils of Millburn Academy and their families are invited to attend a careers event at the Inverness secondary school on Wednesday 11 February 2015 at 6pm. An initiative which aims to help people achieve their aspirations of becoming teachers via flexible learning while working full time will welcome its second intake of students this week (Saturday February 7). 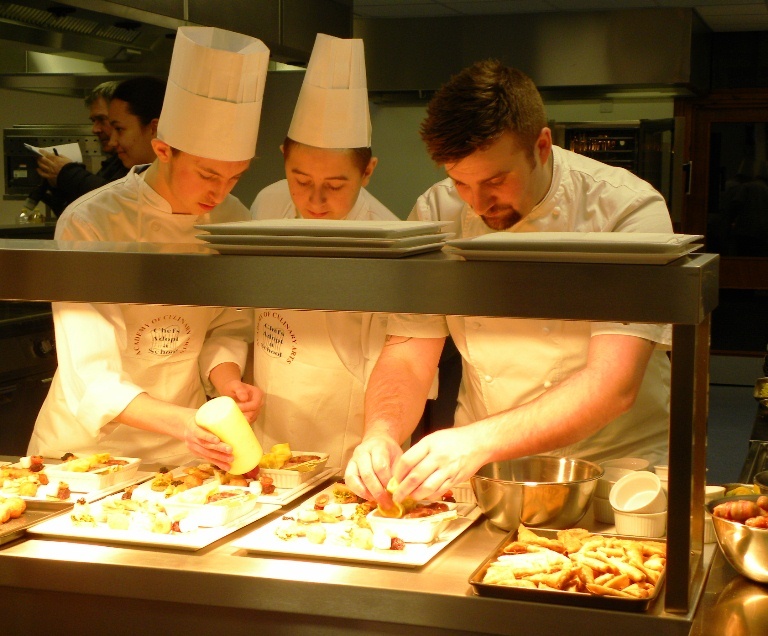 Charleston Academy’s Albert Roux Kitchen was officially opened on Monday 2 February 2015. The BBC Scottish Symphony Orchestra will become the first professional symphony orchestra to take up residency in Skye when they arrive en masse for three days this month. Final consultation report - new 3-18 community campus, Tain. The Highland Council has published a Final Consultation Report into its proposal to build a new 3-18 community campus in Tain. 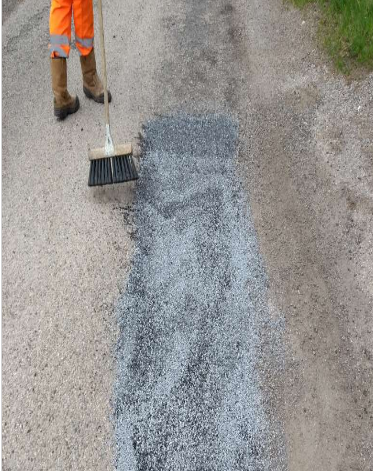 The A830 Fort William to Mallaig road outside Lochaber High School has re-opened and all school transport will be running as planned at 3.30 pm today. Police Scotland Highland and Islands Division, in conjunction with Highland Council Trading Standards, has issued a warning to householders to be vigilant of bogus callers following the recent stormy weather. Proposals to deliver the Scottish Government’s report on “Developing Scotland’s Young Workforce” in the Highlands have been welcomed by Members of The Highland Council’s Education, Children and Adult Services Committee this week. Highland Council Members have agreed the terms of reference for a review of the Facilities Management model which is being rolled out in schools across the Highlands. Members of The Highland Council’s Education, Children and Adult Services (ECAS) Committee have agreed to recommend to the Council to build a new community school in North West Skye at Dunvegan. Providing a free school lunch for every P1-3 child in Scotland is “an investment in our nation’s future”, according to Deputy First Minister John Swinney. 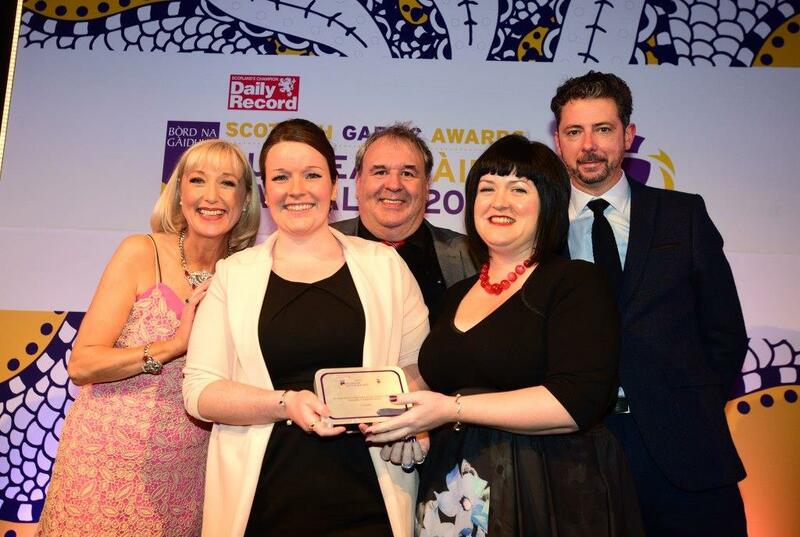 Cleaning staff responsible for looking after The Highland Council’s Care and Learning services’ toilets are been praised after scooping 7 national category awards, and 2 major national awards in the annual Loo of the Year Awards. With 20 facilities receiving platinum certificates and a further 23 gold, the Council was also awarded a Champions League Standards of Excellence Certificate. Parents and guardians of children are being informed by The Highland Council that it’s time for enrolment into primary school in the Highlands. The Highland Council is advising all parents and carers of Primary 1 to 3 children in the Highland area that they will be entitled to receive free school meals from Monday 5 January 2015. A team of young rowers from Gairloch High School have returned home victorious after winning the 2014 Scottish Indoor Rowing Championships. Members of the Caithness and Sutherland Area Committee paid tribute today to the Area Education Manager for the North, Graham Nichols for his dedication and commitment to developing sporting and cultural opportunities and activities in the North Highlands for the last 19 years. 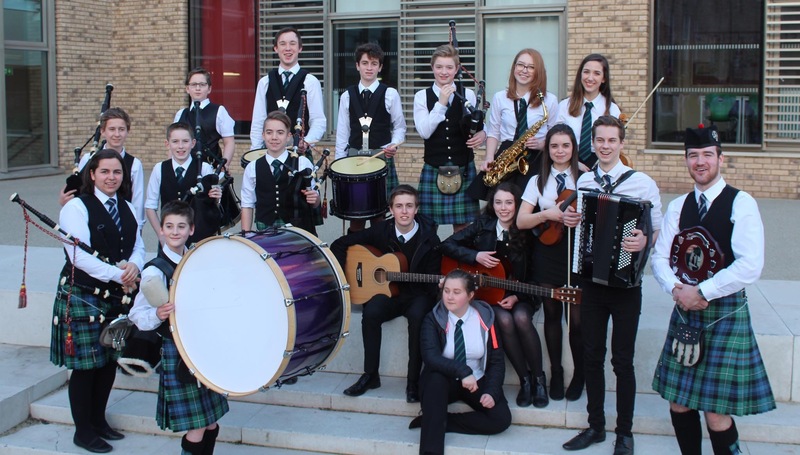 Gairloch High School folk group, "C for Craic" have been working hard towards producing their second CD featuring traditional tunes and Gaelic & English songs. 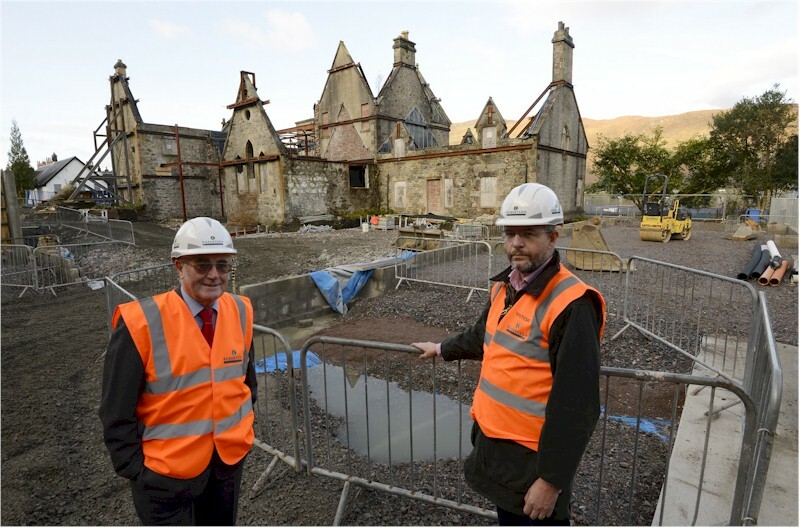 The Highland Council has taken further steps to improve the way in which it communicates with local residents and stakeholders regarding the building of the new Gaelic School in Caol, Fort William. A special Youth Ward Forum featuring young people from Lochaber will take place in Caol Community Centre on Tuesday (2 December). 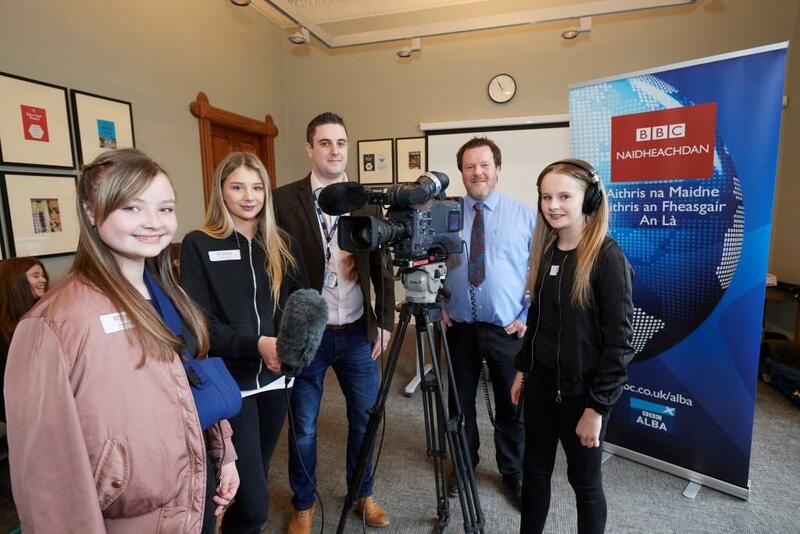 Well done to Ardnamurchan High School S4 pupils Charlie Anne-Pleming and Rona Nicolson who travelled to Stornoway to take part in the BT National Gaelic debating competition recently. Pupils, parents and carers are being asked to make their views known on Highland Council’s schools meals service. Gaelic pupils, both learners and fluent speakers, in S2 and S3 from schools across the Highlands will be attending a Gaelic careers event in Inverness tomorrow (Friday 31 October) aimed at encouraging them to consider job and training opportunities using the language. The Highland Council is able to confirm that following the completion of repairs at Inverness Royal Academy the school will reopen to all staff and pupils next week. The final report in relation to the statutory consultation on school provision in North West Skye will be considered at the Education, Children and Adult Services (ECAS) Committee of the 14th January 2015. 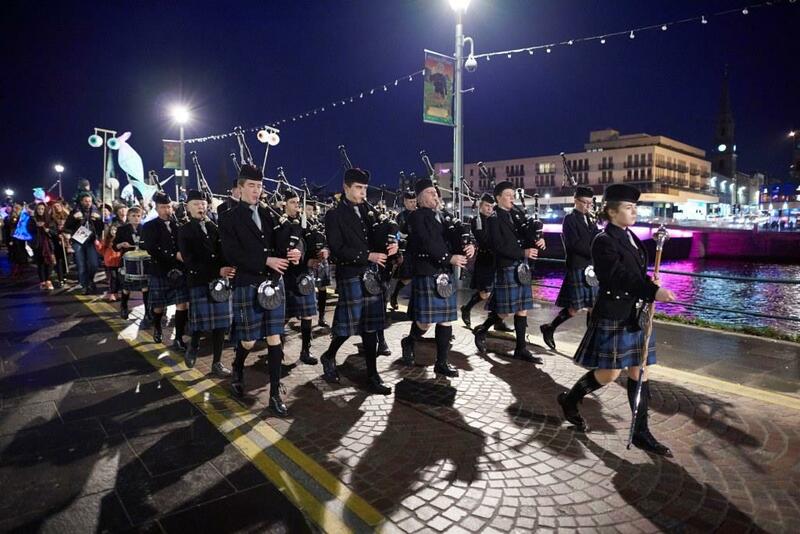 Following nine days of exciting competitions and phenomenal performances, Am Mòd Nàiseanta Rìoghail (The Royal National Mòd), has been hailed a huge success. The Highland Council has appointed Mrs Annie MacPhee as Acting Head Teacher at Bun-sgoil Ghàidhlig Inbhir Nis. Mrs MacPhee, a fluent Gaelic speaker from Lewis, has been seconded from her current post as Support for Learning Teacher at Glenurquhart and Beauly Primaries. The Scottish Ensemble, the UK’s only professional string orchestra, will be visiting the Highlands in October to host a special day of tuition for young musicians in Inverness. 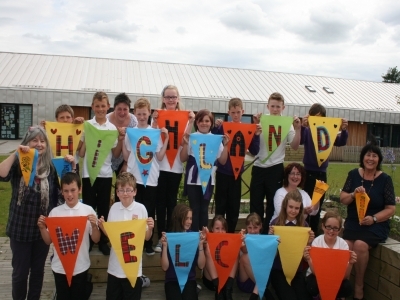 Highland pupils go back to school tomorrow (Tuesday 19 August 2014) following a teachers’ in-service today (18 August). Highland Council has moved to reassure local residents in Caol that an internal review of the new £7 million Gaelic school currently under construction in Lochaber, has confirmed that correct planning processes have been followed. Exam candidates across the Highlands got their results by text, email or by post this morning. The main construction contract for the new £15.4M Noss Primary School in Wick has been signed. The site, on the existing North Primary School campus, is already cleared and ready for the foundation work to begin. The main contractor is Miller Construction. Now is the perfect time for Inverness youngsters to move into the construction industry, according to a Highland councillor. Deputy First Minister Nicola Sturgeon today broke the ground on the new £48.5 million Wick Community Campus. Ross-shire swimming star Matthew Paterson has proved to be a Great Briton after winning gold and silver medals at the 2014 Special Olympics in the USA. 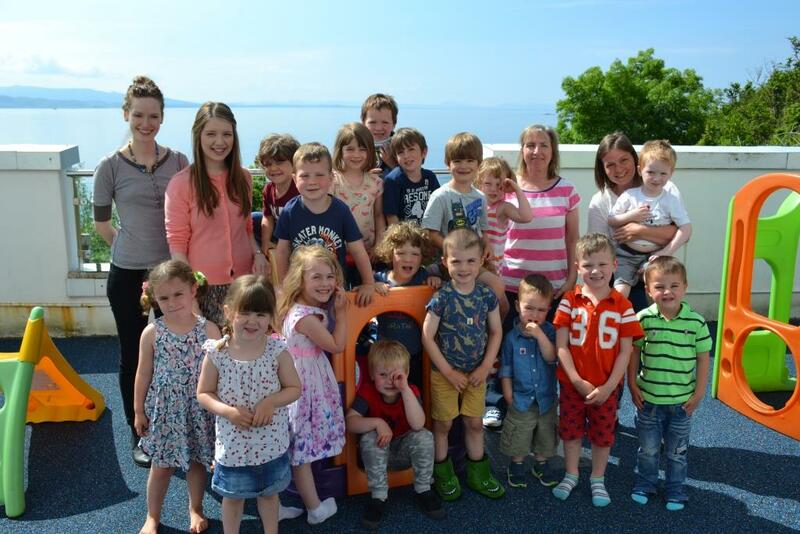 Primary school pupils from Inverness gathered to say a big thank you to the area’s tiniest teachers at a Baby Celebration held by Action for Children Scotland and Highland Council yesterday [Tuesday, June 24]. A Gaelic Class has started up in Thurso, which is specifically aimed for the parents of Gaelic Medium children in both pre-school and primary provision. 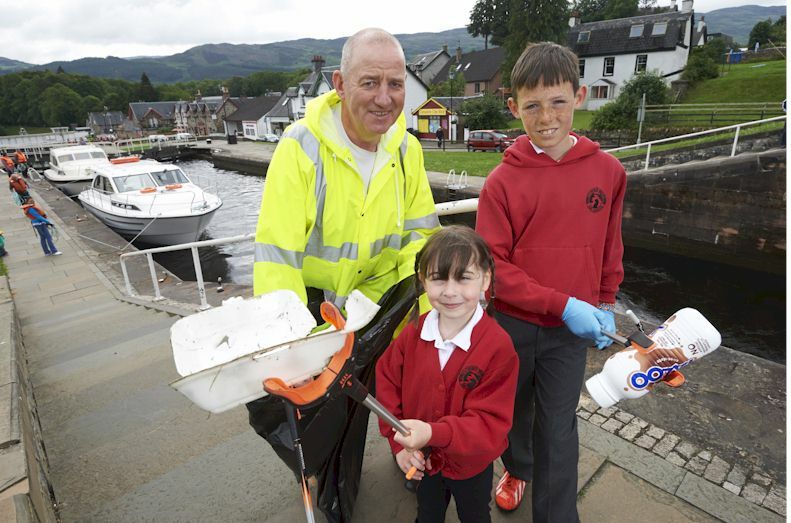 Primary school children in 10 local primary school are busy creating a colourful Highland welcome for the Commonwealth Games Queen’s Baton relay celebrations which will take place in Dingwall Jubilee Park on Friday 11 July. Eight of the Highland’s most talented young musicians will gather at Kingsmills Hotel in Inverness on Sunday 29 June as they complete for the title of ‘Highland Young Musician of the Year 2014’. 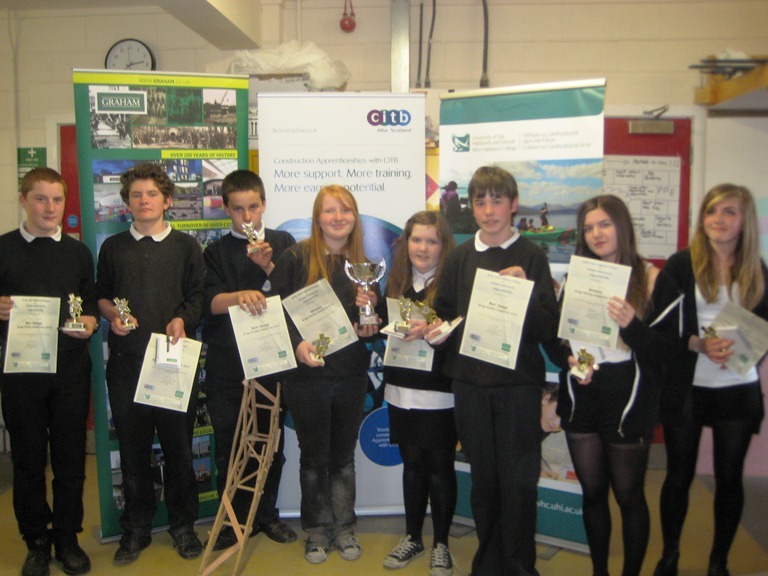 A team from Ardnamurchan High School have won the Lochaber finals of the Construction Bridge Building Challenge. Molly Westbrook, 14, from Grantown Grammar School got to see first-hand how the current Love Your Clothes campaign shoot was put together after she was chosen by Zero Waste Scotland for writing a blog through Young Scots Rewards. A group of Highland primary school pupils have proved they have what it takes to become Scotland’s renewable energy experts of the future. A consultation has begun to find a site for the proposed new 3 – 18 school campus in Tain. A multi agency information sharing event about teenagers being as safe as possible in the choices they make is being held in Millburn Academy on Tuesday 24 June. Hundreds of young musicians across the Highlands are busy rehearsing for public performances over the next two months that will showcase their talents and entertain thousands of people. 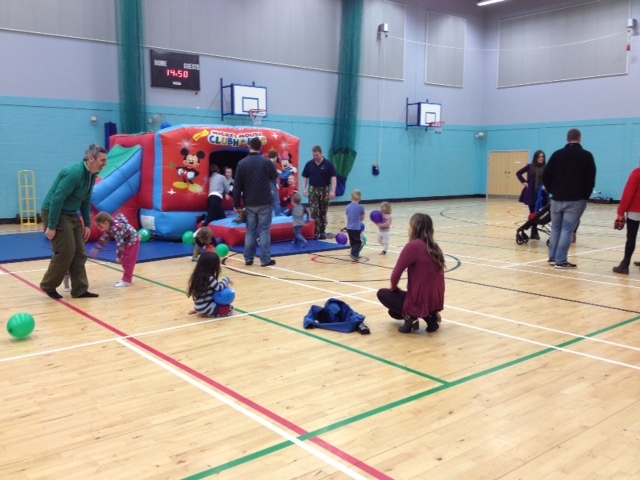 The Highland Council in association with Gaelic organisations; Comann nam Parant and Bòrd na Gàidhlig ran a very successful Gaelic Fun and Information day last Saturday, at the Fingal Centre in Portree. 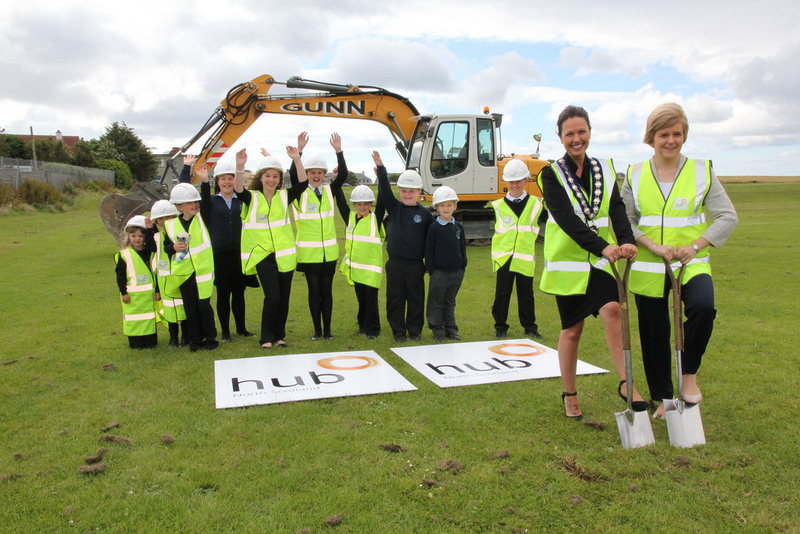 Turf cutting ceremonies are being held today (Thursday 29 May) in Fort William to mark the start of construction on two new schools for The Highland Council. An Inverness-shire school is just one step away from claiming the coveted 2014 Junior Saltire Award after seeing off competition from a record number of entries. 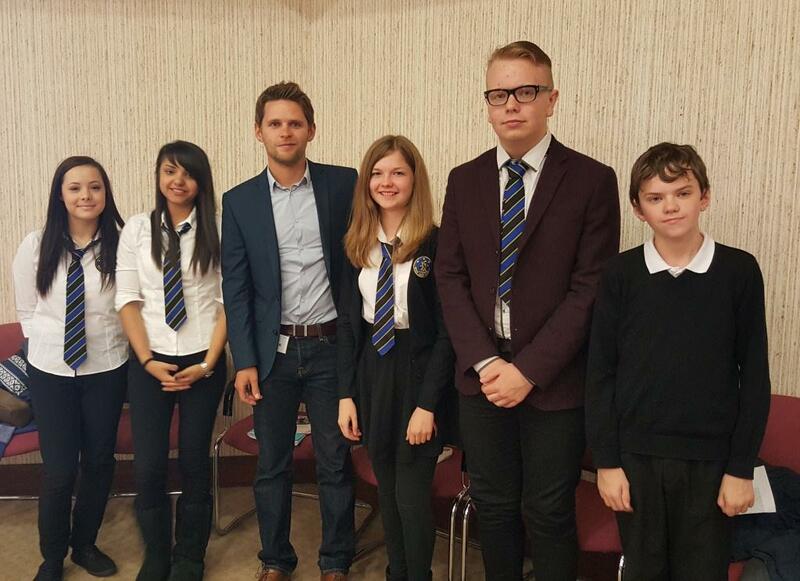 Inverness pupils get off their marks to receive national travel survey prize. Lucky pupils at two Inverness schools are to receive a prize experience with a difference tomorrow for their efforts in taking part in the Sustrans Hands Up Scotland survey since 2008.
ssued by Police Scotland Following four days of speed checks outside schools, Police Scotland Highlands and Islands Division are pleased to report a high level of compliance from road users. The Highland Council is this week launching a recruitment drive for 140 extra nursery staff as it prepares to implement an increase in childcare provision from August 2014. Tribute paid to Millburn Academy pupil. The Rector of Millburn Academy, Inverness has paid tribute to a fifth year pupil, Lewis MacPherson who died on Monday (21 April). Mr Hugh Fraser, the Director of The Highland Council’s Education Culture and Sport Service, has announced his intention to retire later in the year. Members of Wick High School have been regularly working with the local Highland Council countryside ranger at Newtonhill Croft Woodland over the last 6 months. Over 180 Primary 6, 7 and 1st Year boys from schools across the Highlands were in fine voice when they met up in Eden Court yesterday. The Highland Council has appointed Mr Mark Elvines to the post of Head Teacher of Drummond School, Inverness. 90% of pupils at Kinlochleven High School in South Lochaber turned out to vote in a mock referendum on Scottish independence held at the school on Friday 4 April. The Highland Council has awarded a contract to build an additional 3 classrooms at Milton of Leys Primary School in Inverness at a cost of £650,000. The latest topping out ceremony at Lochaber High School took place earlier this week. 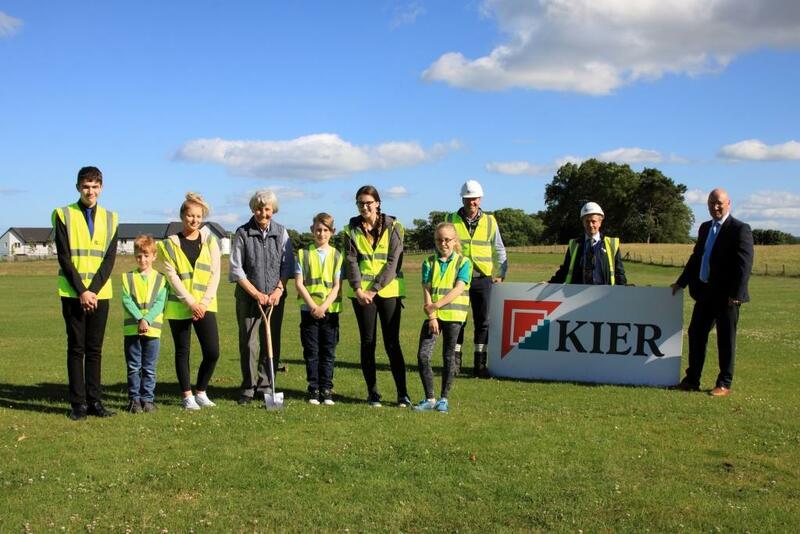 The Highland Council has appointed Kier Construction to deliver the third and final project in the Council’s programme of new primary schools for the Fort William area. 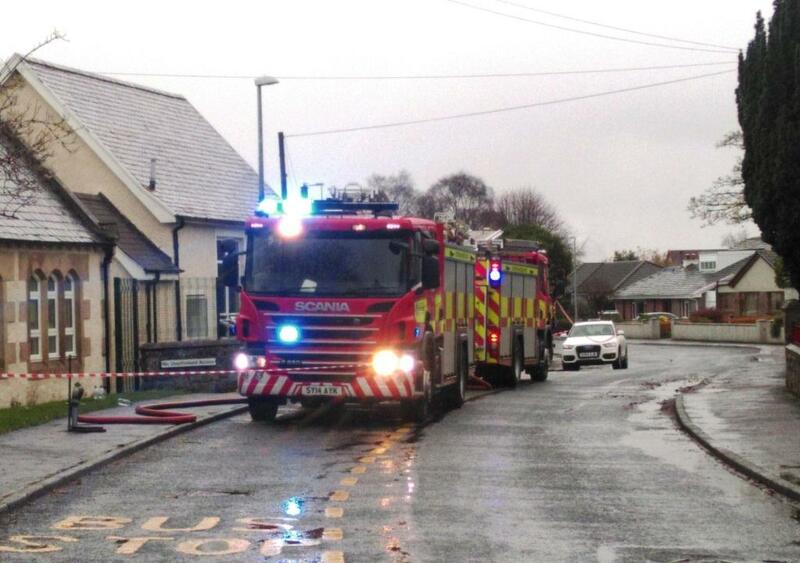 Police liaison operation gives Kingussie High School the all clear. Work is due to start shortly on a £1.5 million refurbishment project at Central Primary School in Inverness. A new leadership group has been set up to drive forward a Highland Science Academy that will be a catalyst for bringing new jobs and ground-breaking educational and IT advances to the region. 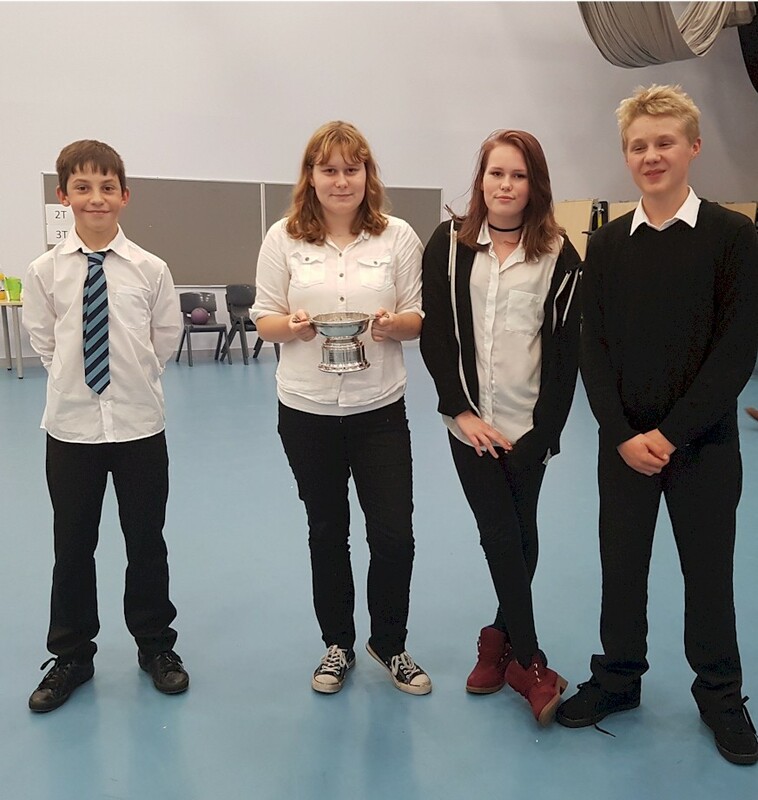 Alness Academy has once again, for the third year in a row, come out tops by winning at the UK finals of the National Science and Engineering Competition. Gaelic teacher Mrs Joanne MacIntyre from Mabou, Cape Breton, and six of her Gaelic students were visiting as part of cultural, linguistic and educational trip to Scotland. The price of a primary school two course traditional lunch will increase to £1.95 and for secondary schools to £2.15. Around 40 young people from Highland secondary schools attended a careers event in Inverness College UHI today (Thursday 13 March 2014) to learn more about career opportunities in IT. 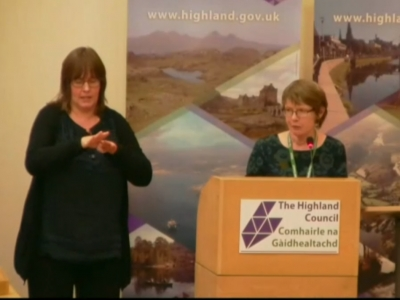 The Highland Council welcomed Gaelic visitors from across the Atlantic this week. 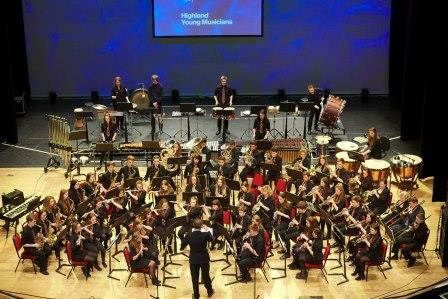 All talented young musicians attending Highland Council schools are currently being invited to apply for membership of one of the Highland Young Musicians eight regional music groups. The Ross and Cromarty Pipes and Drums school band have come out tops in their first ever appearance at the National Schools Pipe Band Championships. A £250,000 project to refurbish four classrooms at Inverness High School will begin in June after the contract was awarded by The Highland Council to Morrison Construction, Inverness. Crown Primary School has won a place in the grand final of the Scottish European Trust’s Euroquiz, to be held in May in the Scottish Parliament Debating Chamber in Edinburgh. 86.1% of pupils at Dornoch Academy turned out to vote in a mock referendum on Scottish independence. Following a request from Wick High pupils, The Highland Council has installed new Recycle on the Go bins at the entrance to the school. An international performing arts competition for schools and colleges which focuses on driving home positive messages about substance misuse and crime prevention is being held at Eden Court. The Highland Council has launched an online survey as part of the Sustainable School Estates Review (SSER) in North West Skye. A turf cutting ceremony was held today (Tuesday 25 February 2014) to mark a start to work on a new £15 million primary school which will serve communities to the north of the River Wick. The Highland Council is organising dedicated In-Service events for both Gaelic Primary and Gaelic Secondary school Teachers on 21 February, at the Caledonian Stadium, in Inverness. Highland parents and families are to benefit from the introduction of 600 hours funded early learning and childcare from August this year. Seven new projects totalling £800,000 of expenditure on repair and replacement works in seven Highland primary schools have been approved . Members of The Highland Council’s Adult and Children’s Services Committee have welcomed the Council’s intention to award the third and final contract in the Council’s programme of new primary schools for the Fort William area. 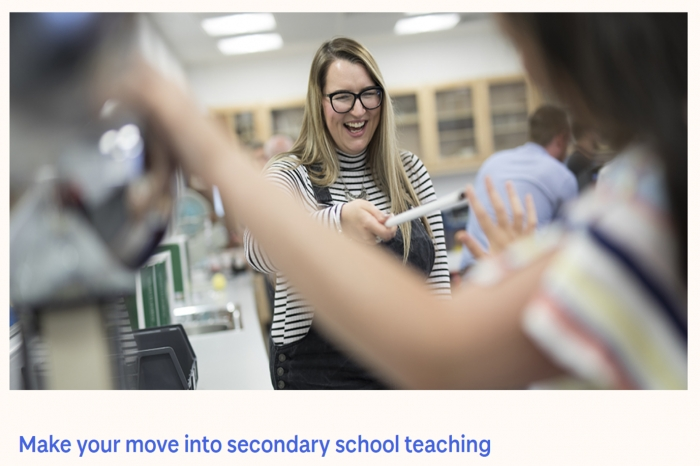 The initial success of an advertising campaign to recruit supply teachers for Highland Council schools has resulted in the local authority running a second recruitment campaign. Winners of The Highland Council’s Neil Gunn writing competition 2009 were announced today (Tuesday 23 June) at a prize-giving ceremony held at Inverness Town House. Last year, there were 12,500 pupil days lost in Highland schools due to holidays taken in term time.